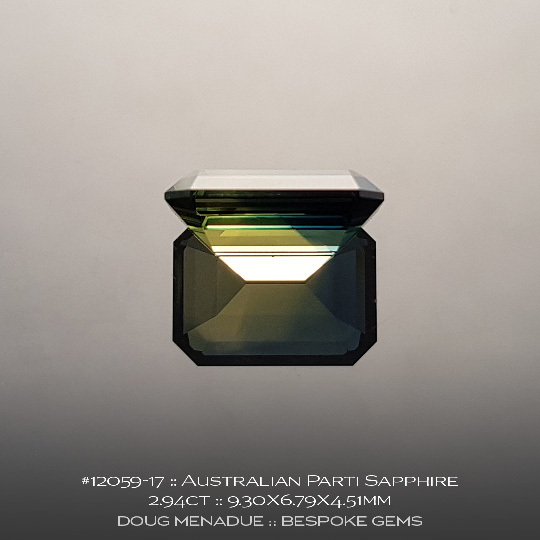 Comments : This magnificent gemstone is an Australian black sapphire. 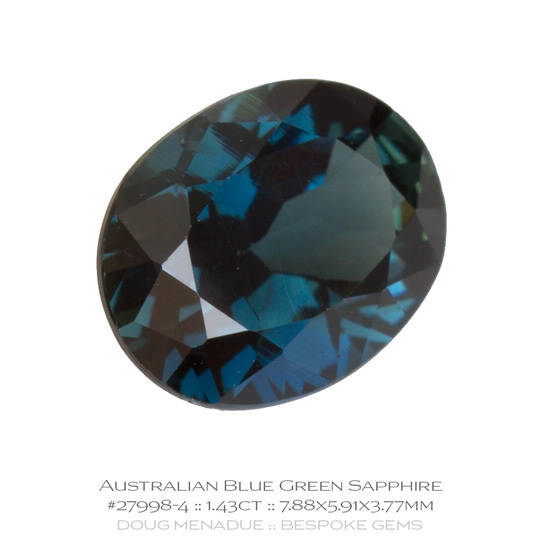 It is a big stone, eye clean and untreated, just as it came from the earth. 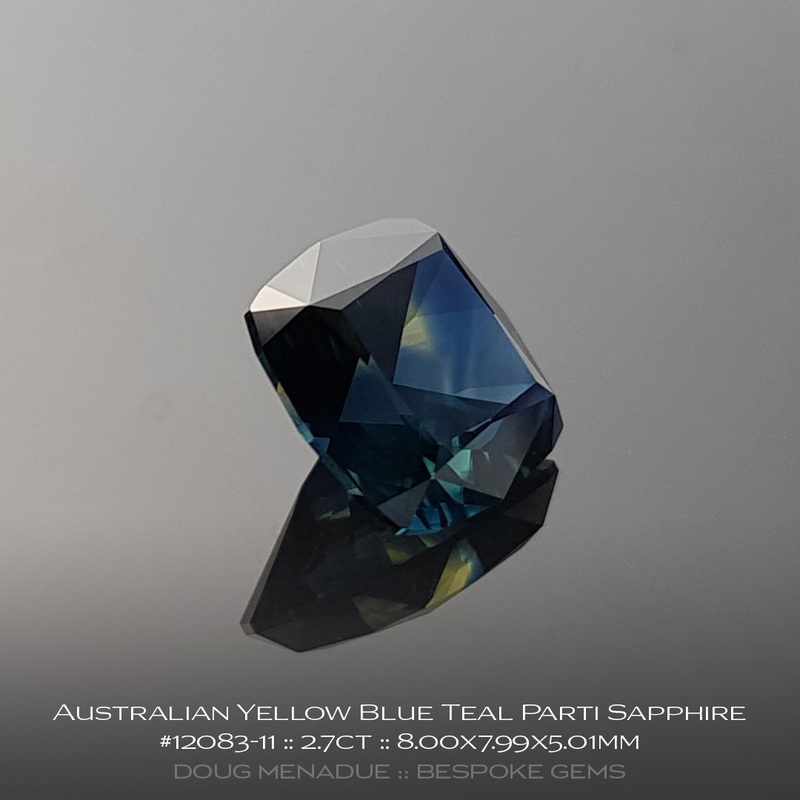 The colour of this stunning sapphire is actually a very deep blue, so deep that it becomes what is known as a "black" sapphire. 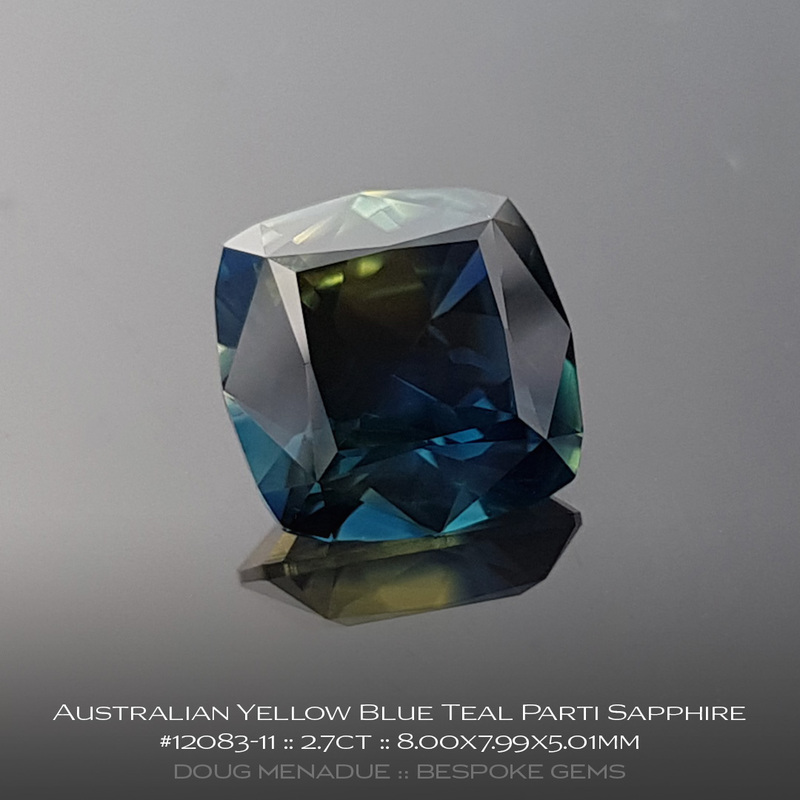 It still retains flashes of the deep rich blue colour especially under lights and when viewed in the hand you can see into the stone and note the blue colour. It is not opaque like black spinel or black jade. 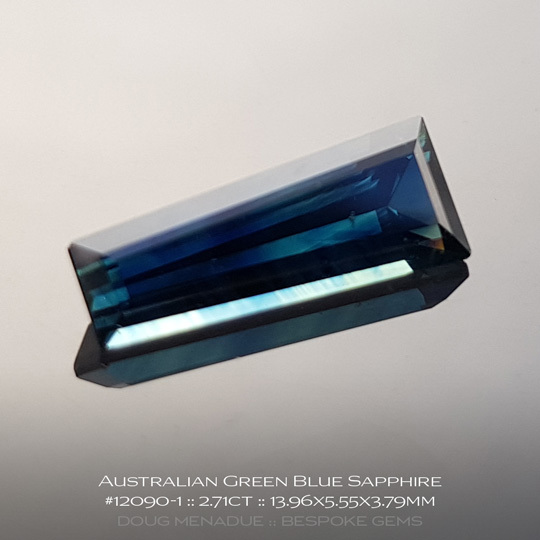 It is transparent like any other high grade sapphire. This black sapphire is part of an old time digger's collection that he built over the years and it now being put up for sale. 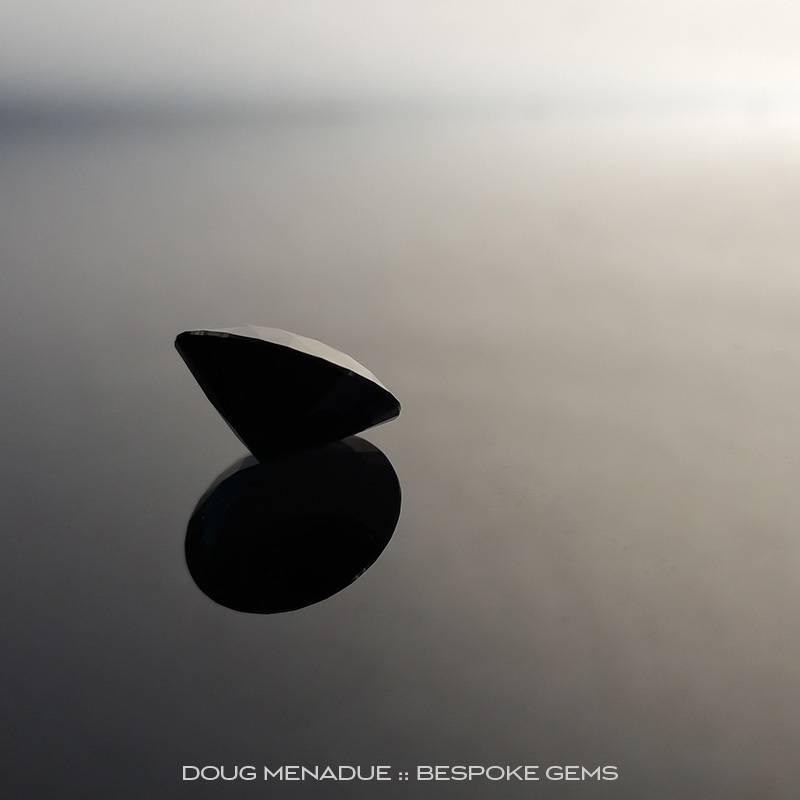 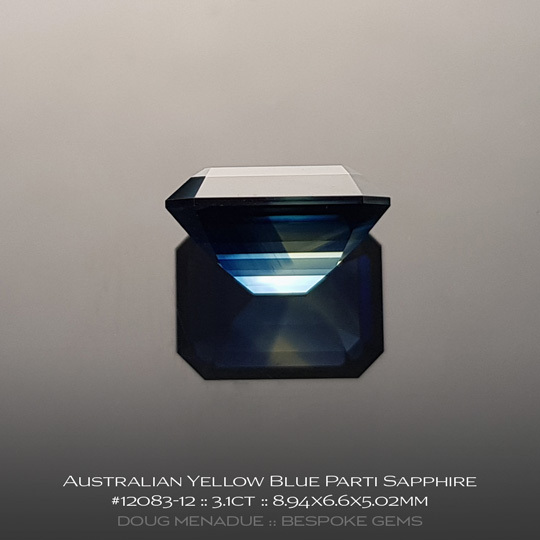 It has been precision cut and polished locally on the gemfields and is a first class sapphire in every regard. 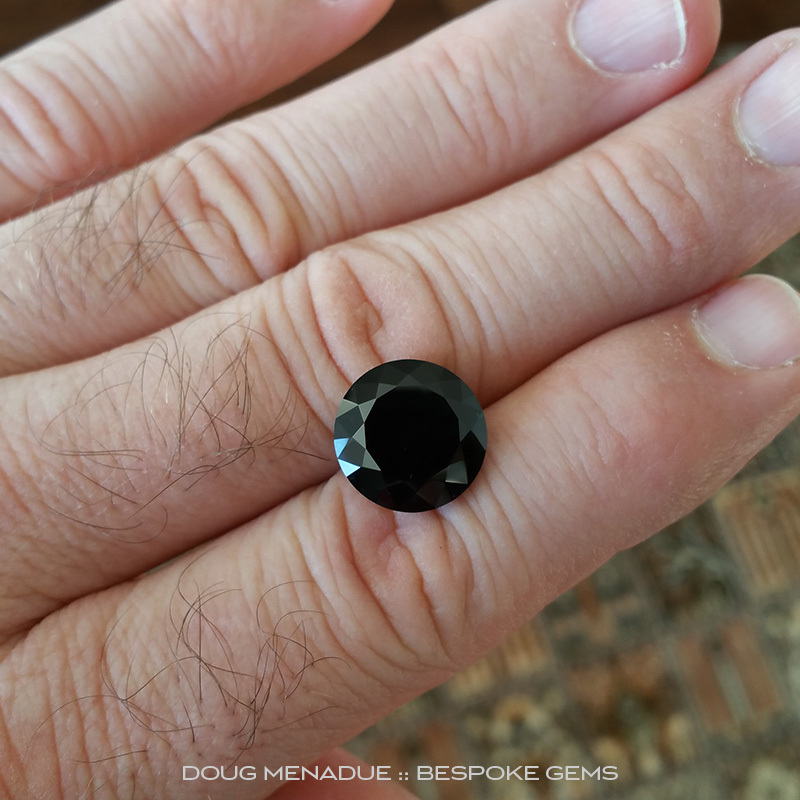 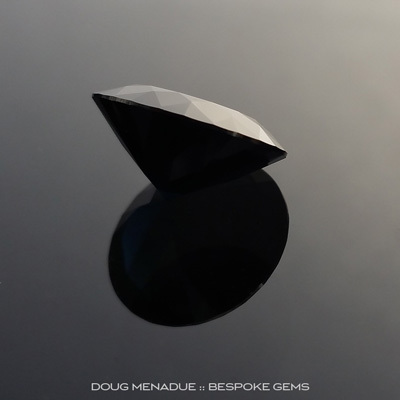 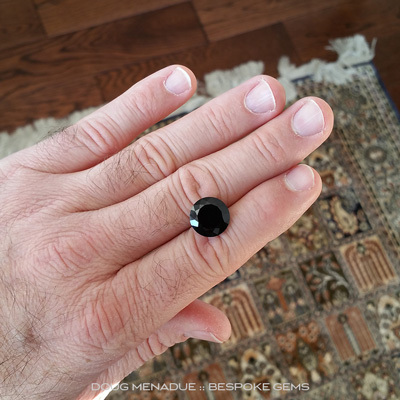 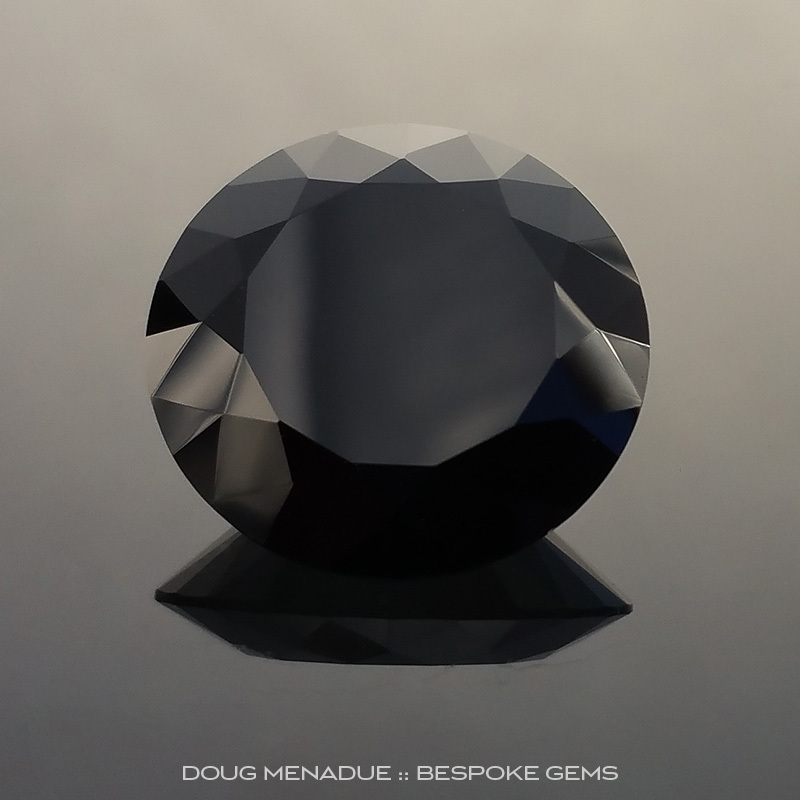 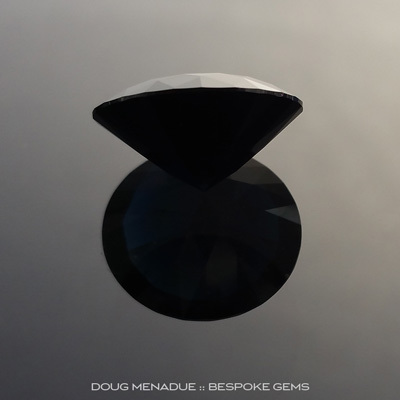 For those folks that have a penchant for dark or black gemstones then this is perfect for you and not to be missed as it is a unique black sapphire. 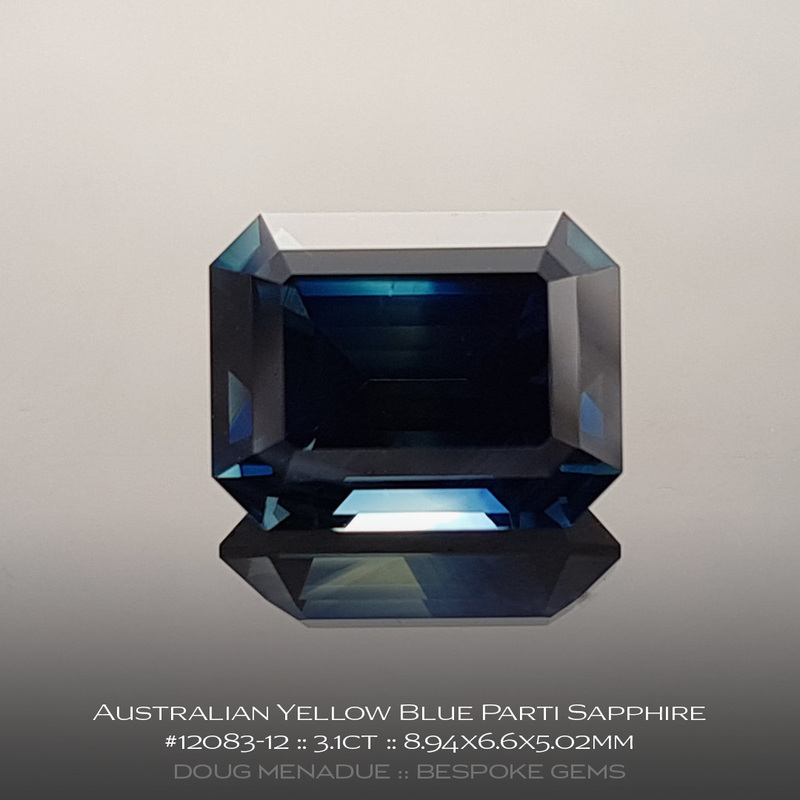 It is very hard to get big beautiful sapphires like this regardless of the colour, especially of this size and quality. Comments : Here's a magic little blue parti coloured Australian sapphire cut in a trillion design. Nice and lively and looking for a good home. 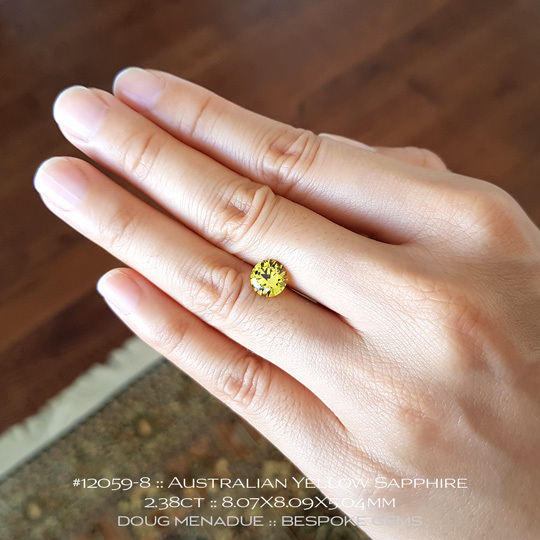 It would be perfect for an everyday wearing ring. 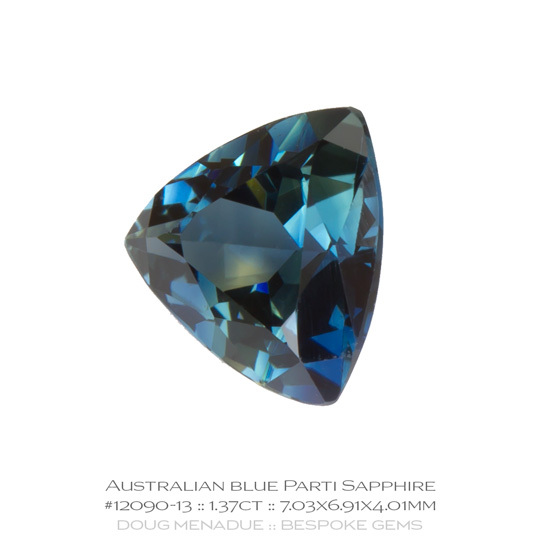 Comments : This fine Australian sapphire has deep rich blue hues and is just the right size for an everyday wearing ring. 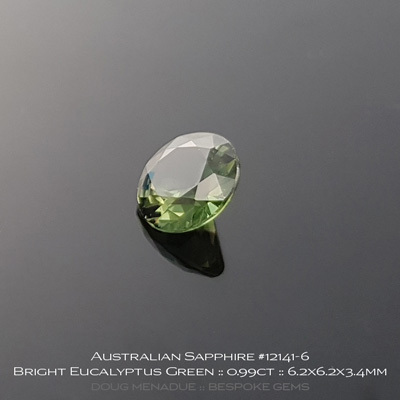 It has been cut in the classic Round Brilliant design. Comments : A beautiful Australian sapphire with wonderful blue green hues. This is a classic sapphire from the world renown outback gemfields of Central Queensland. 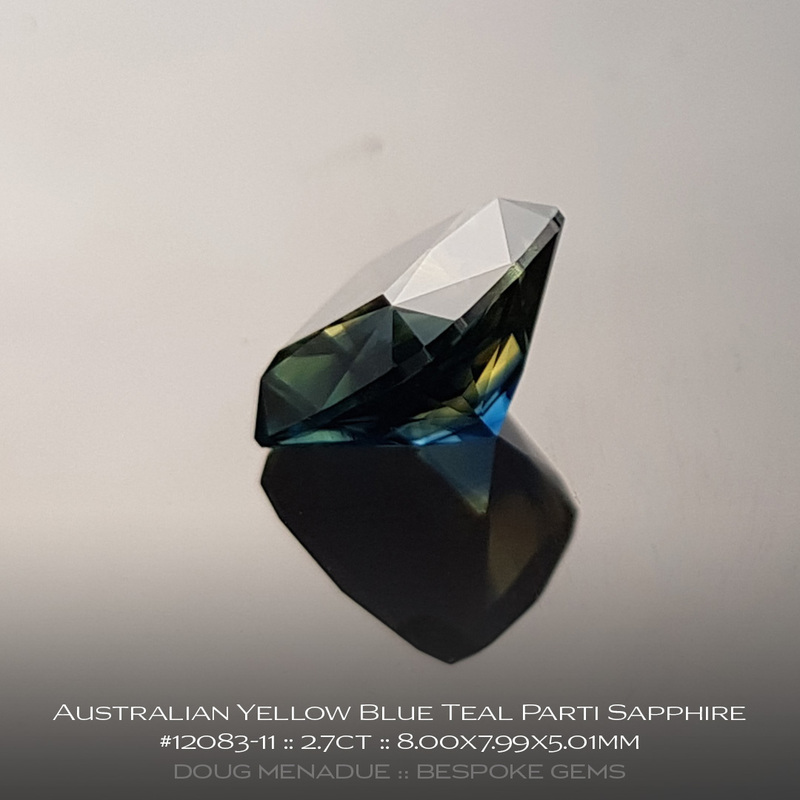 In the hand the colour tends more towards the blue. This size and shape is perfect for any everyday wearing jewellery setting you would like. 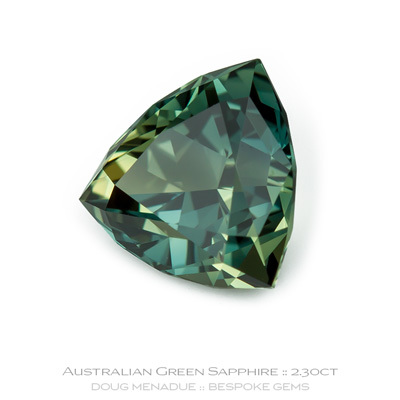 Australia produces some truly superb natural green sapphires and this beauty is one of them. It is a fine green-on-green sapphire, by that I mean it is green down the main c-axis and green on the crosstable. 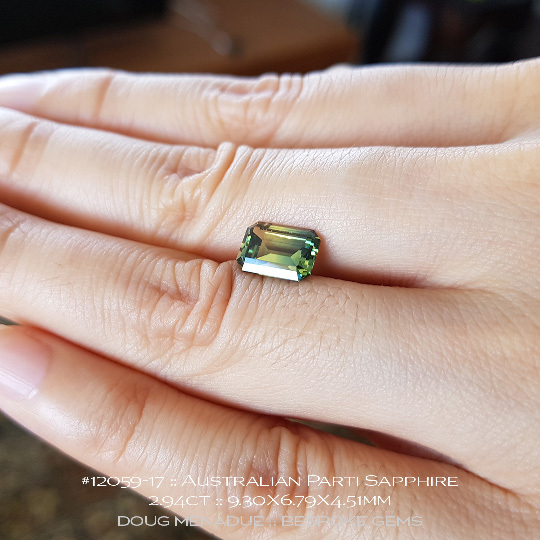 It has a lovely strong bright green flash and is a nice big size and the stone really suits the classic Emerald Cut design. 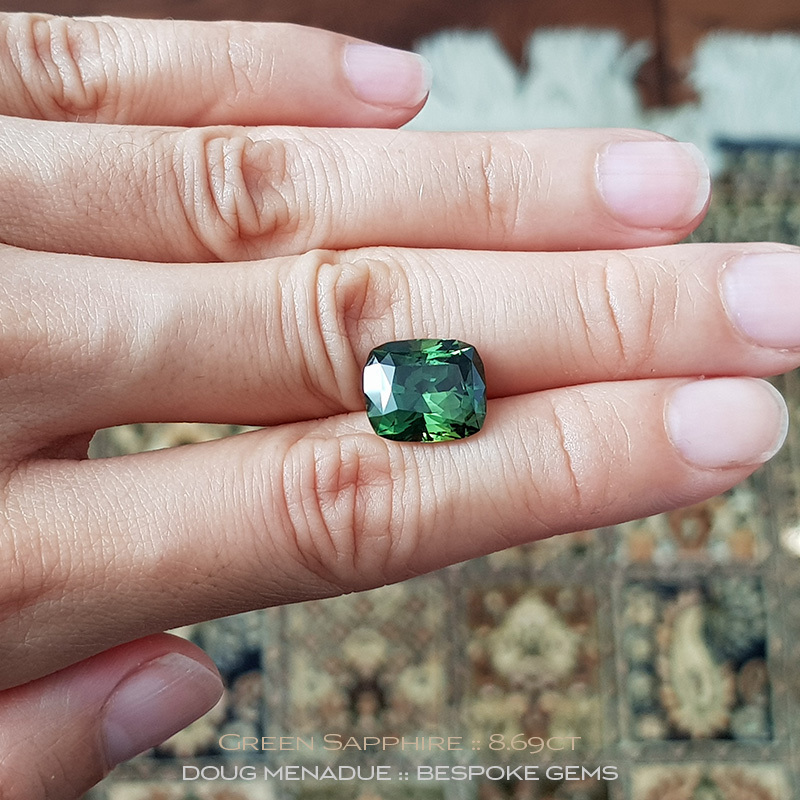 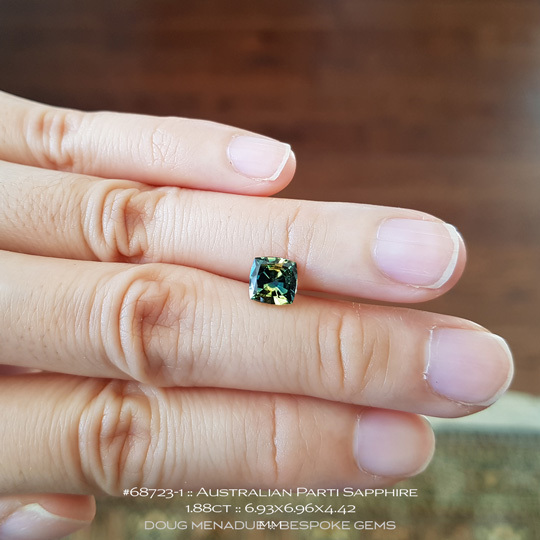 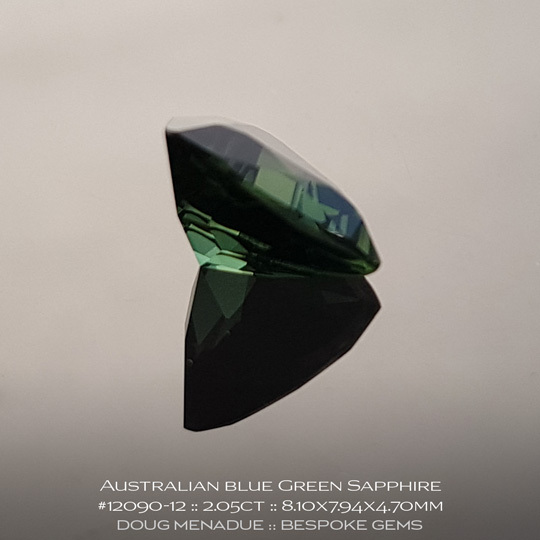 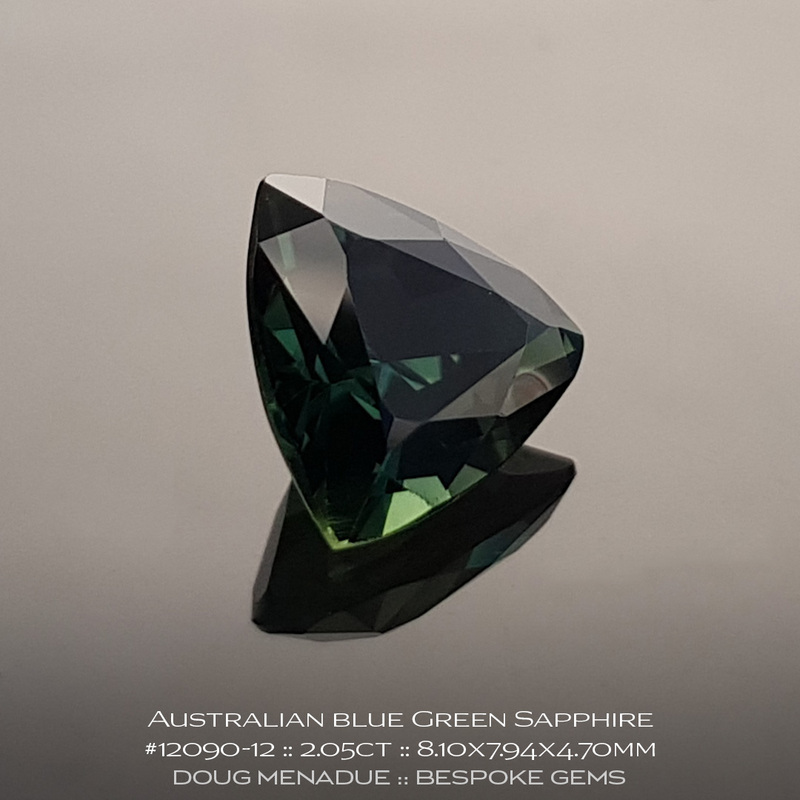 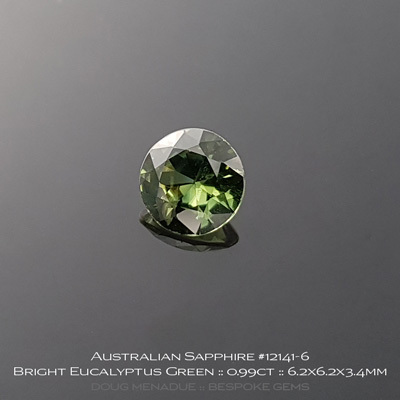 You don't see too many really good Australian green sapphires on the market these days, they are not that easy to come across, especially in this size and quality. 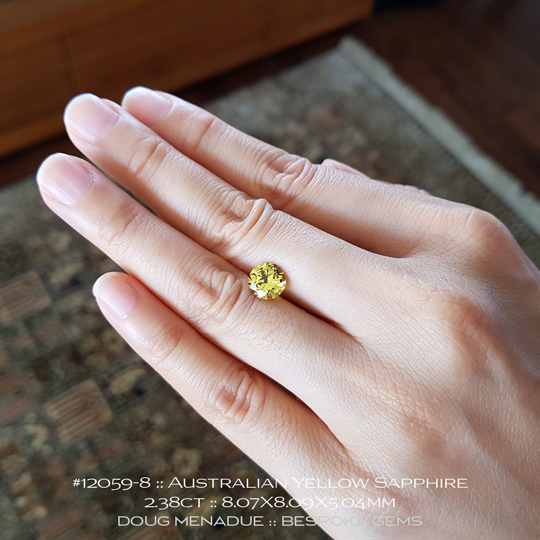 A beautiful stone looking for a beautiful setting. 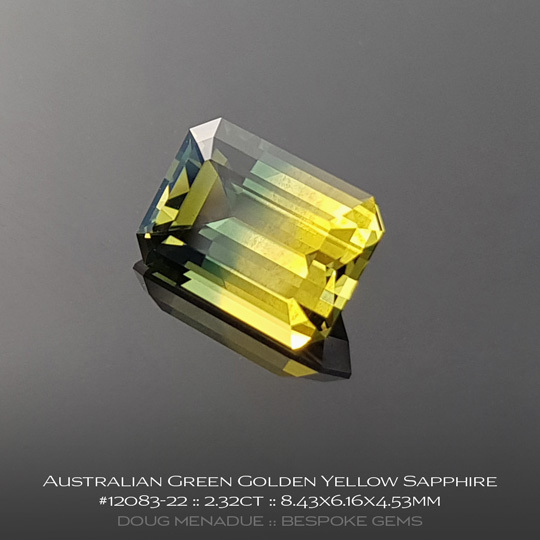 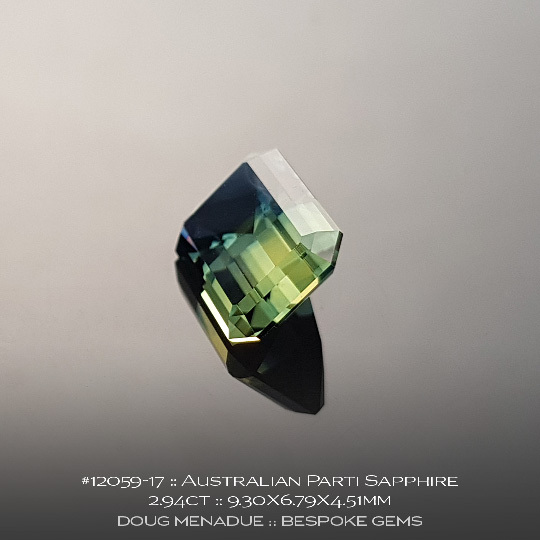 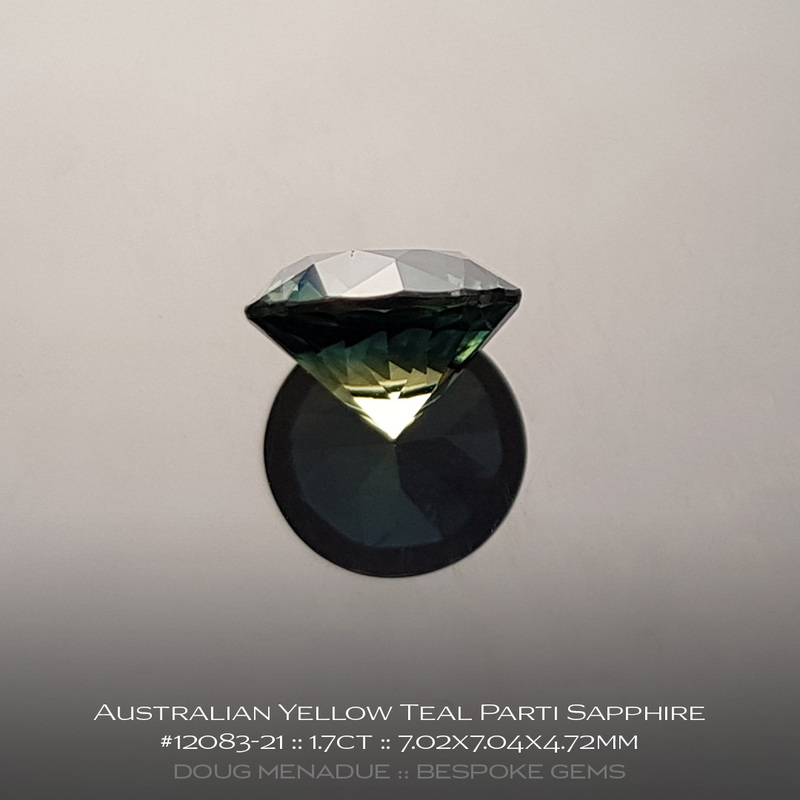 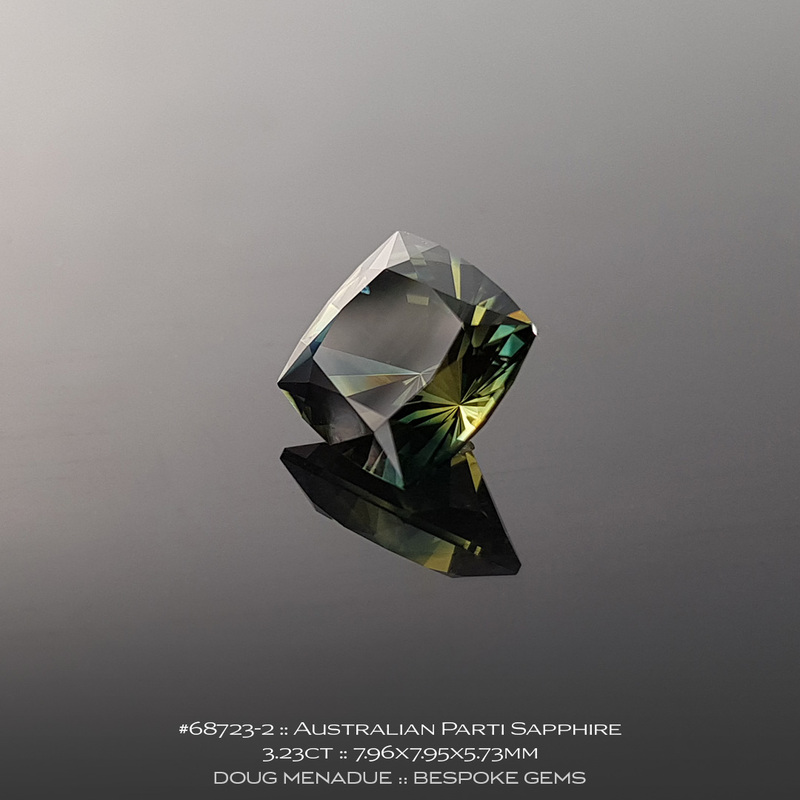 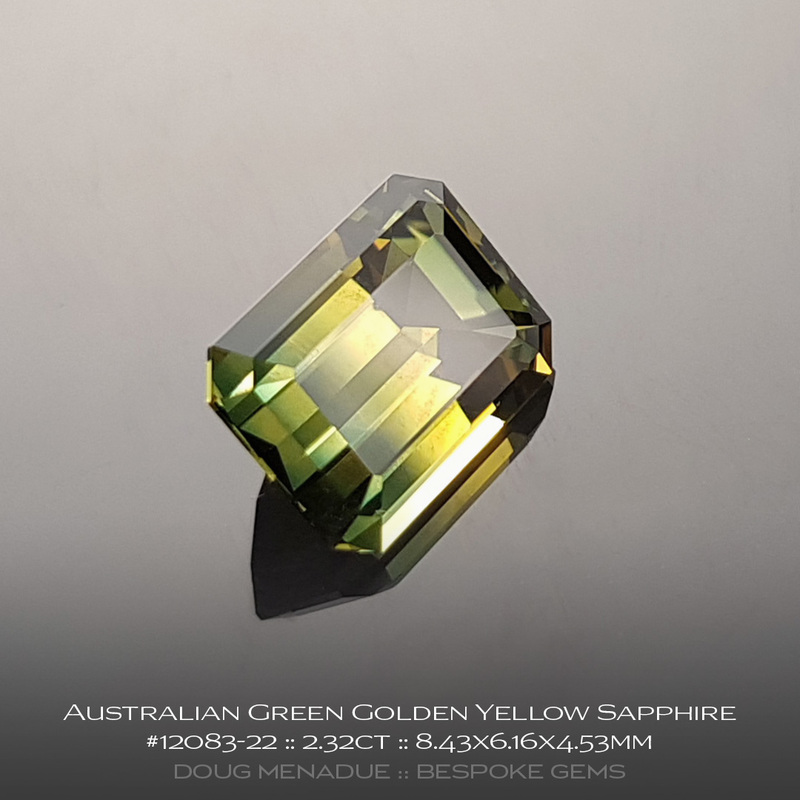 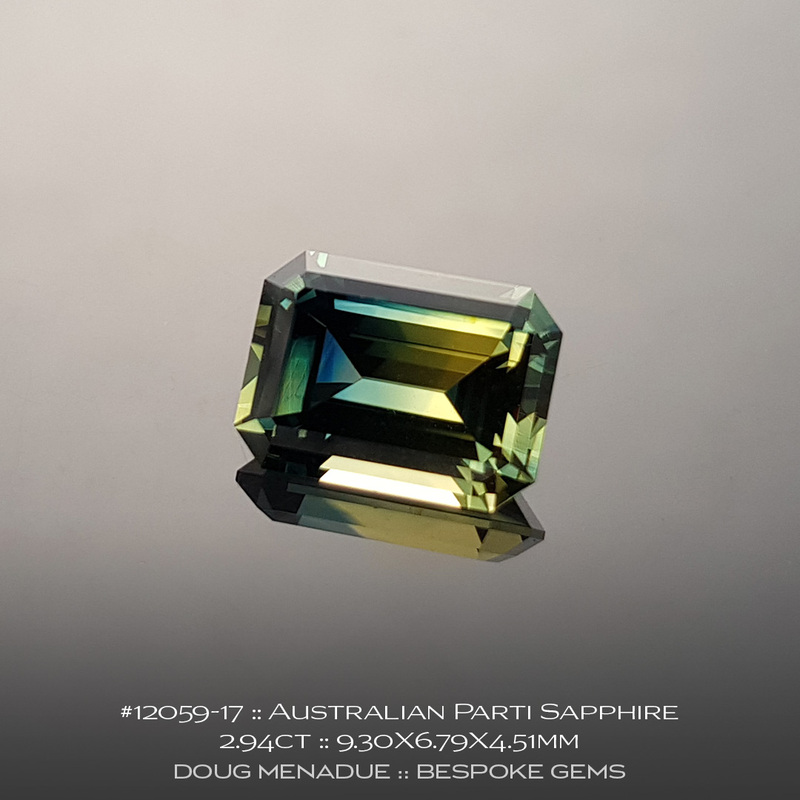 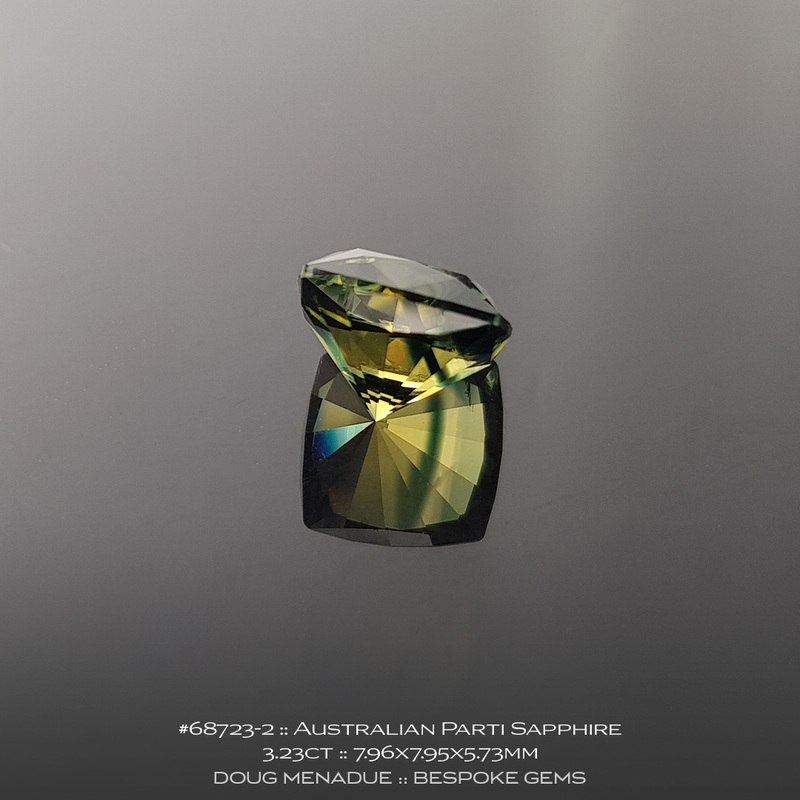 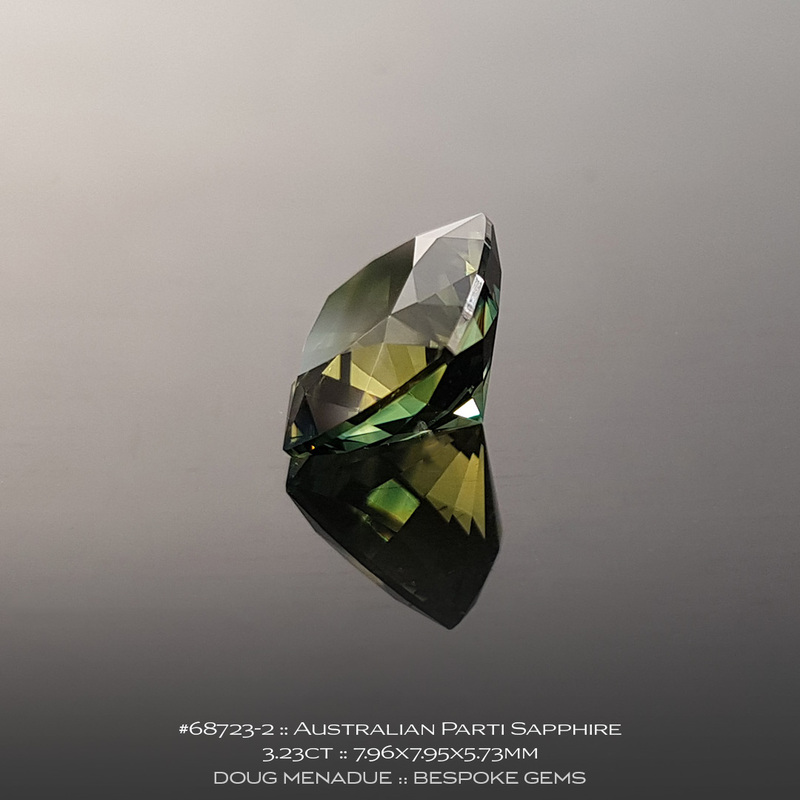 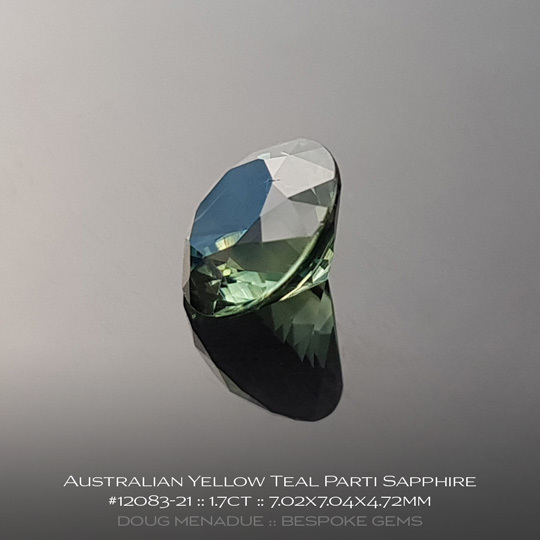 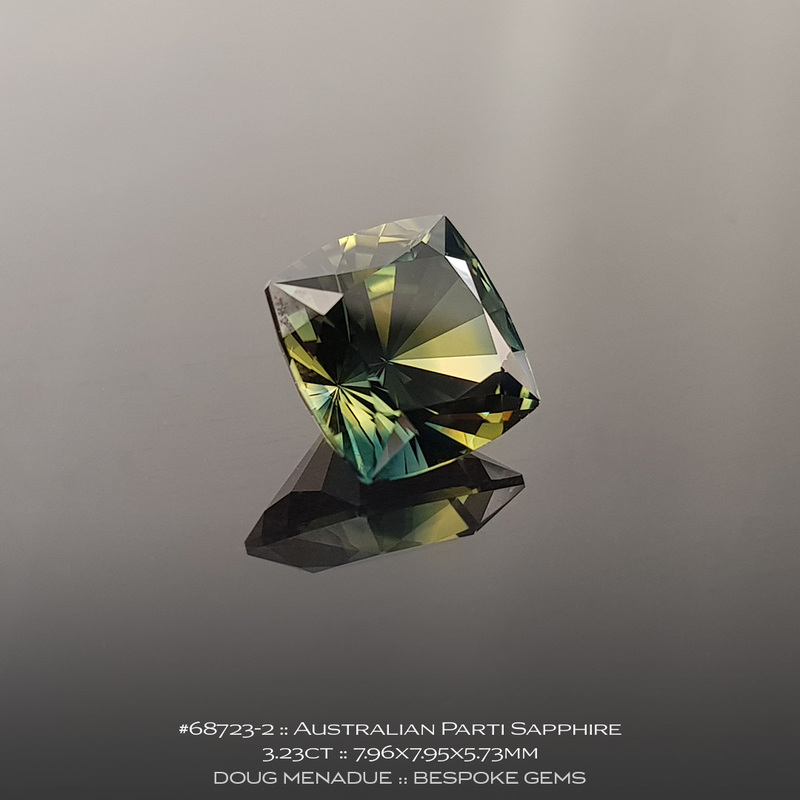 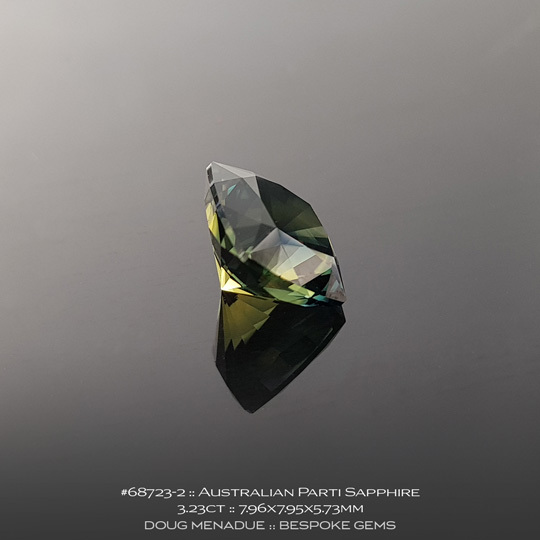 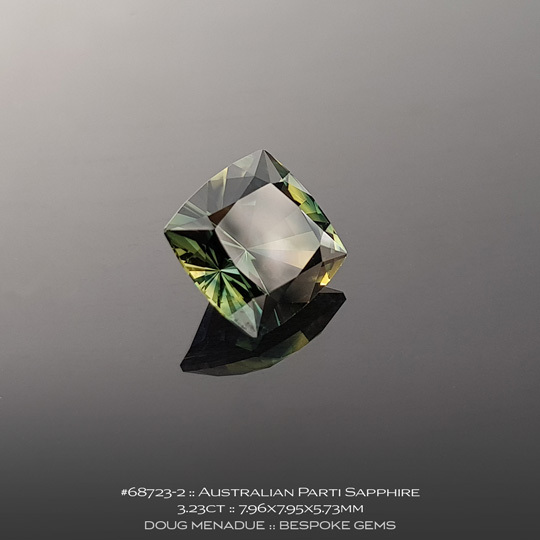 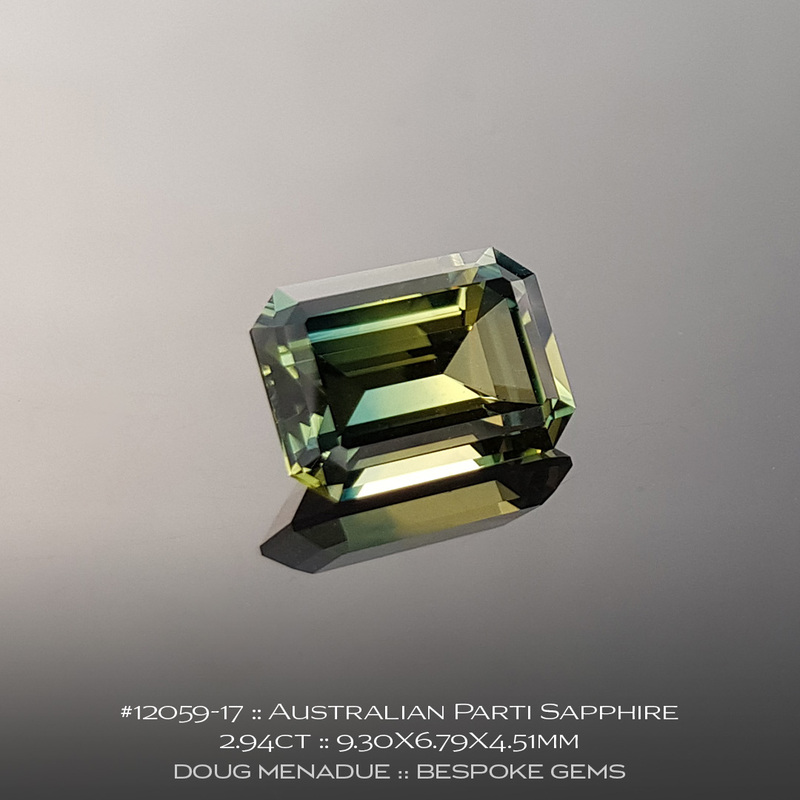 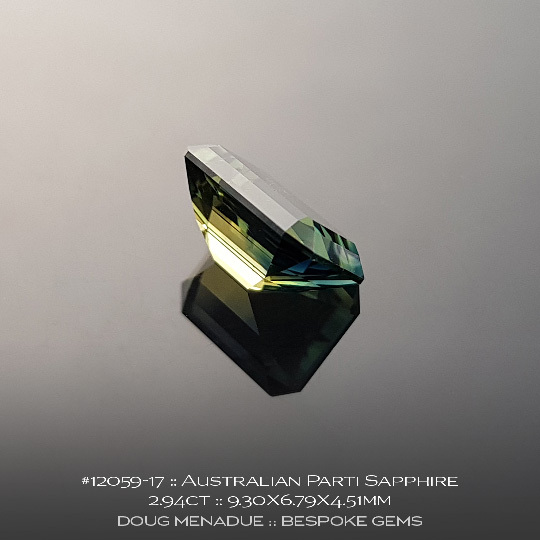 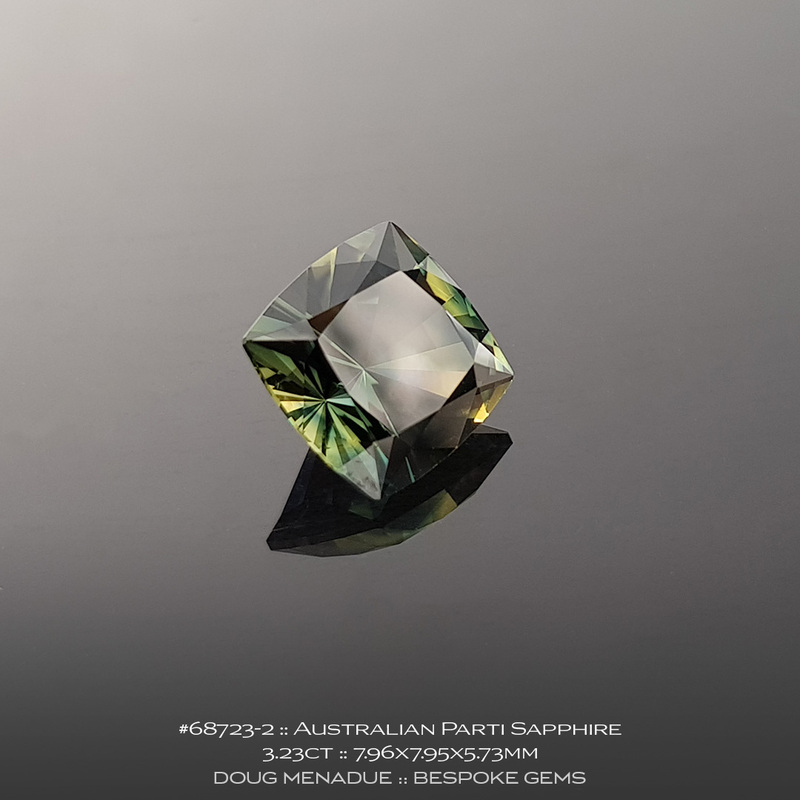 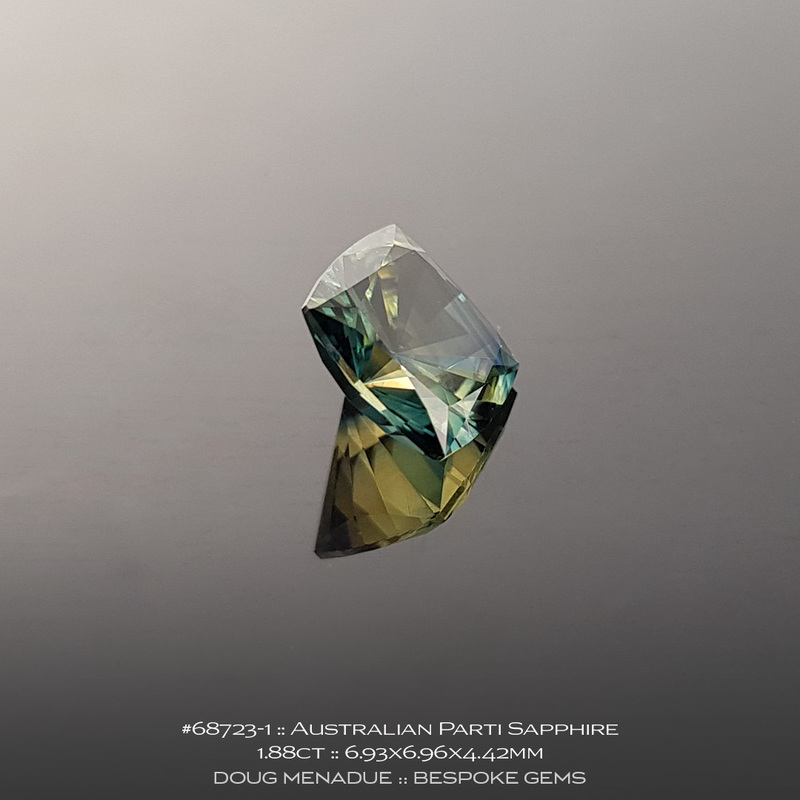 A stunning brightly coloured Australian green yellow parti sapphire. This is a super stone, really colurful and lively and just the right size for a ring or pendant. 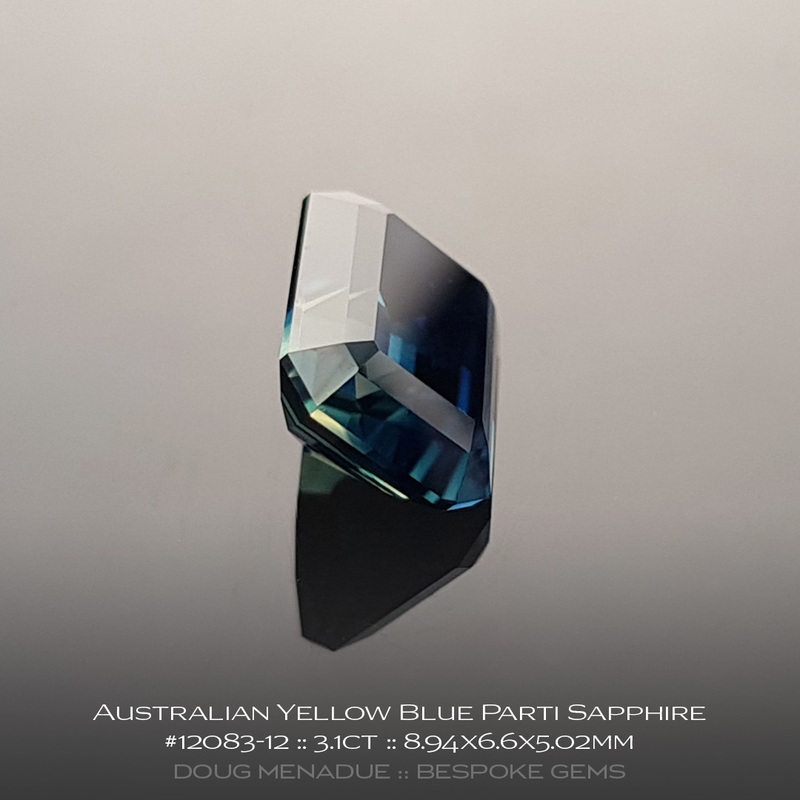 It really is a wonderful stone and a perfect example of the fabulous and unique parti coloured sapphires that Australia is world renown for. This one is very highly recommended. 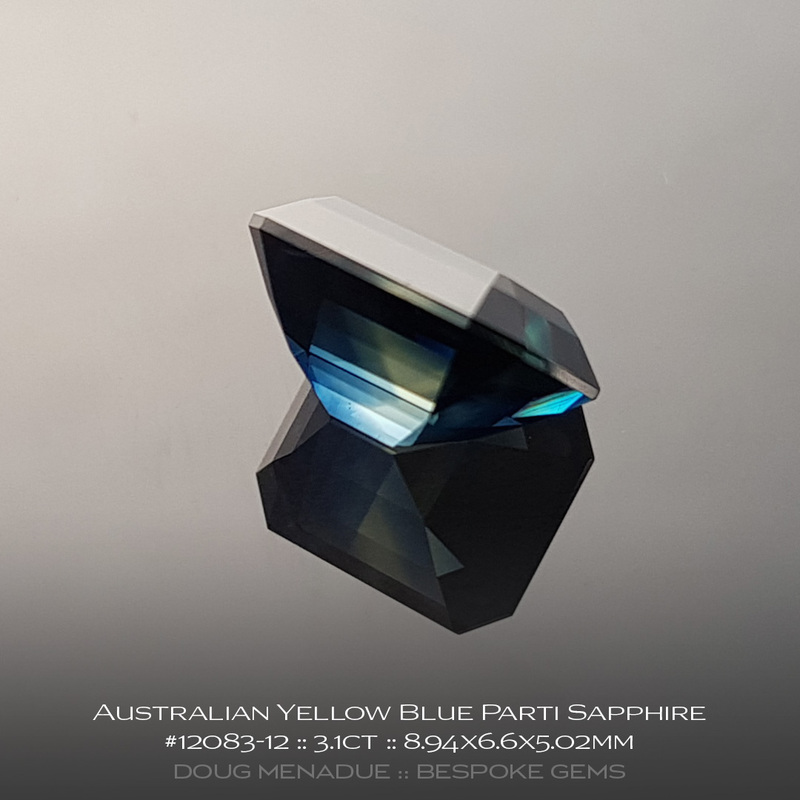 Comments : This is quite a colourful Australian parti colour sapphire with yellows, blues and teals strongly showing. 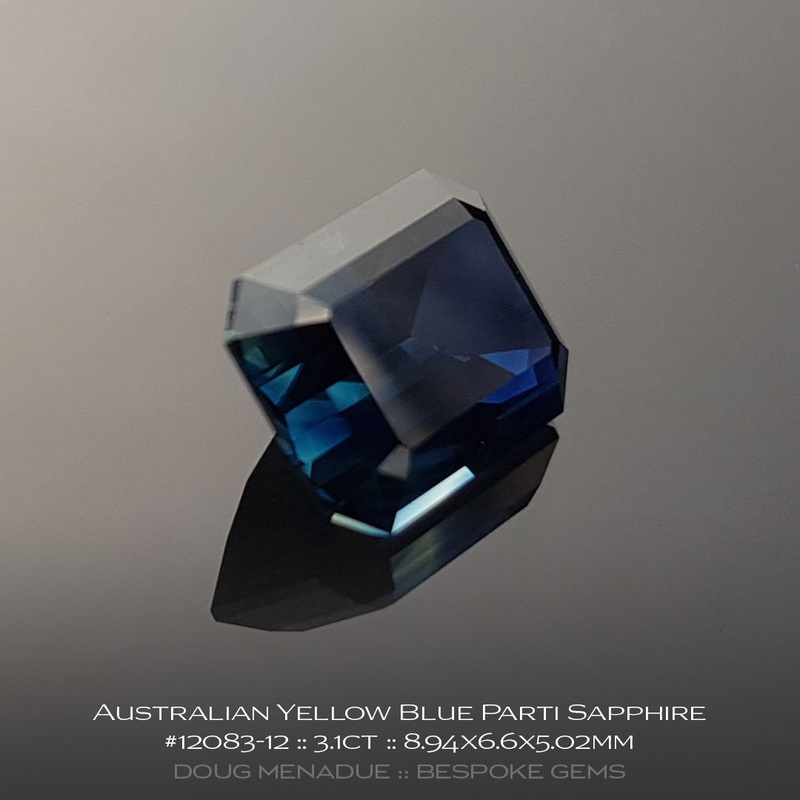 It really is a dynamic and unique sapphire and has been beautifully cut and polished on the gemfields by a local gemcutter. A very nice sapphire indeed. 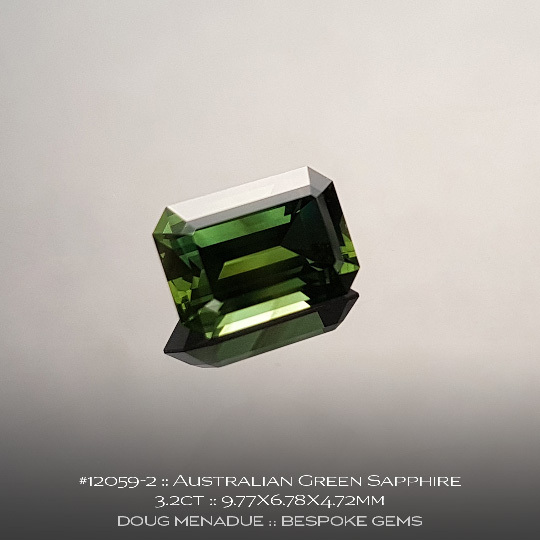 Comments : A gorgeous green Australian sapphire with striking flash and colour. 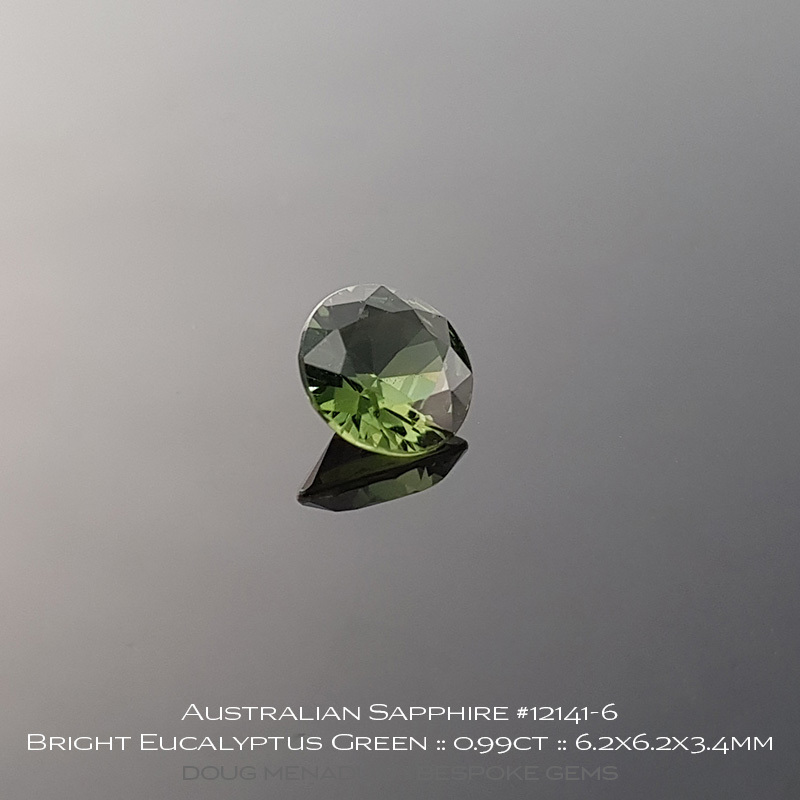 Although they are different colours, this gem is a match for #12090-1 which is green in colour but very close in size. They would make a well matched "mis-matched" pair of gems for earrings. 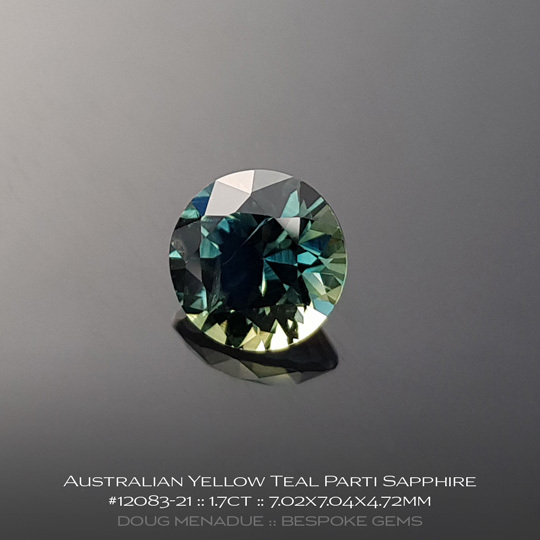 Comments : A very fine Australian blue green sapphire that has been cut in a tapered baguette style. 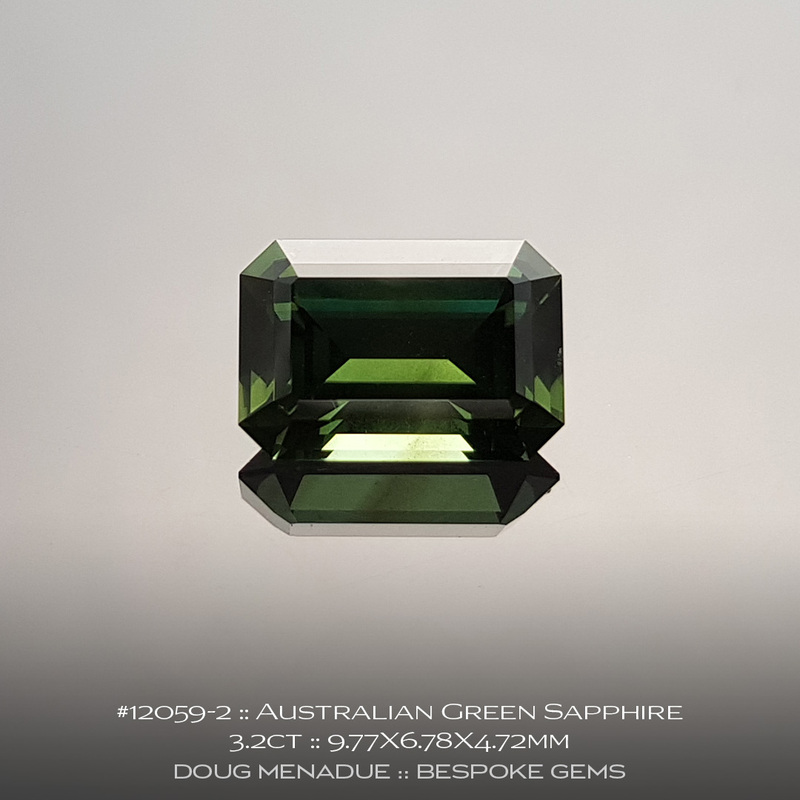 This type of cut is usually done when the original stone is shaped as a "dog's tooth". 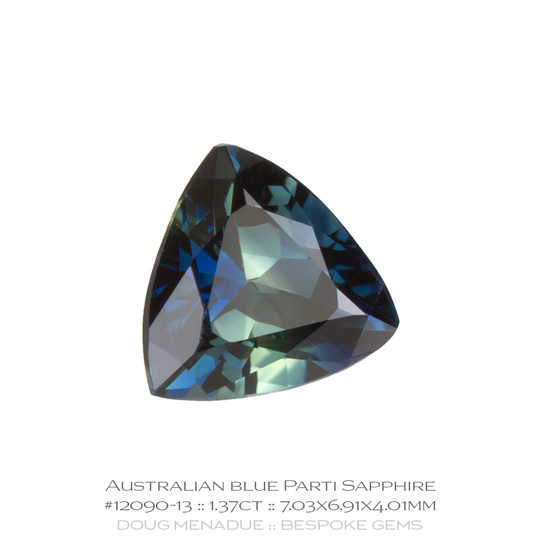 This is the natural crystal shape of sapphires and as the name suggests, is shaped like a dog's tooth. 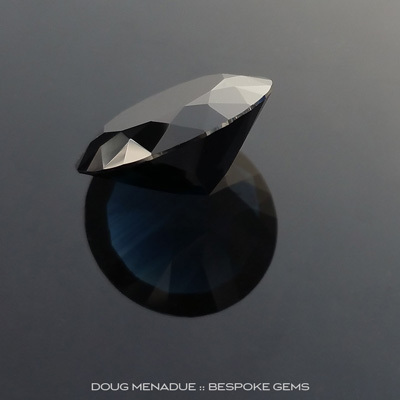 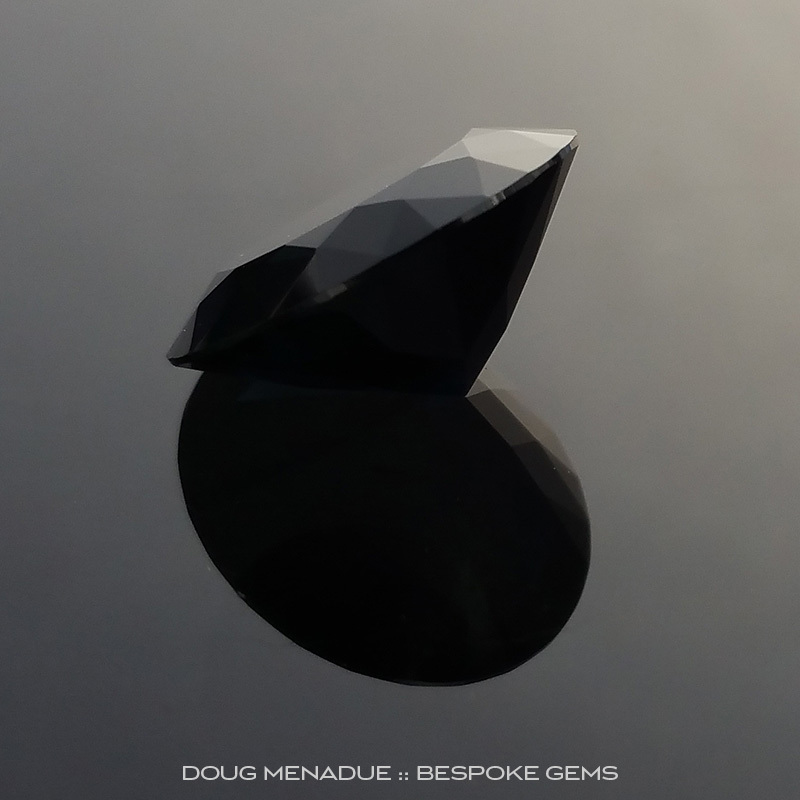 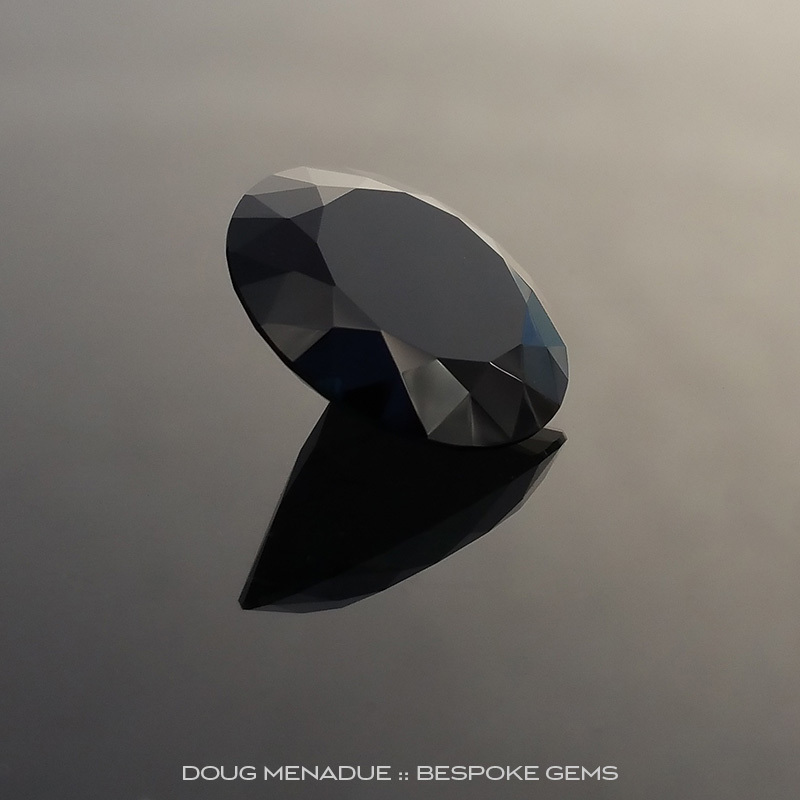 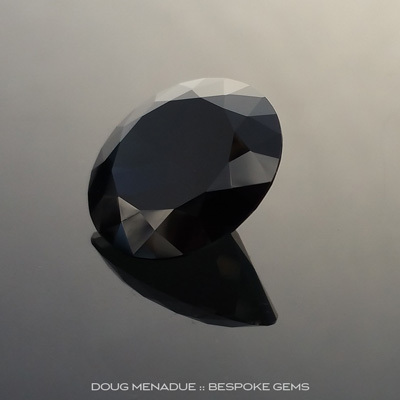 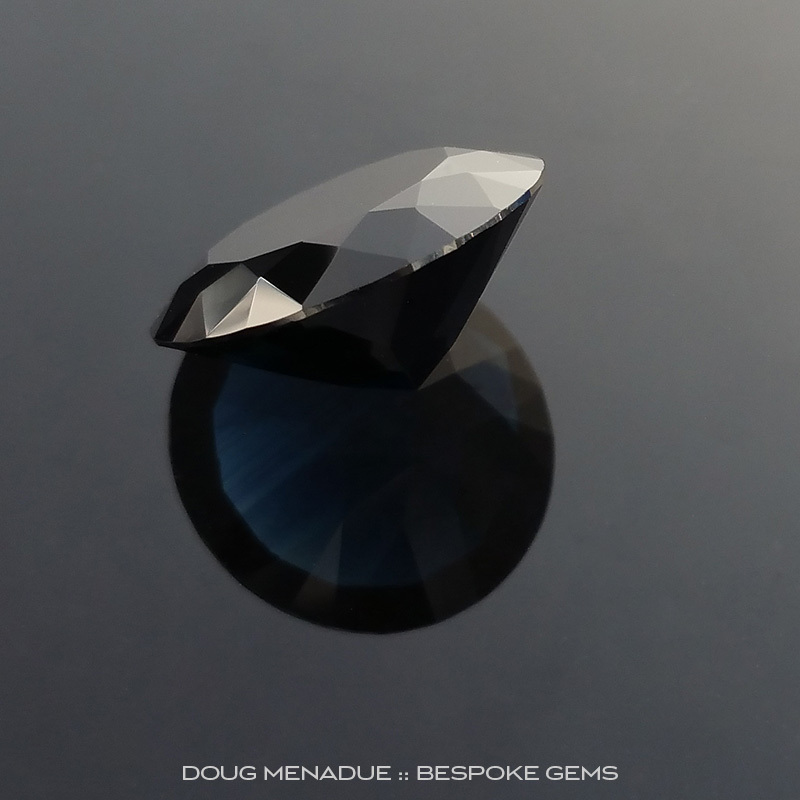 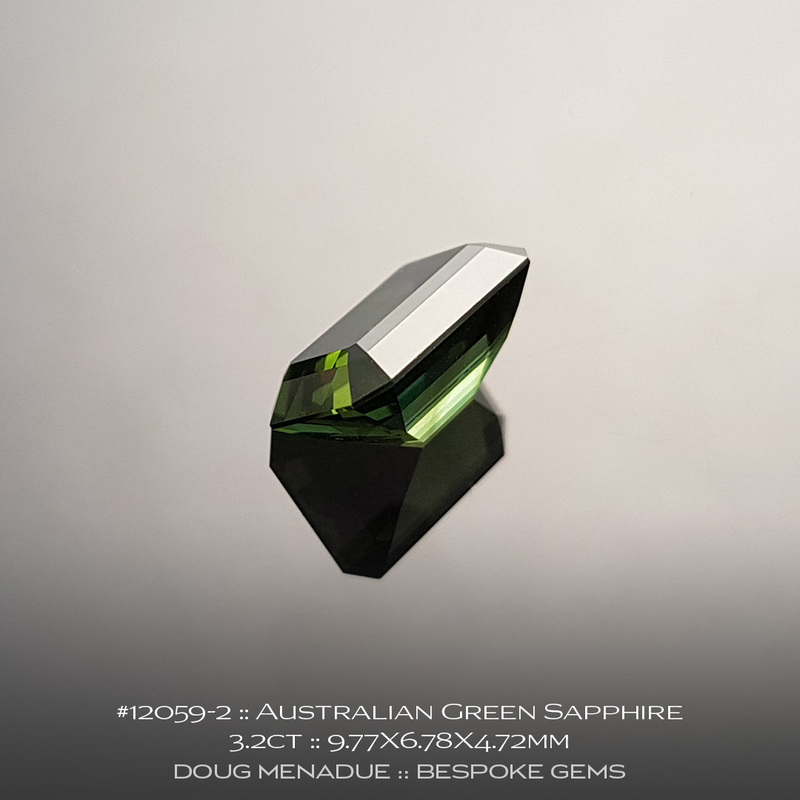 The cut is designed to maximise the finished gem. Although they are different colours, this gem is a match for #12090-2 which is green in colour but very close in size. They would make a well matched "mis-matched" pair of gems for earrings. 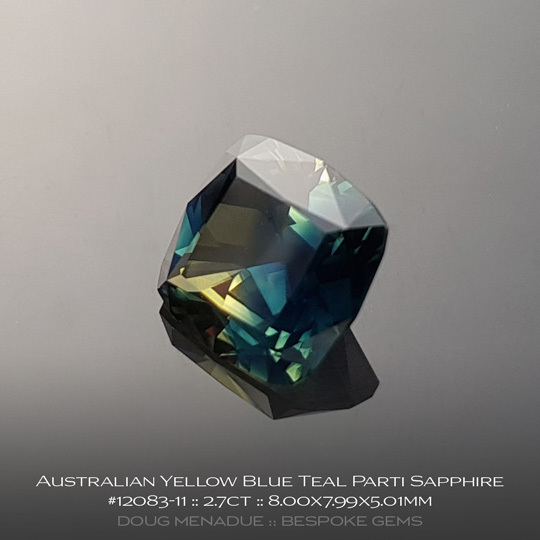 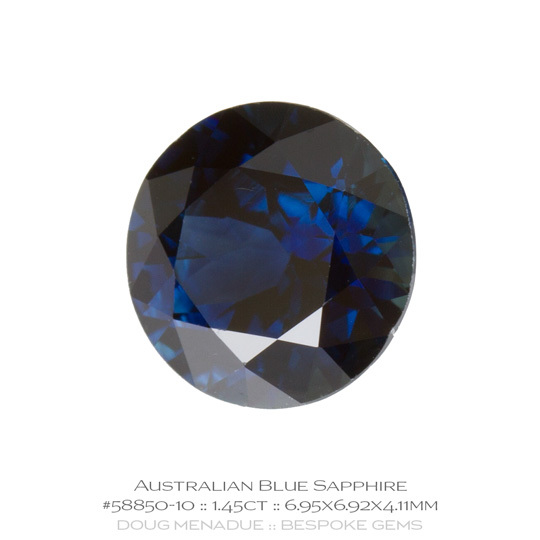 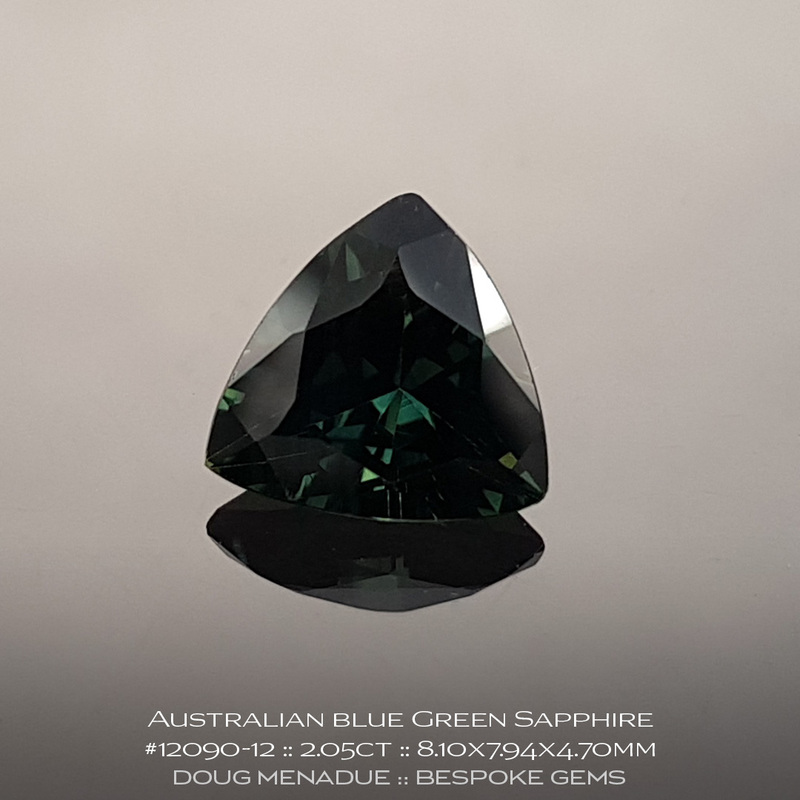 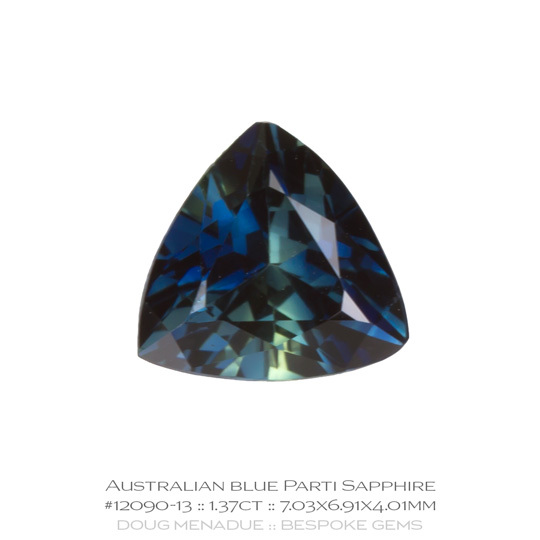 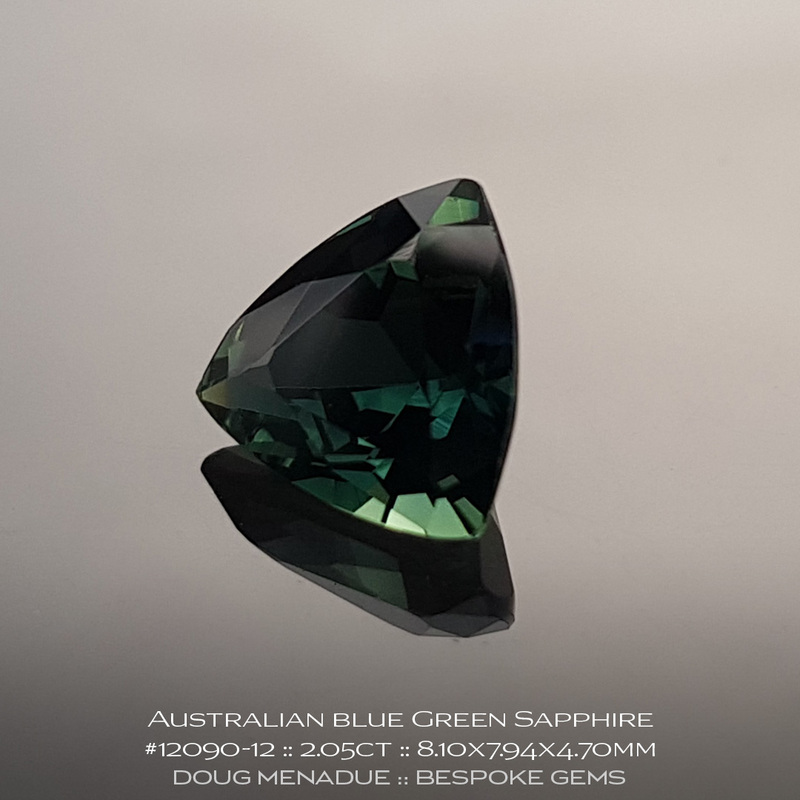 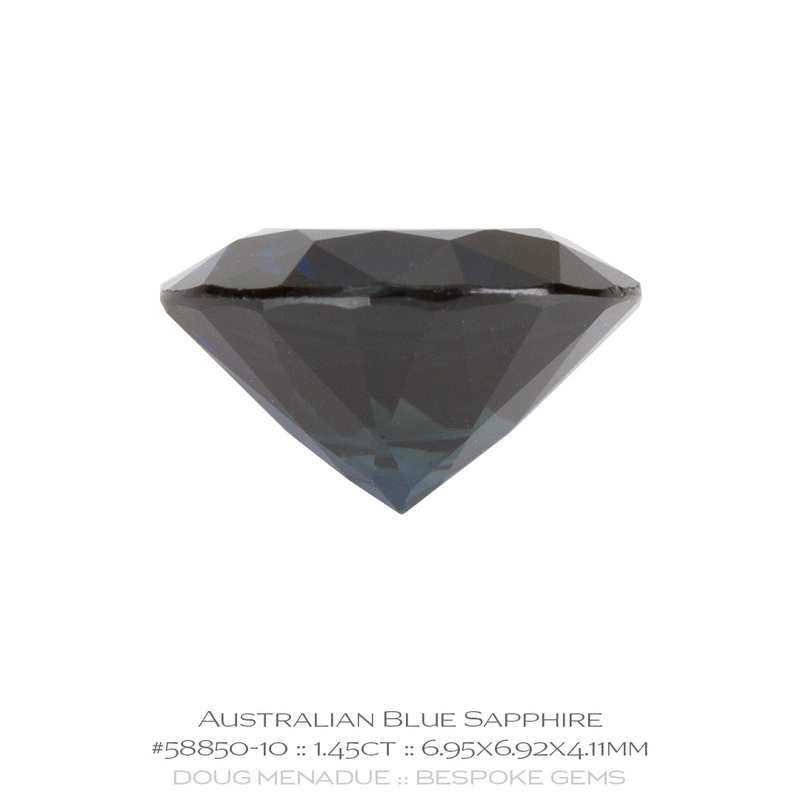 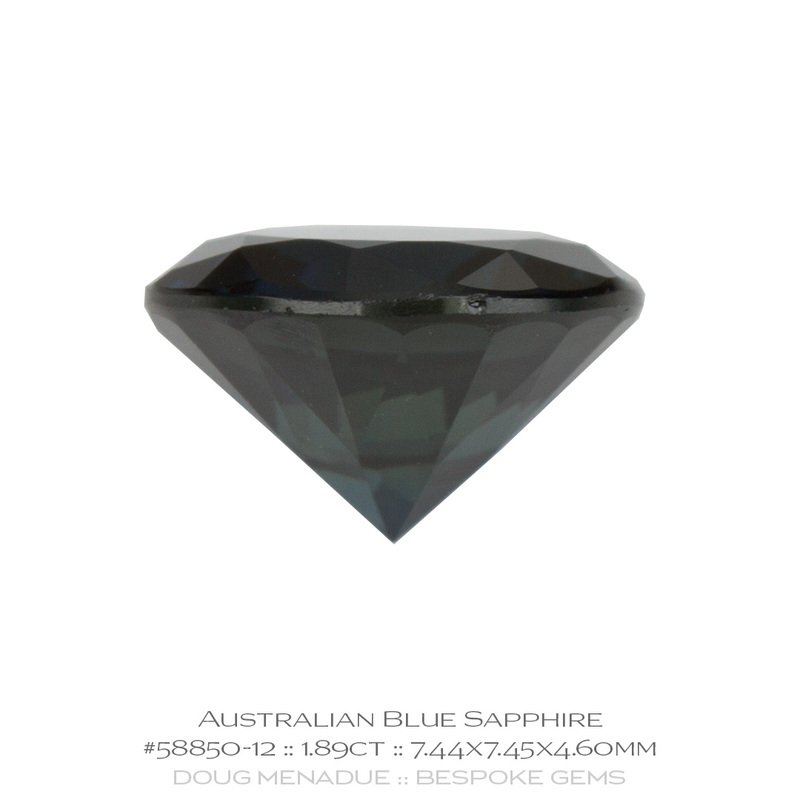 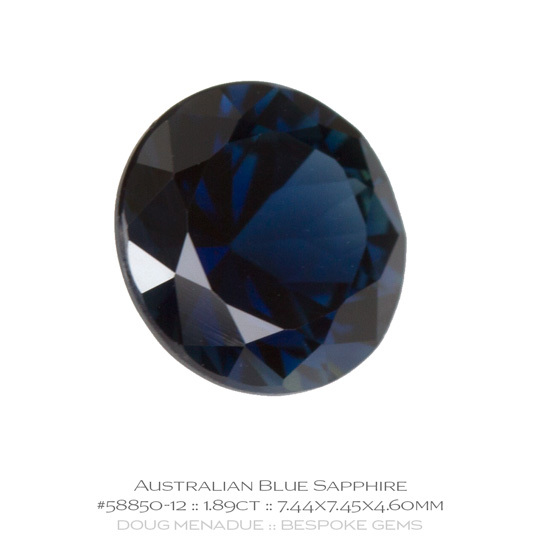 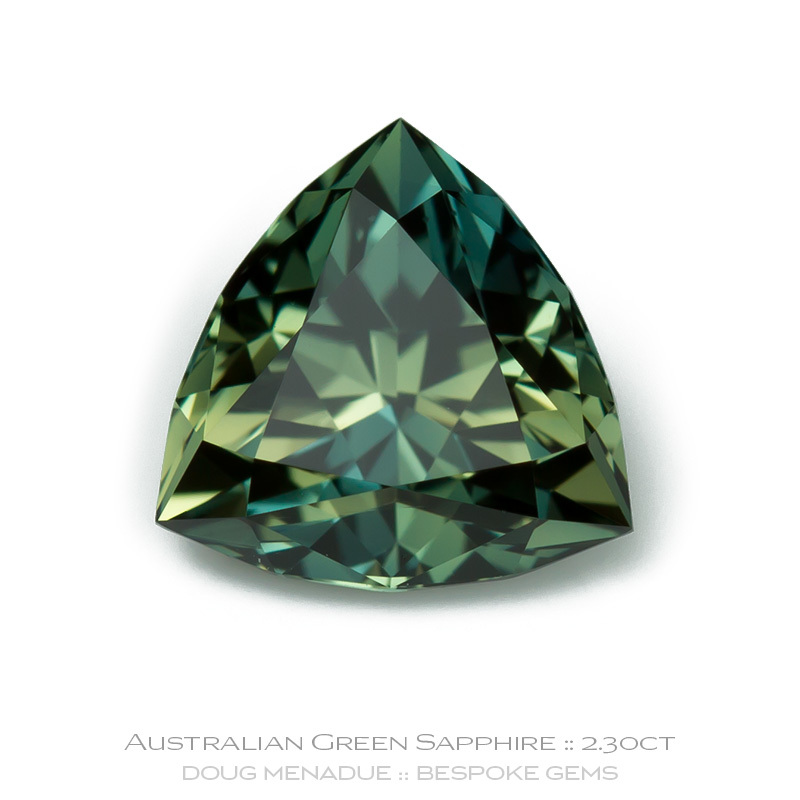 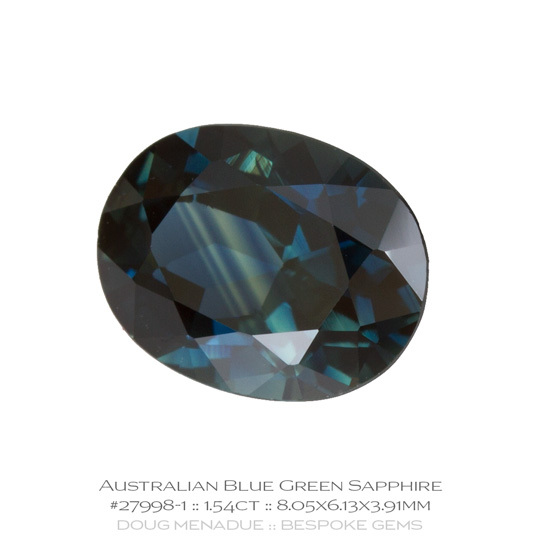 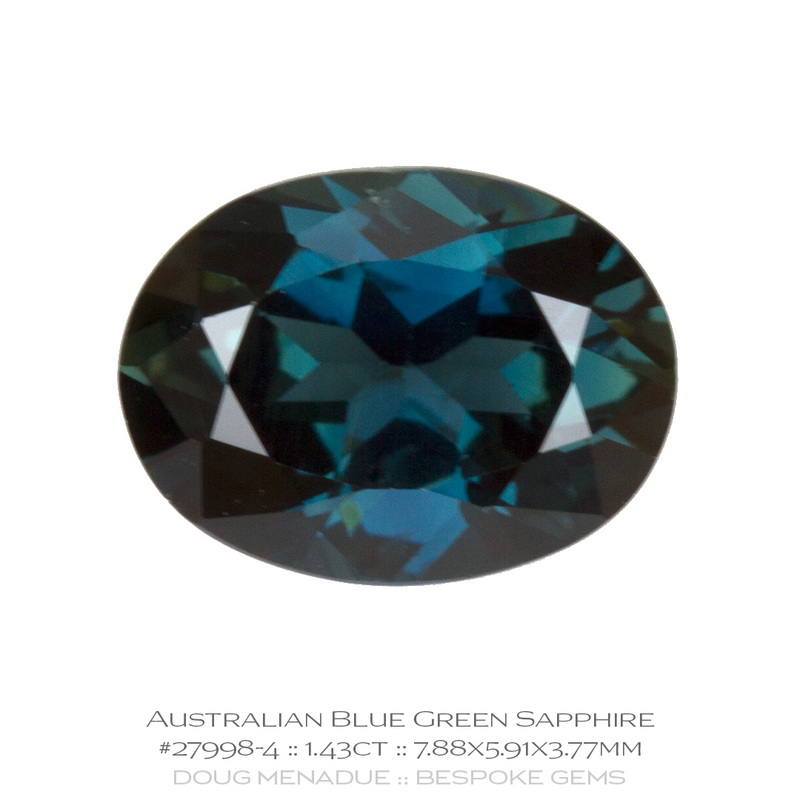 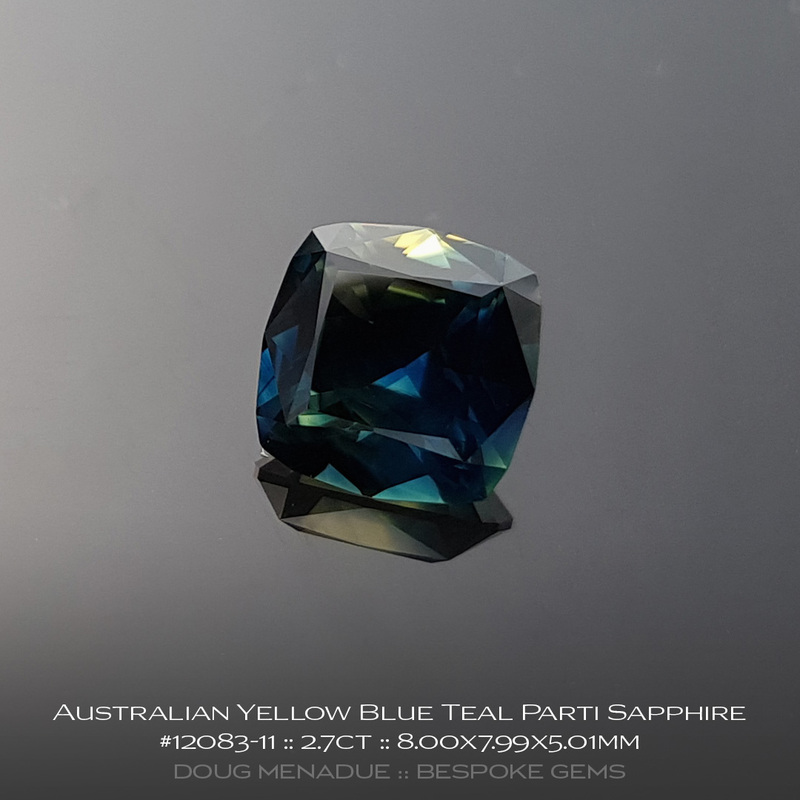 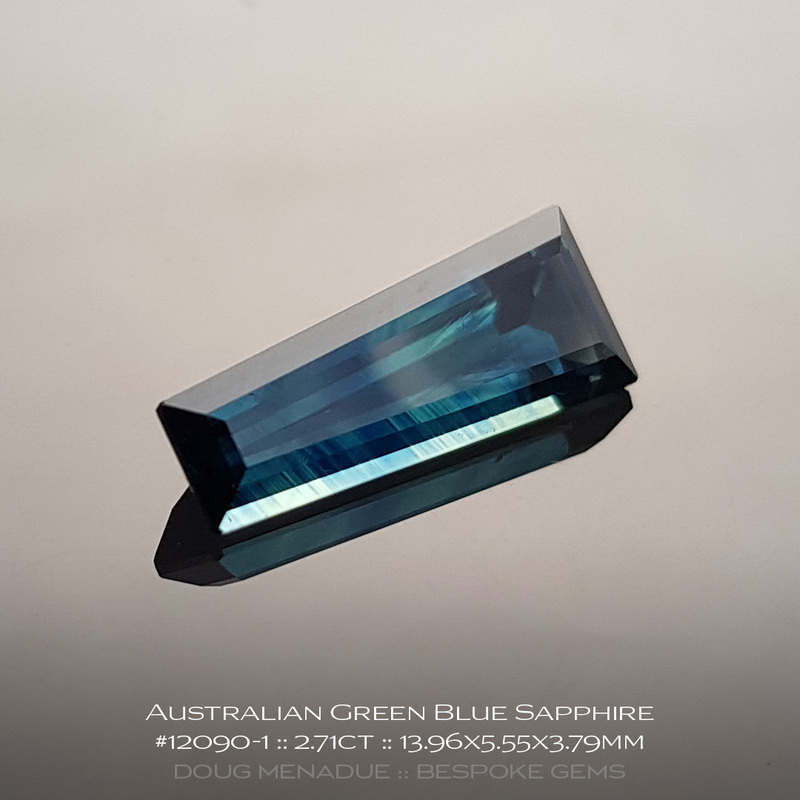 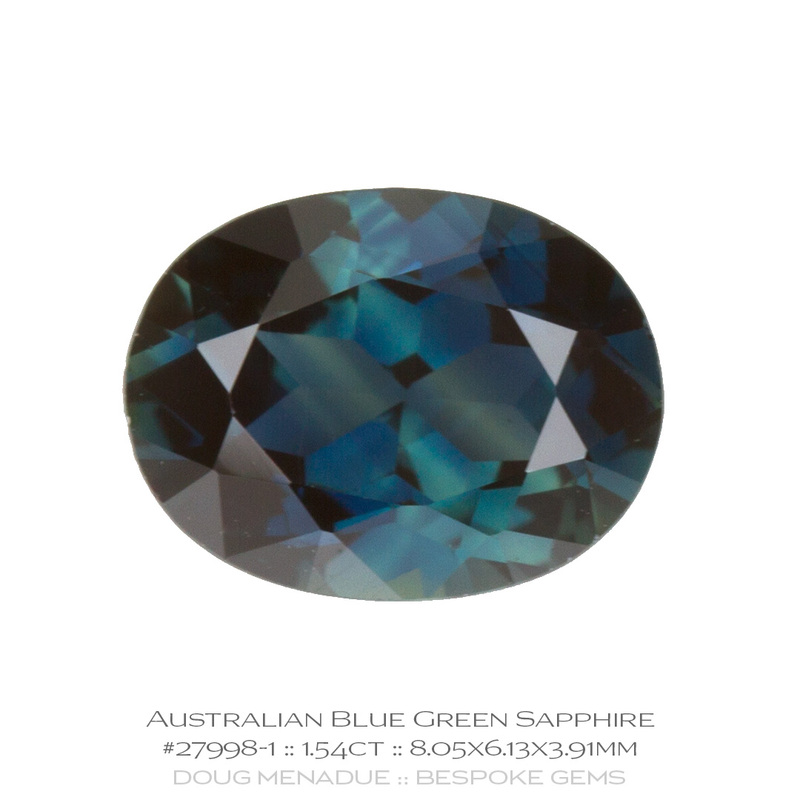 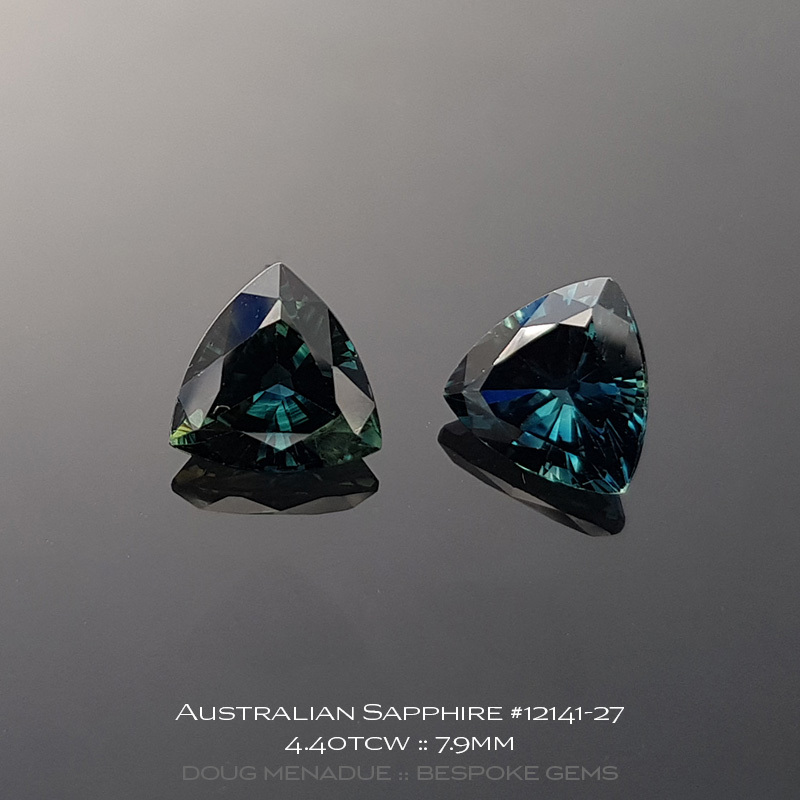 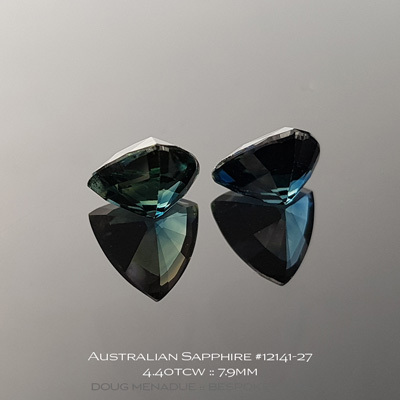 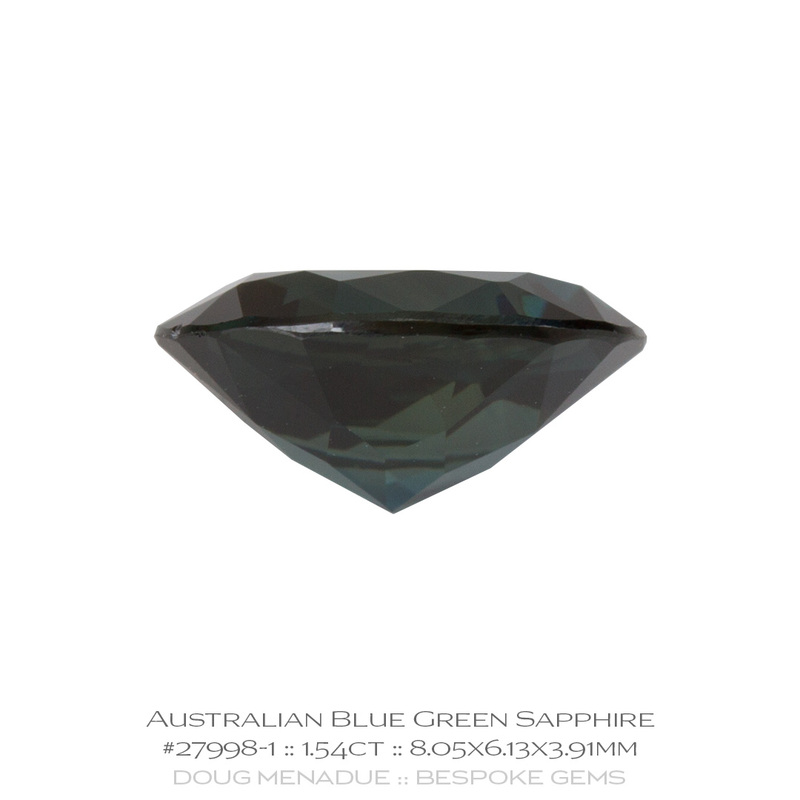 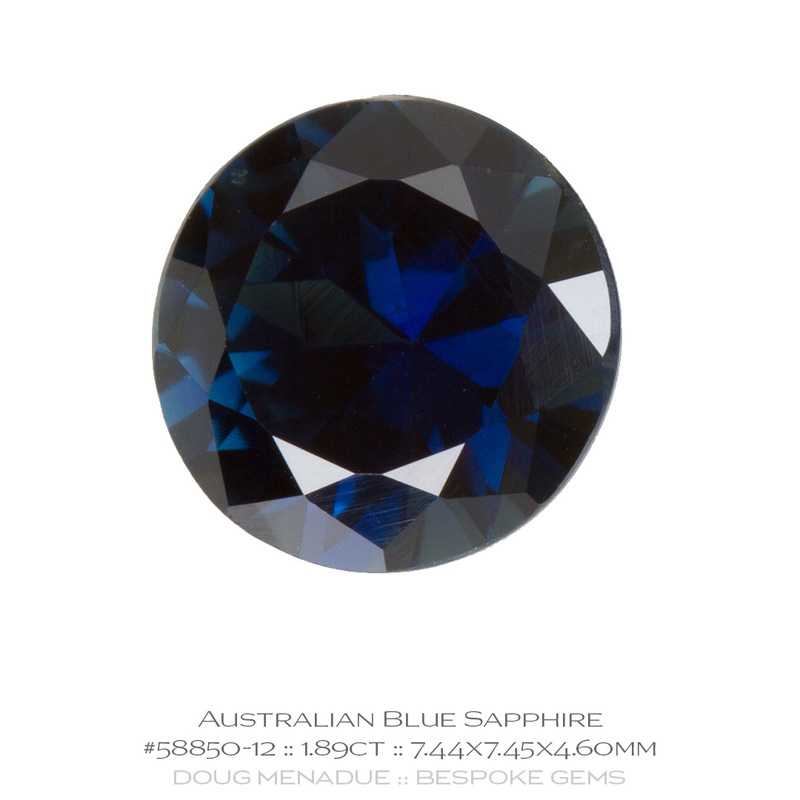 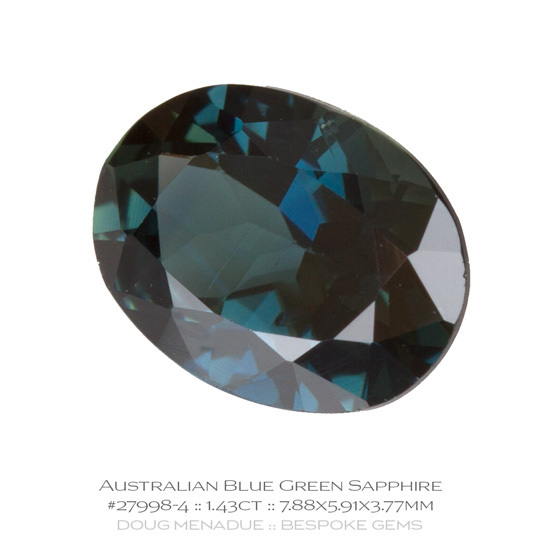 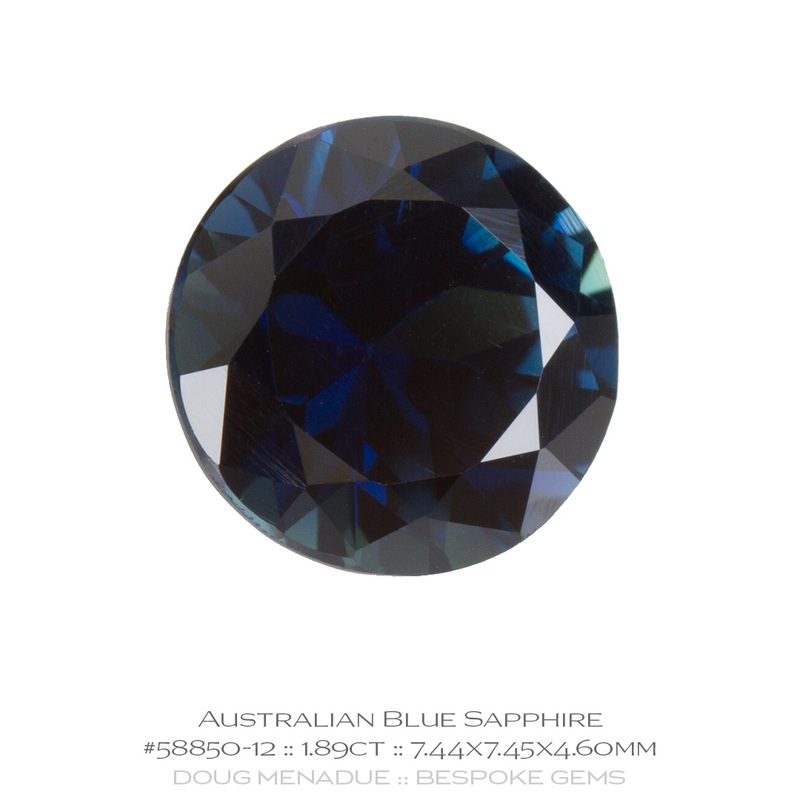 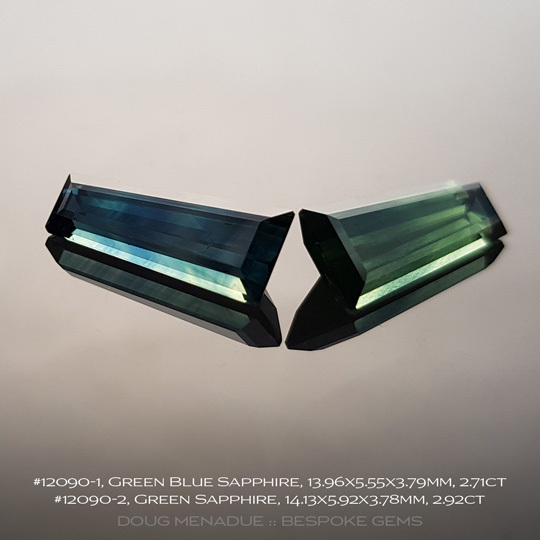 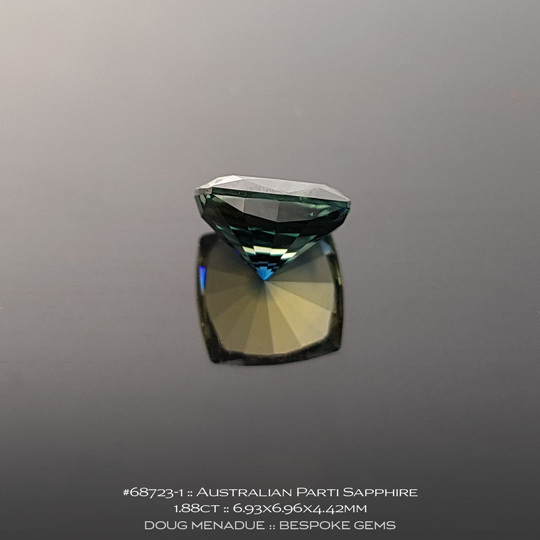 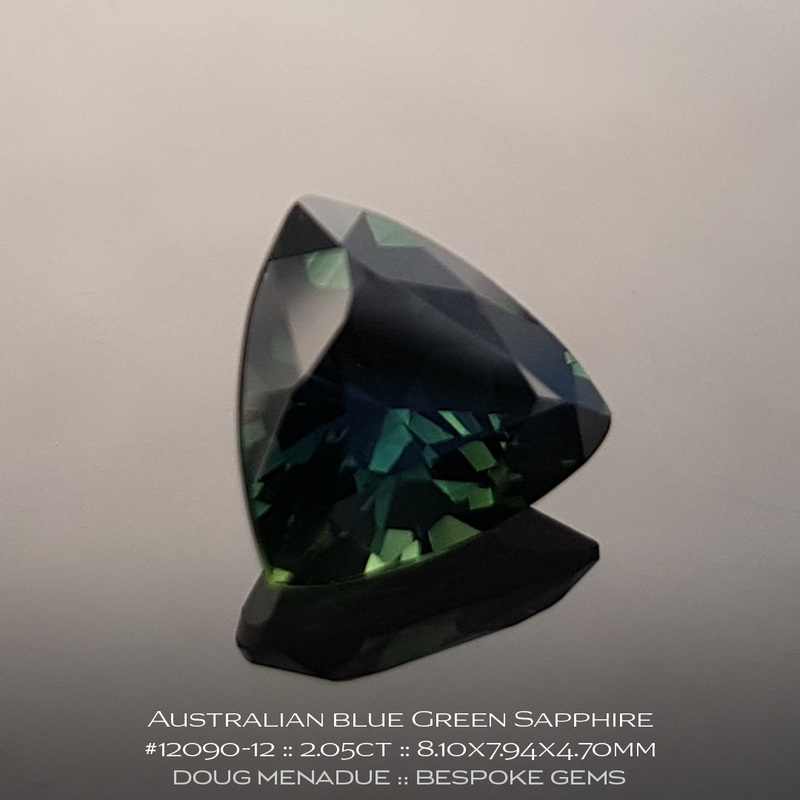 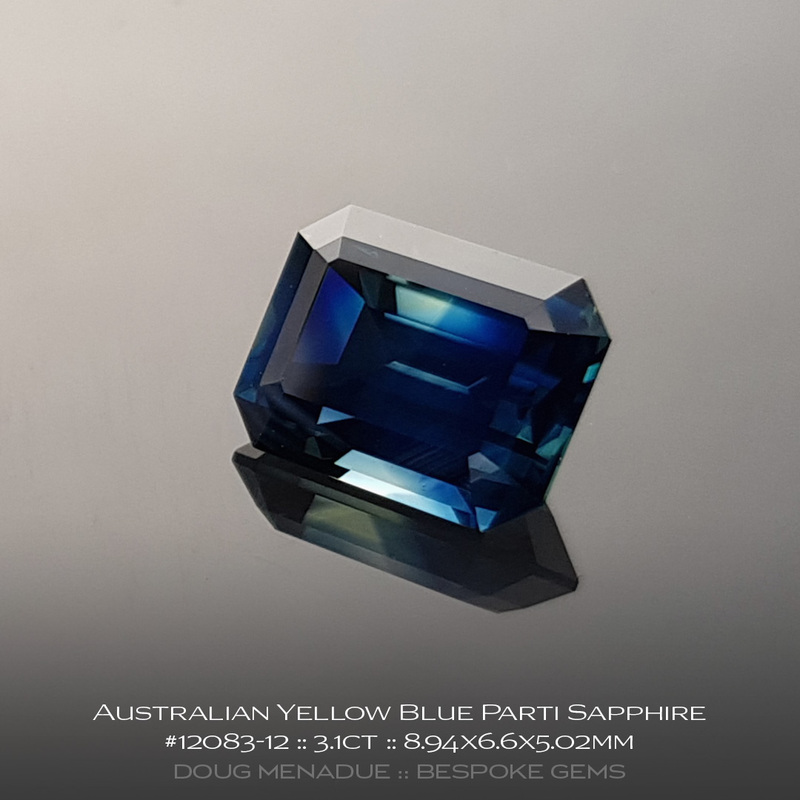 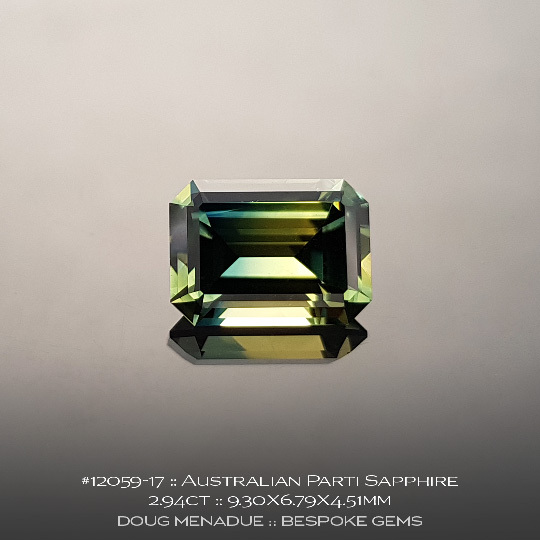 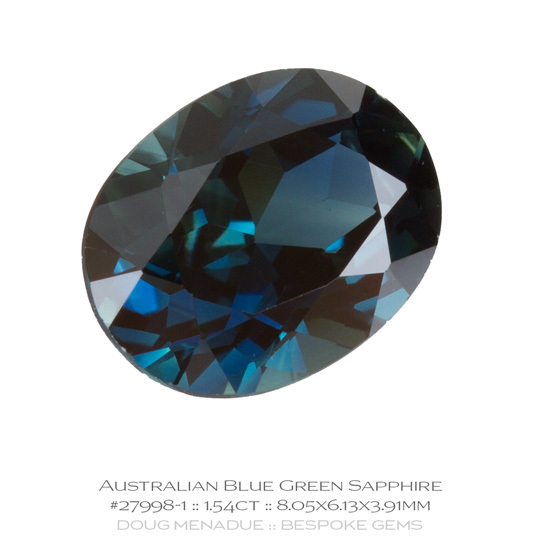 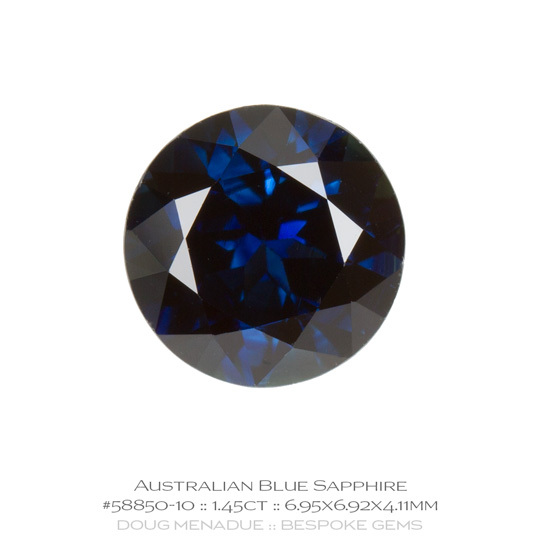 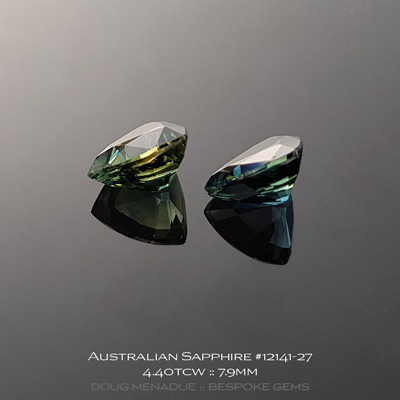 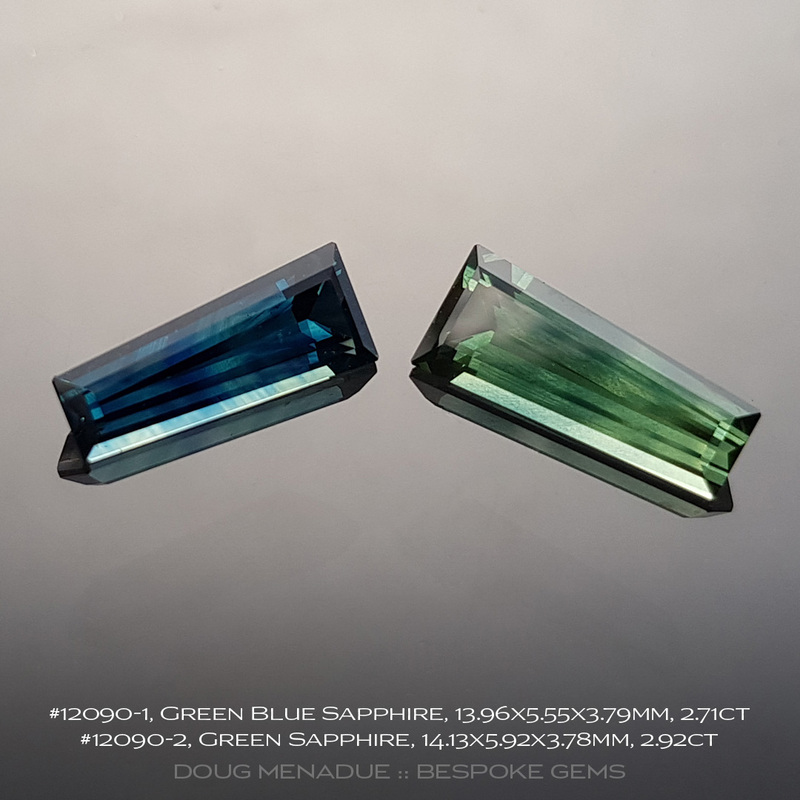 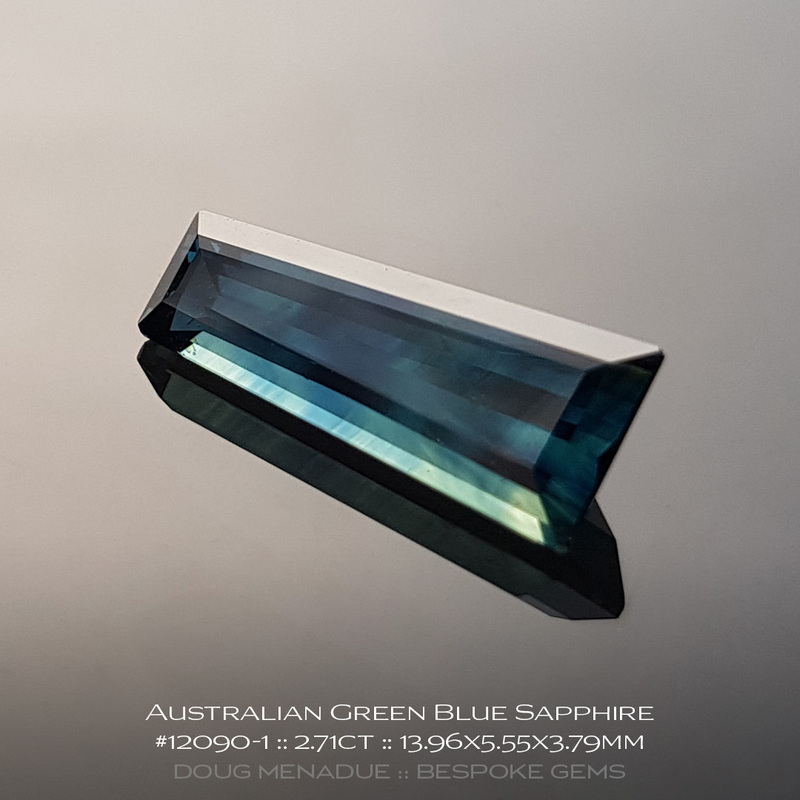 Comments : The deep rich velvety blue green hues of this Australian sapphire are just divine. 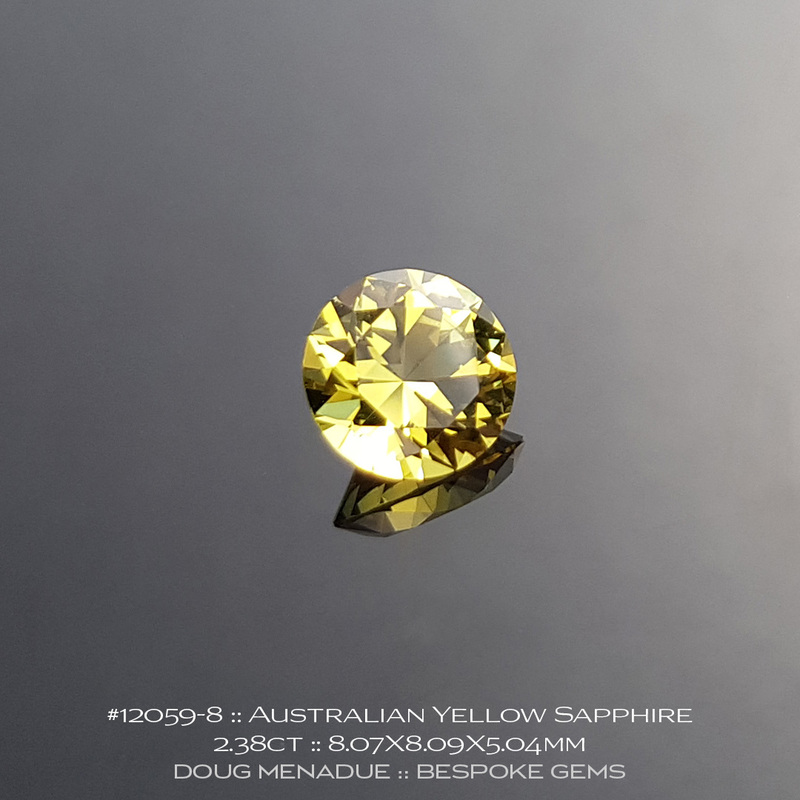 It's a fine stone indeed and has been cut in the classic Trillion style and is brigher then it appears in the pics. It would make a superb ring setting. 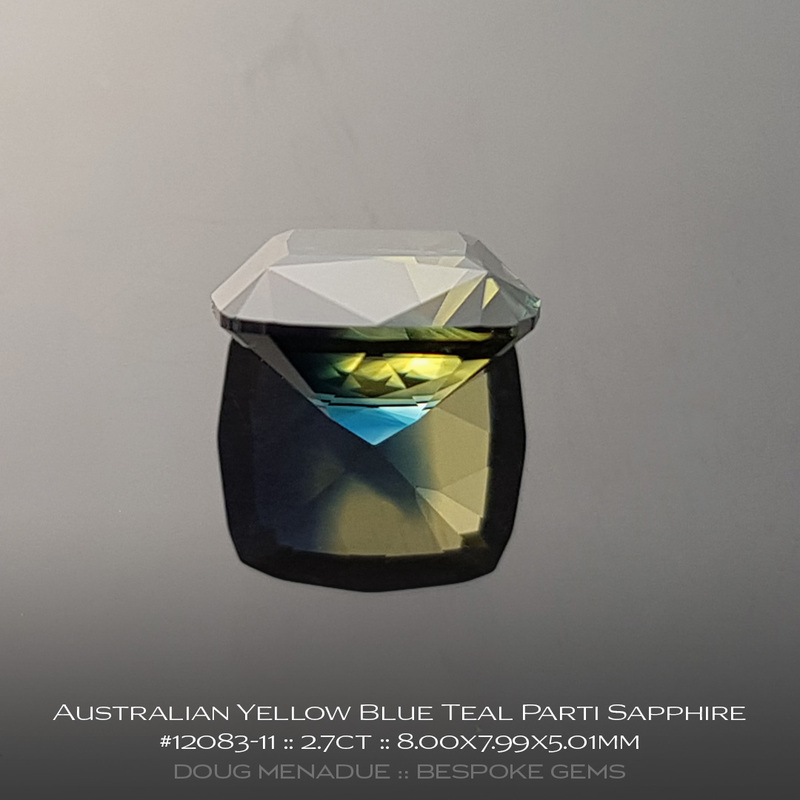 Comments : Here is an Australian sapphire that has yellow blue parti colours. 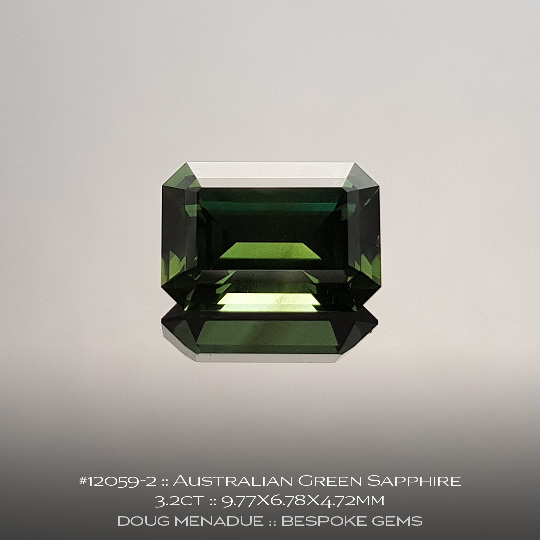 It has been very nicely cut and polished in the classic Emerald Cut design and would be easily set by a jeweller into any jewellery setting. A fine stone and uniquely Australian. Comments : Here is a very rare Australian sapphire! 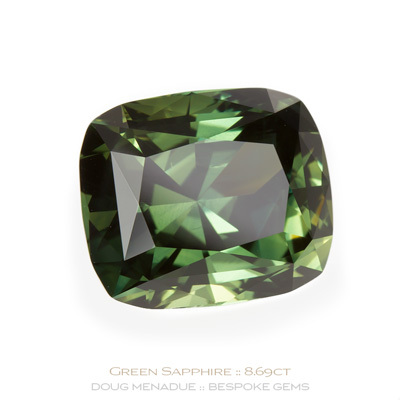 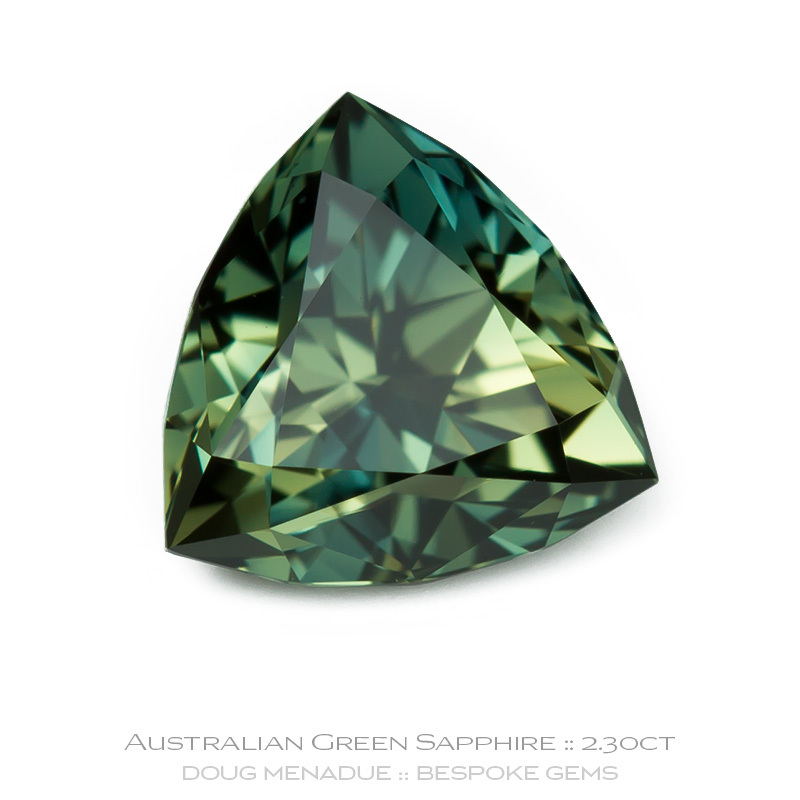 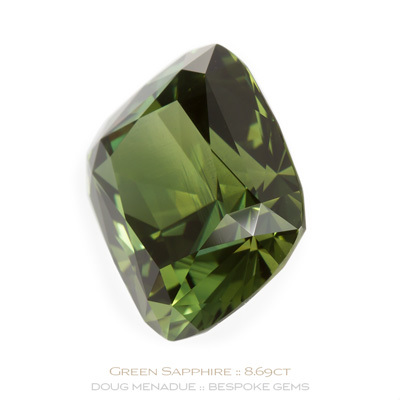 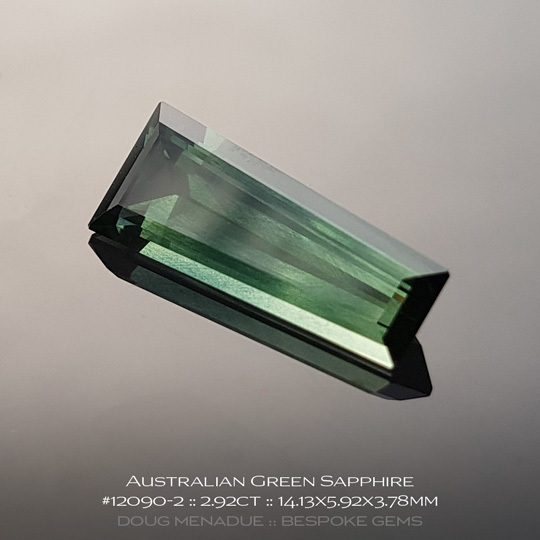 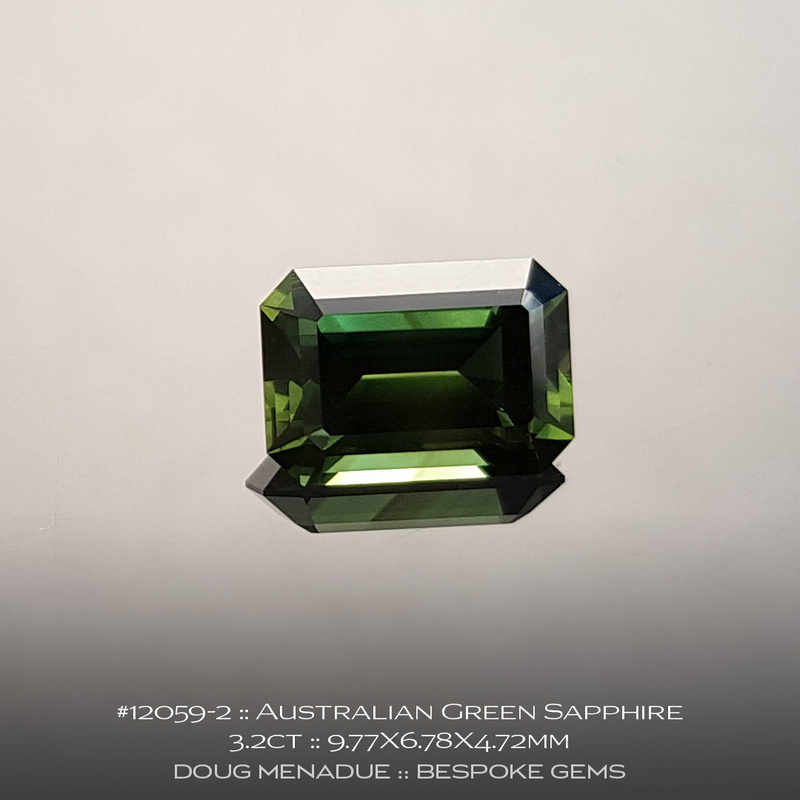 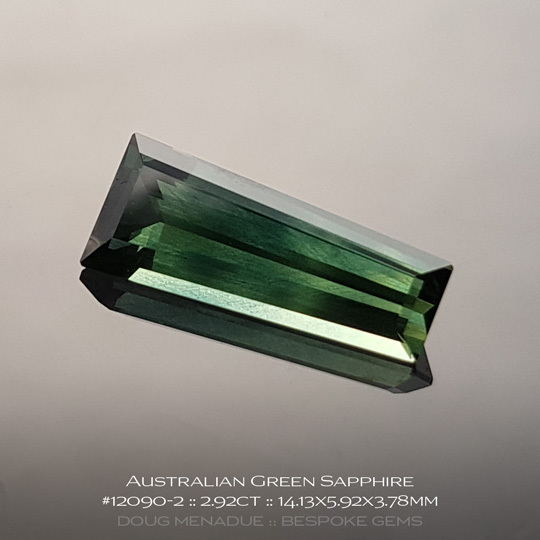 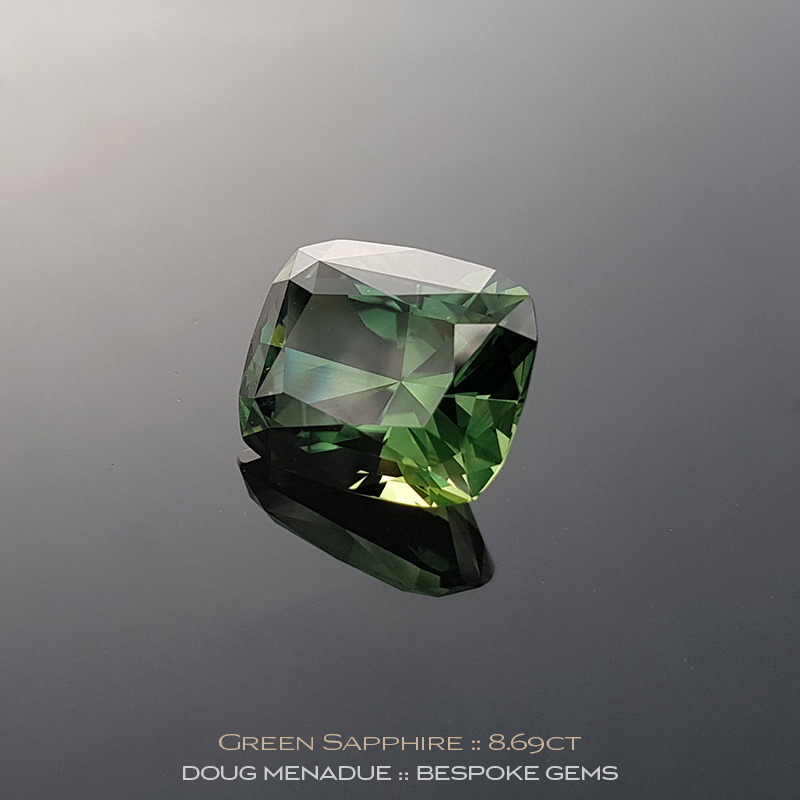 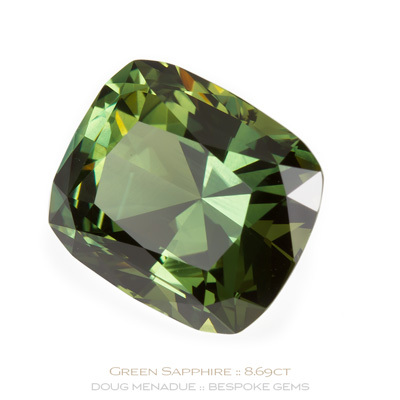 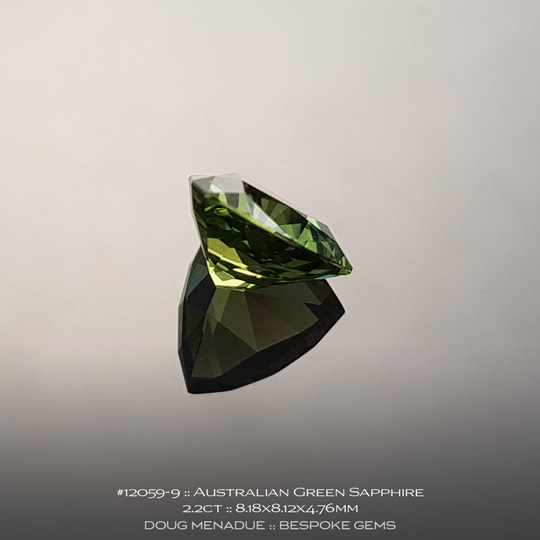 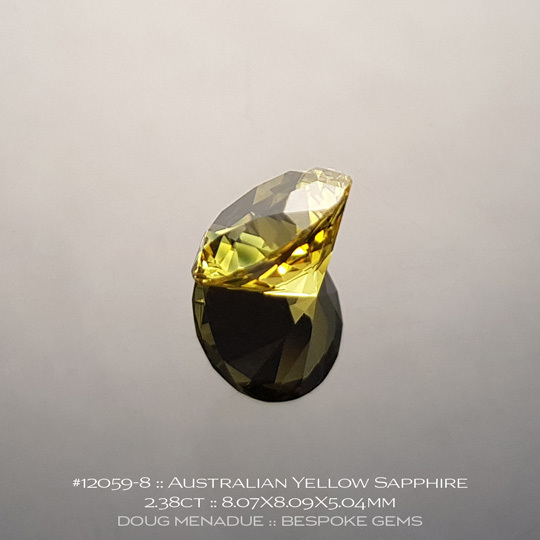 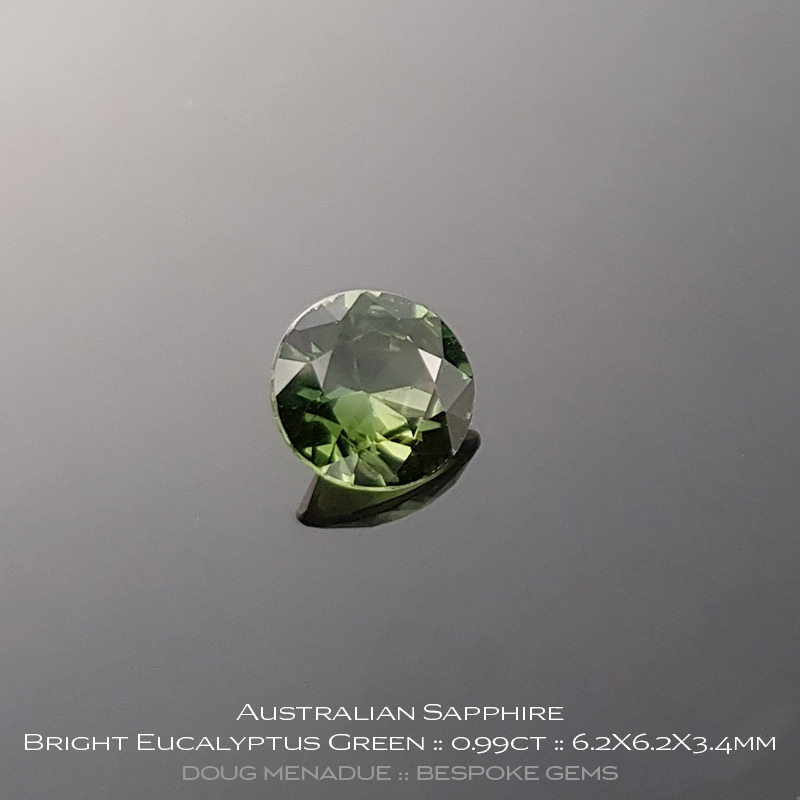 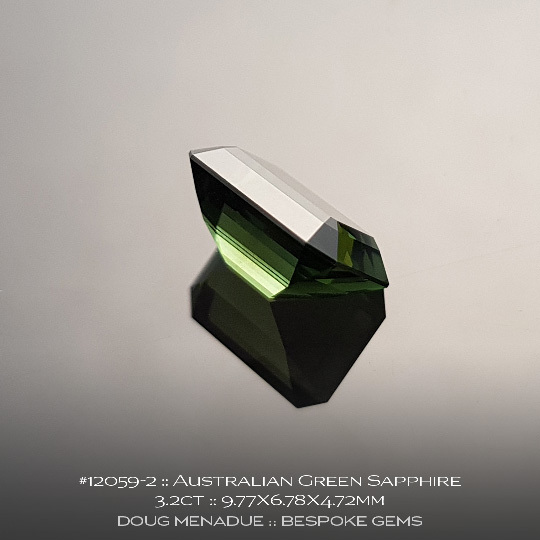 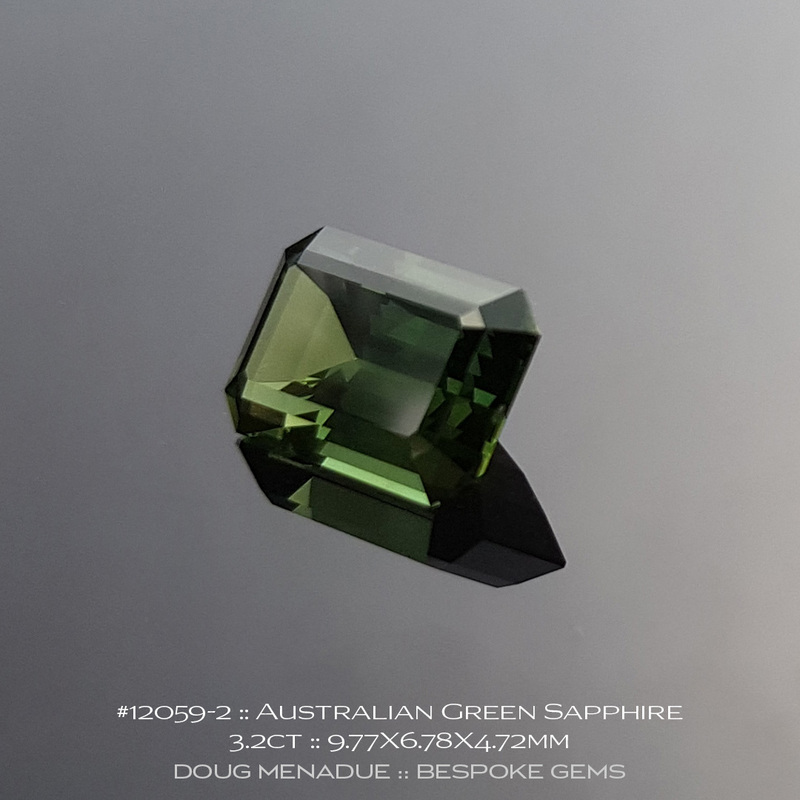 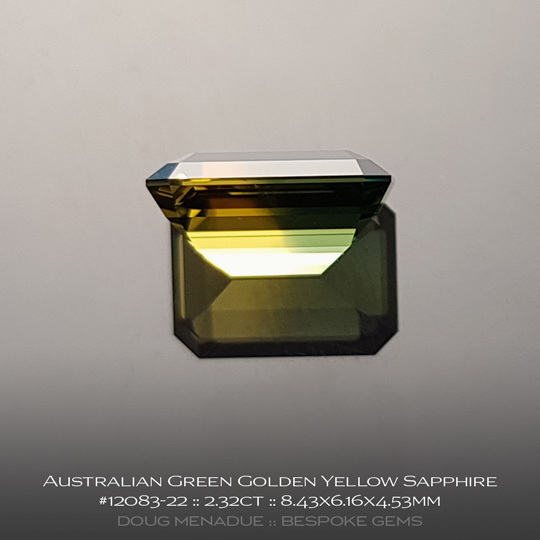 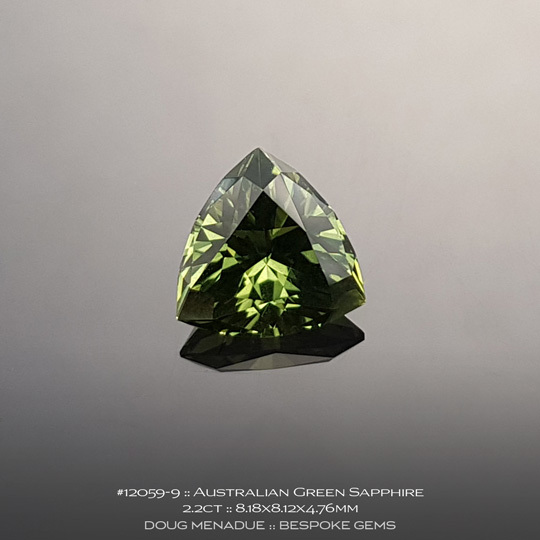 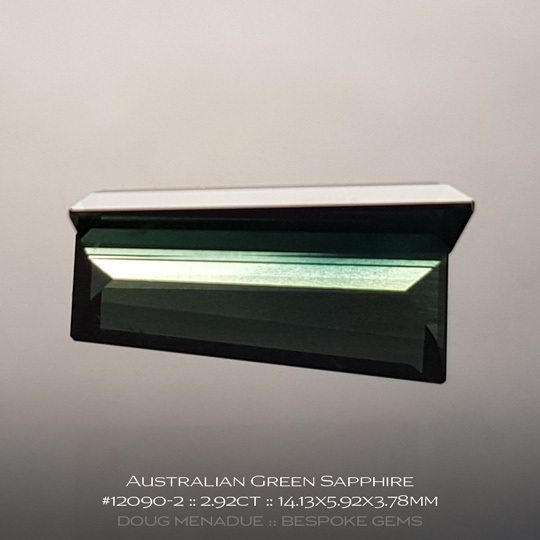 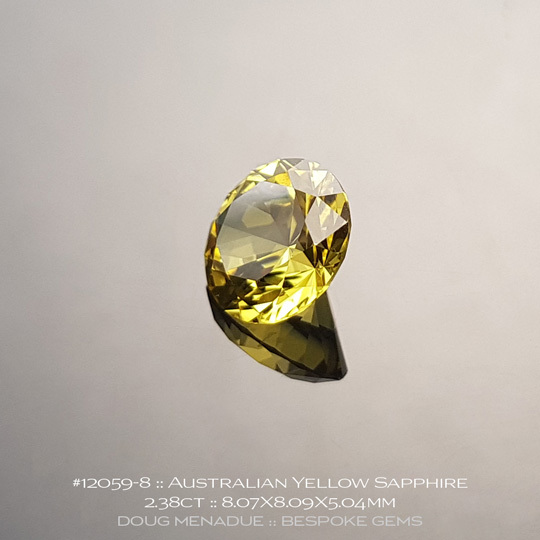 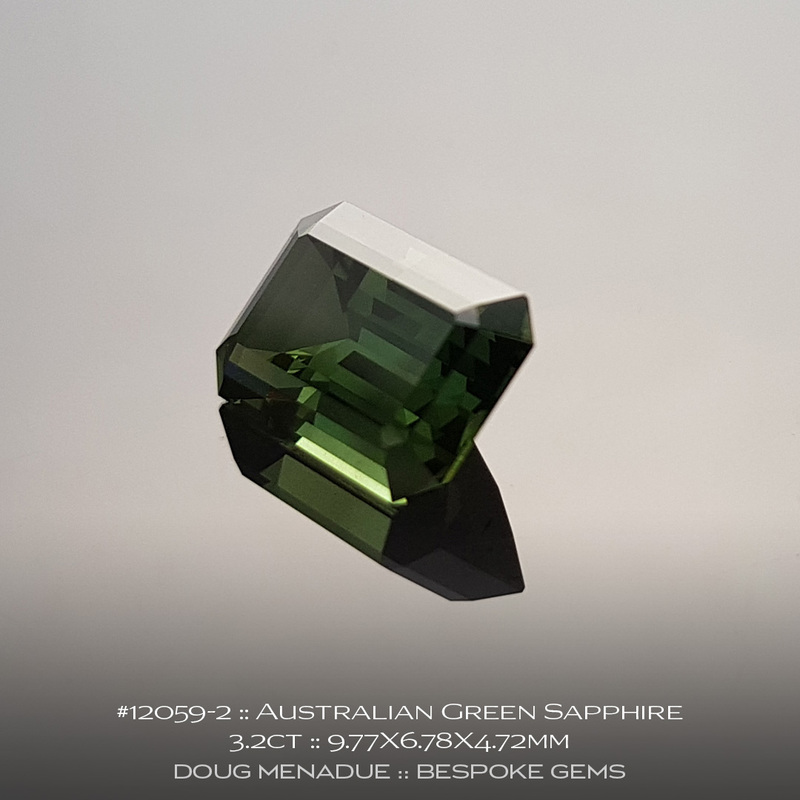 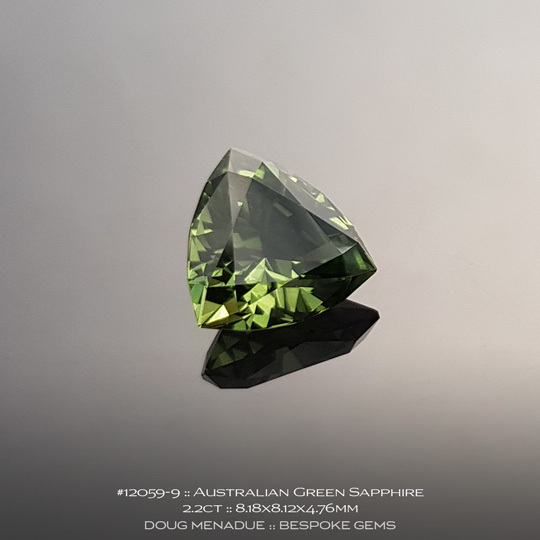 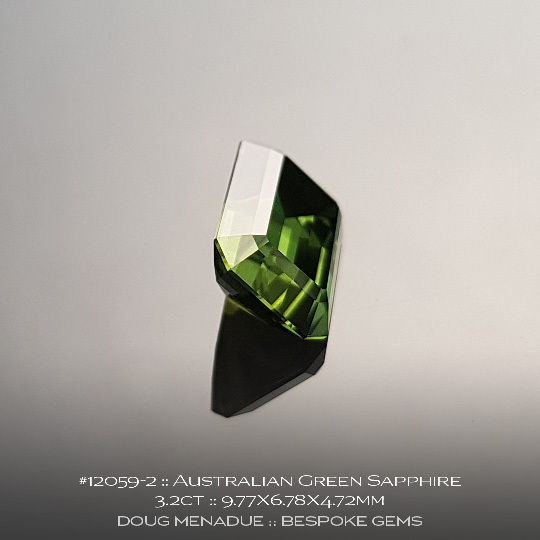 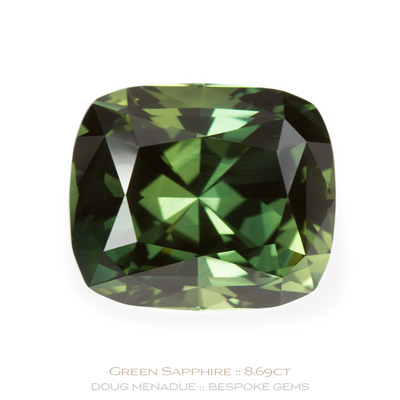 It is an outstanding Australian green sapphire that ticks all the boxes. It has a wonderful green colour with subtle variations in hue, ideal saturation, it's large, beautifully cut and polished and a classic rectangle cushion design. 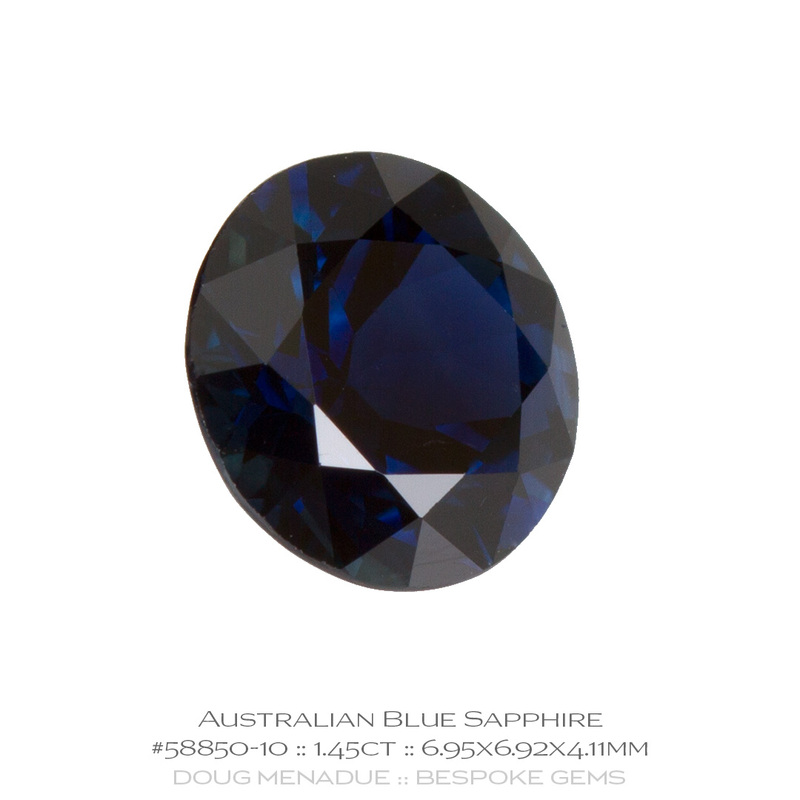 Large Australian sapphires of this calibre are very few and far between. 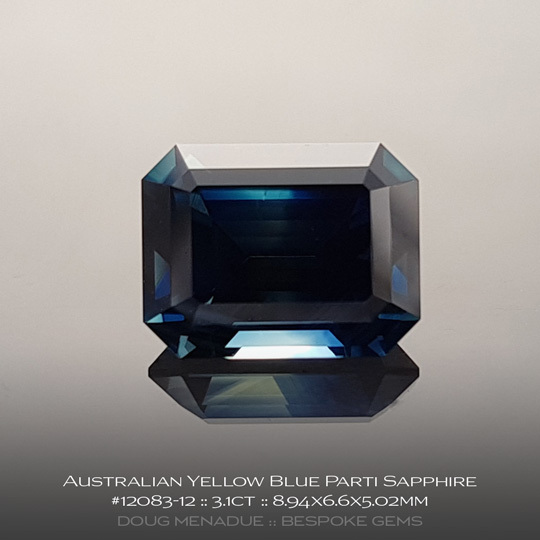 A superb sapphire that will make a killer ring! Some of the pics suggest a yellow tint... in the hand the stone is just a beautiful green. 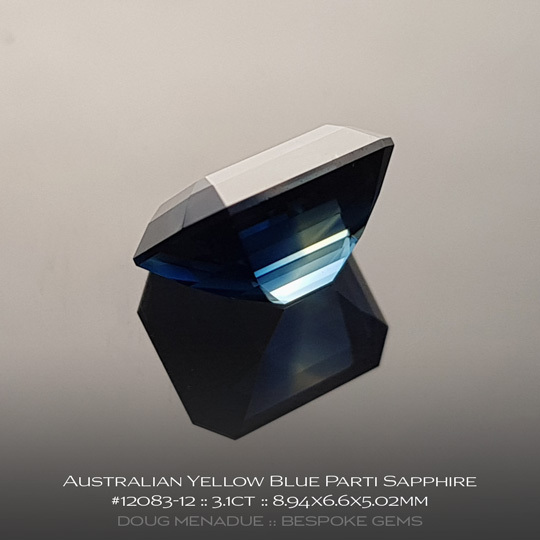 Comments : This is truly an outstanding and very bright Australian sapphire. 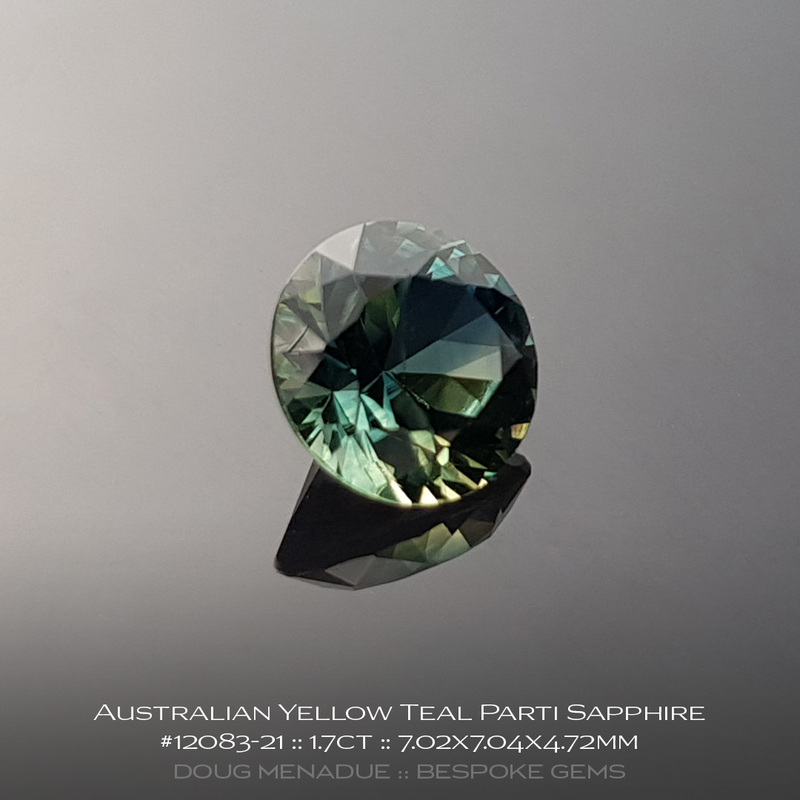 It has an interesting colour palate, it is a sort of greenish teal with a touch of yellow. 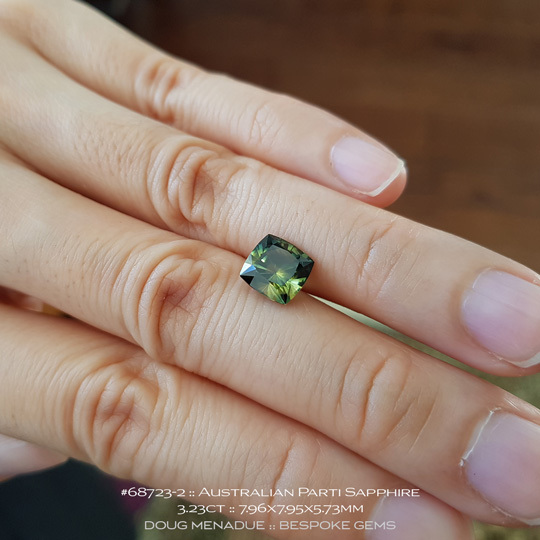 It reminds me very much of the leaves on the Australian eucalypt trees, really Australian colours. The design is a beautiful trillion and the stone is very bright and lively. 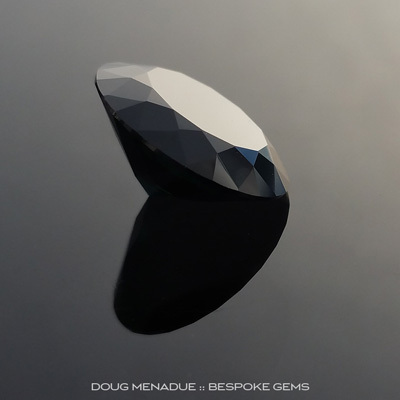 This is a very fine gem and one that I highly recommend and know that you will love. 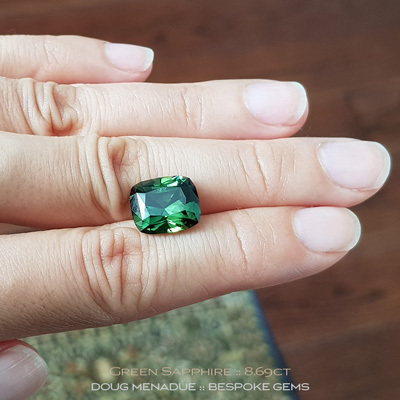 Perfect for a ring or a pendant, an ideal size. 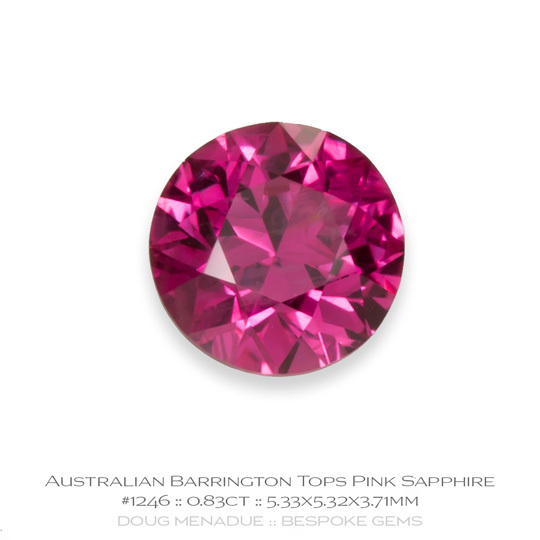 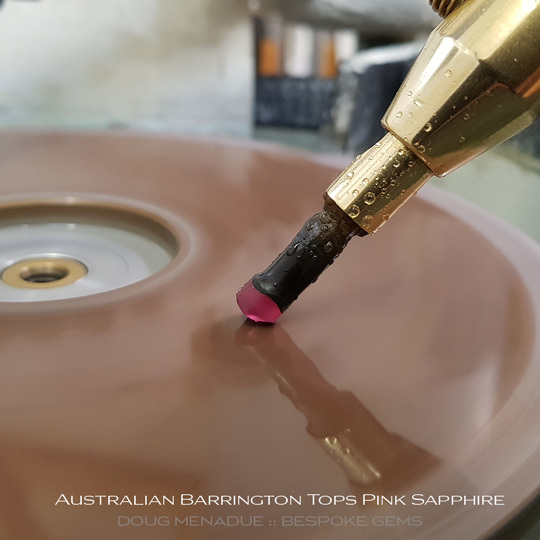 Comments : When it comes to rare Australian gemstones, Barrington Tops pink sapphires and rubies are certainly among the rarest and most desirable. They are also not widely known about. 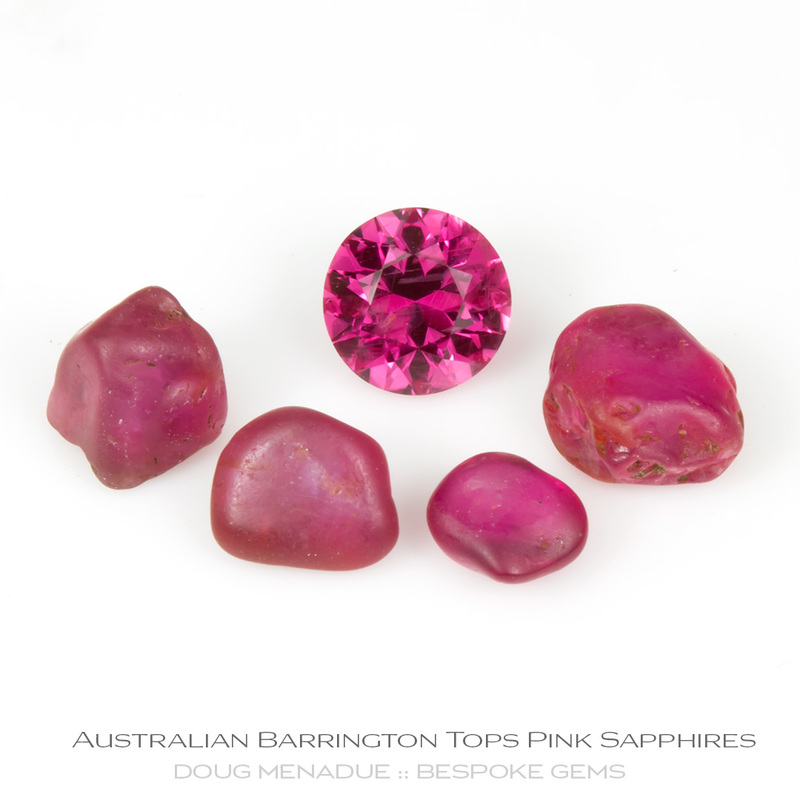 These remarkable pink sapphires from this location are usually small and test positive for chromium using a Chelsea filter. 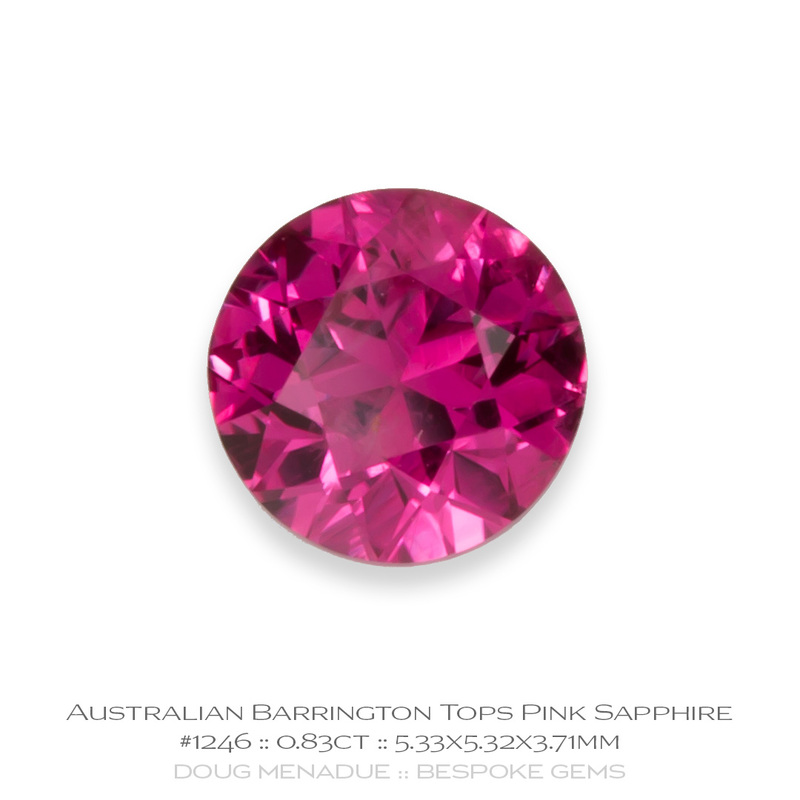 The colour of this sapphire is a strikingly intense vivid pink. 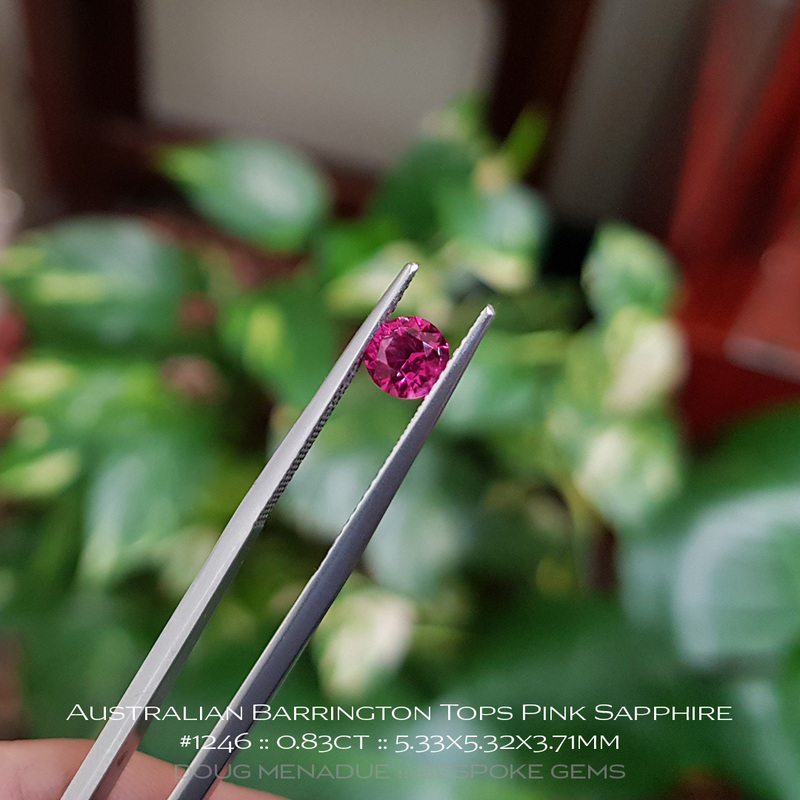 I have seen alot of pink sapphires from around the world but all of them pale in comparison to the incredible rich hues of these stones. 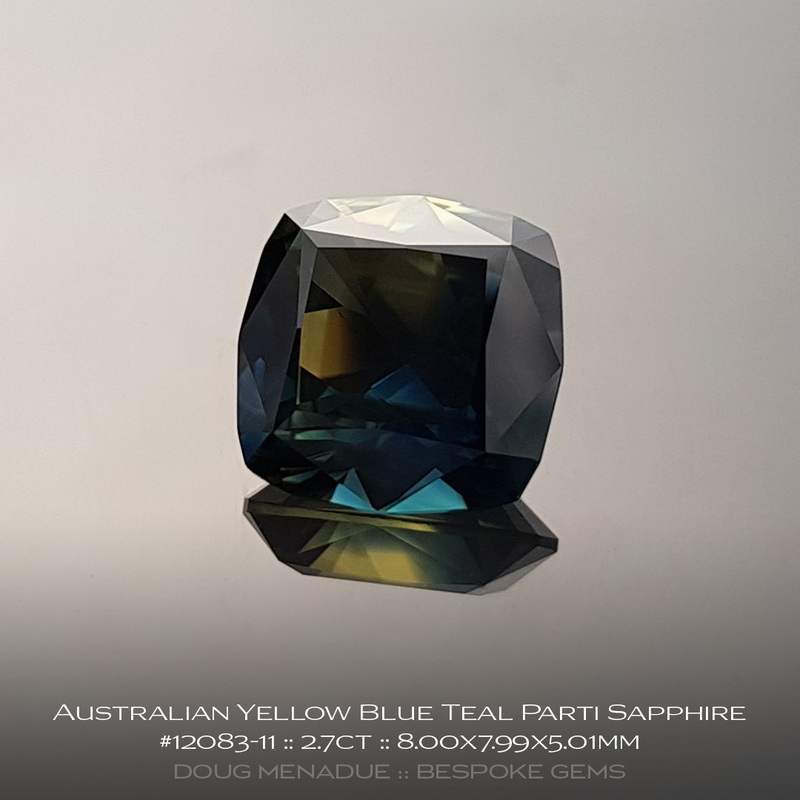 When I cut this gem, well, it simply took my breath away and exceeded all expectations... the pics do no do this sapphire any justice at all. 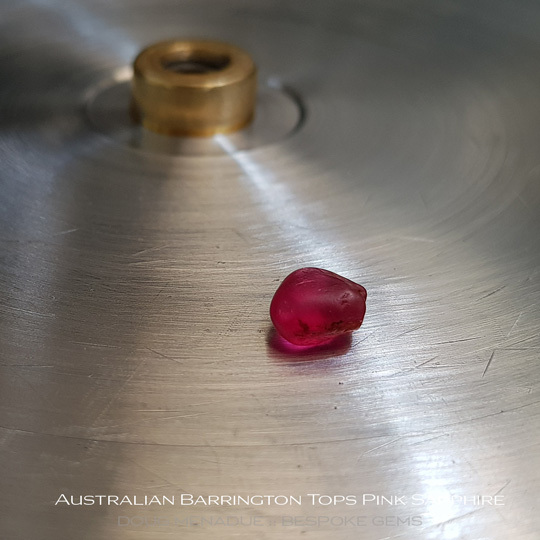 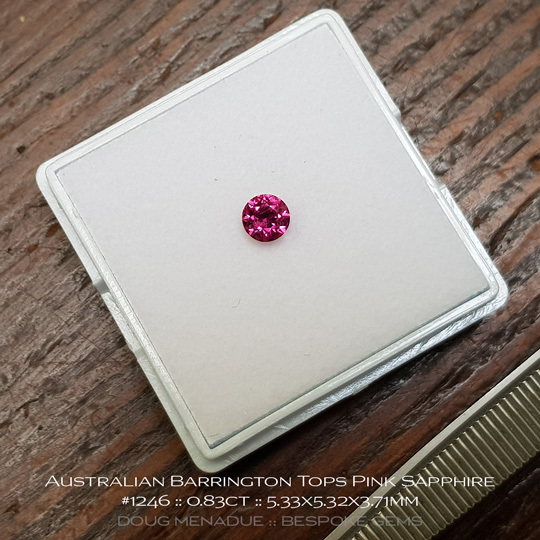 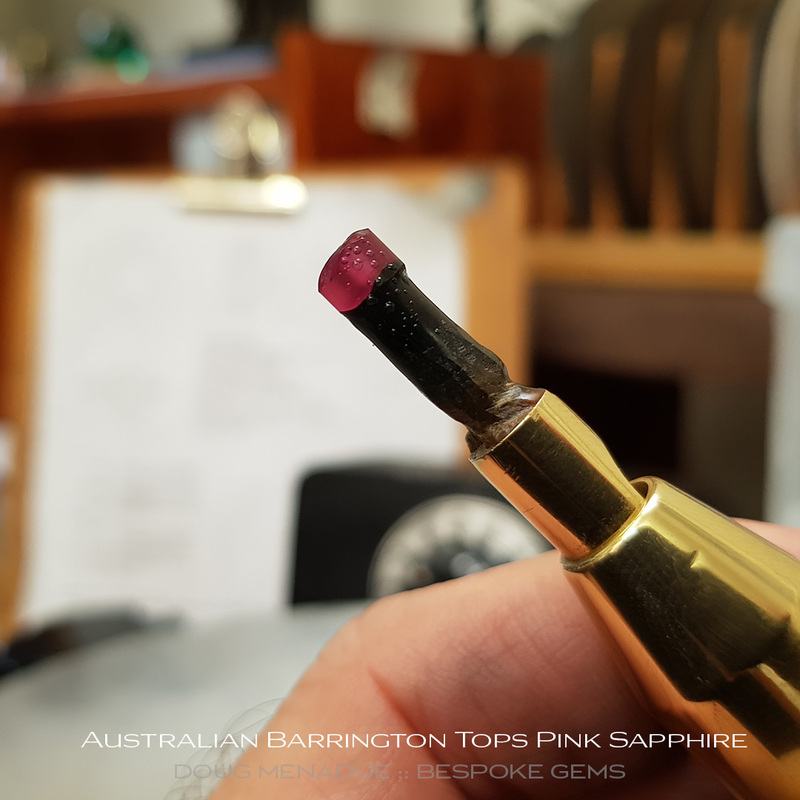 Apparently, and as only the luck of a multi-millionaire could have it, good deposits of the Barrington Tops pink sapphires and rubies were (and no doubt still are) found on a property owned by the Packer Family! 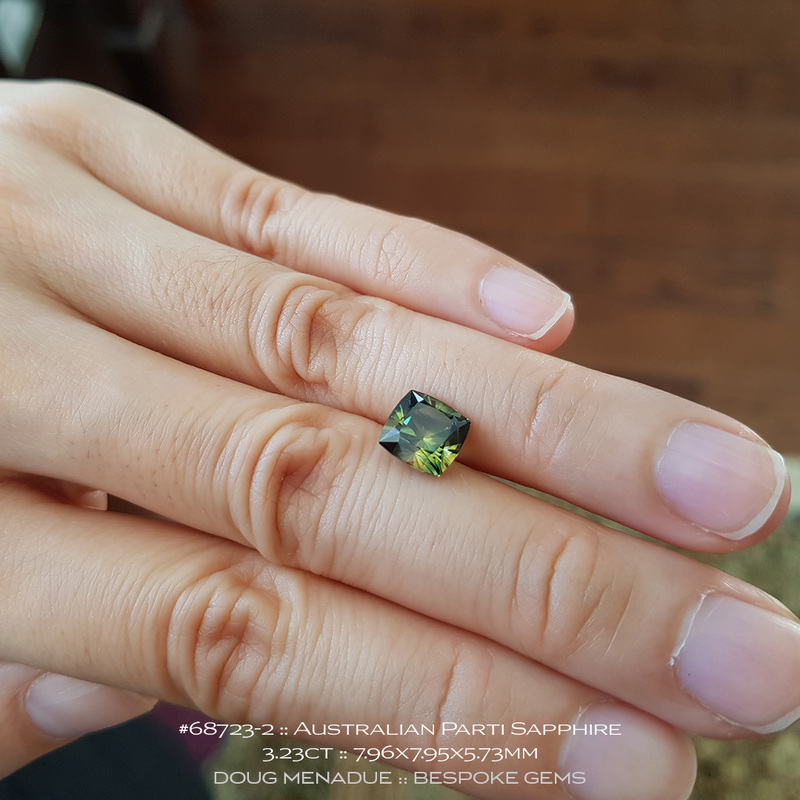 There was a small scale mining operation at one point but I believe it closed a while back. Not sure if much is dug or found up there anymore. 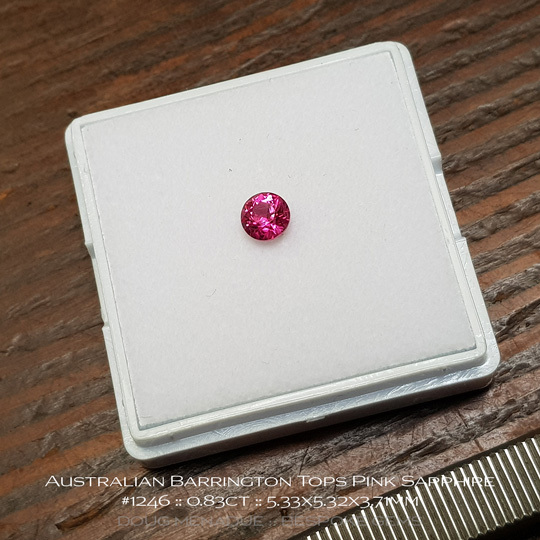 I would love to know more about these pink sapphires if anyone out there knows some history or has some of these wonderful stones. 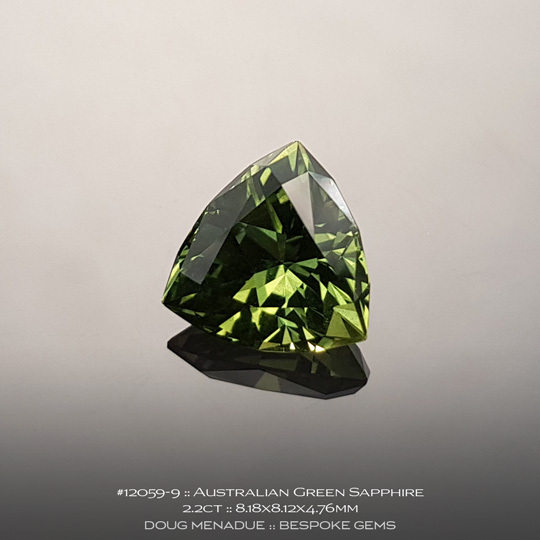 SEE THE ORIGINAL ROUGH STONE HERE. 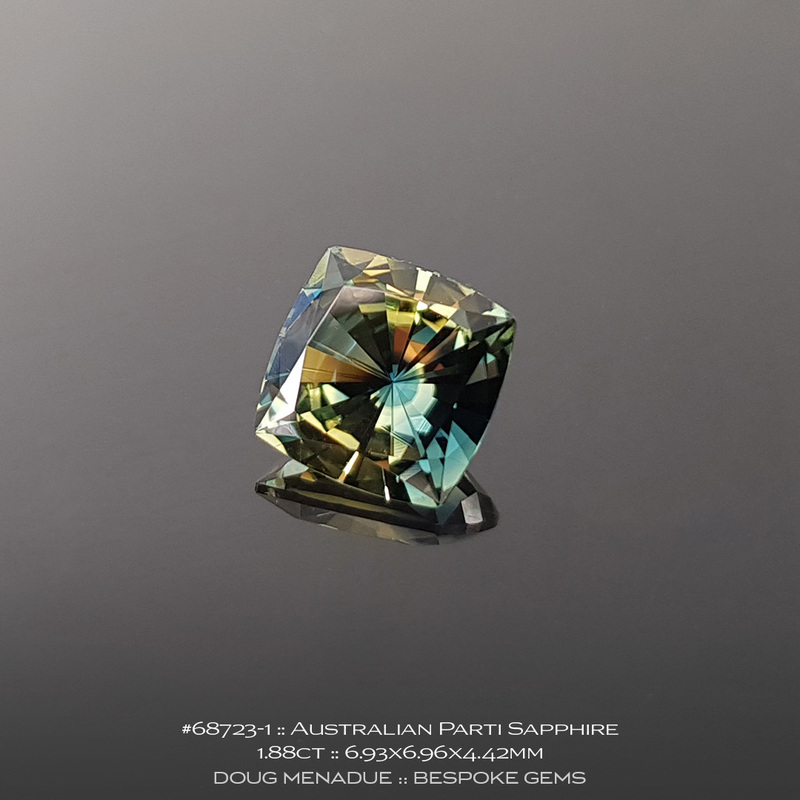 Comments : A bright and lively natural Australian parti sapphire square cushion. This is a stunning gem with lots of life and action and a wonderful play of colours contained within. 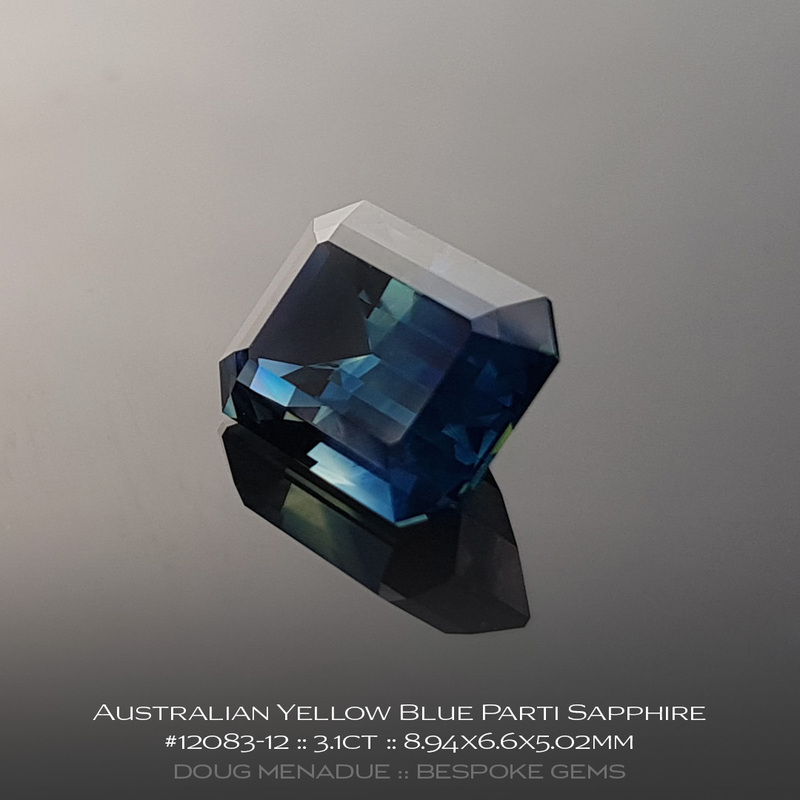 A really sweet Australian sapphire. Comments : An ideal little Australian sapphire with a very bright and beautiful appearance. 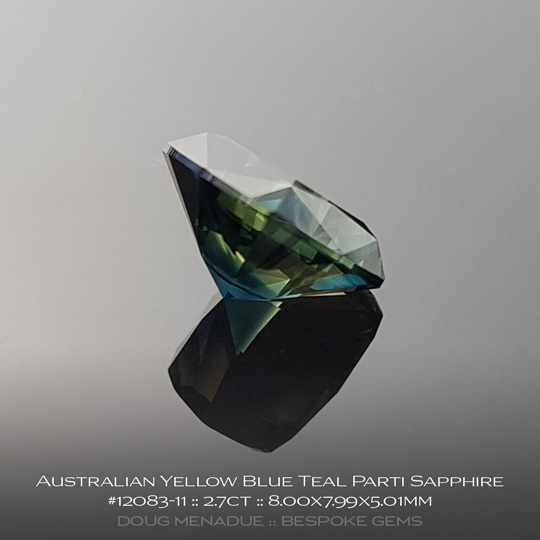 It is a very lively stone and I really do love the colours of this sapphire, the interplay of the yellow teal parti colours create a fascinating gemstone and with the colour combining going on also brings in elements of eucalyptus green. 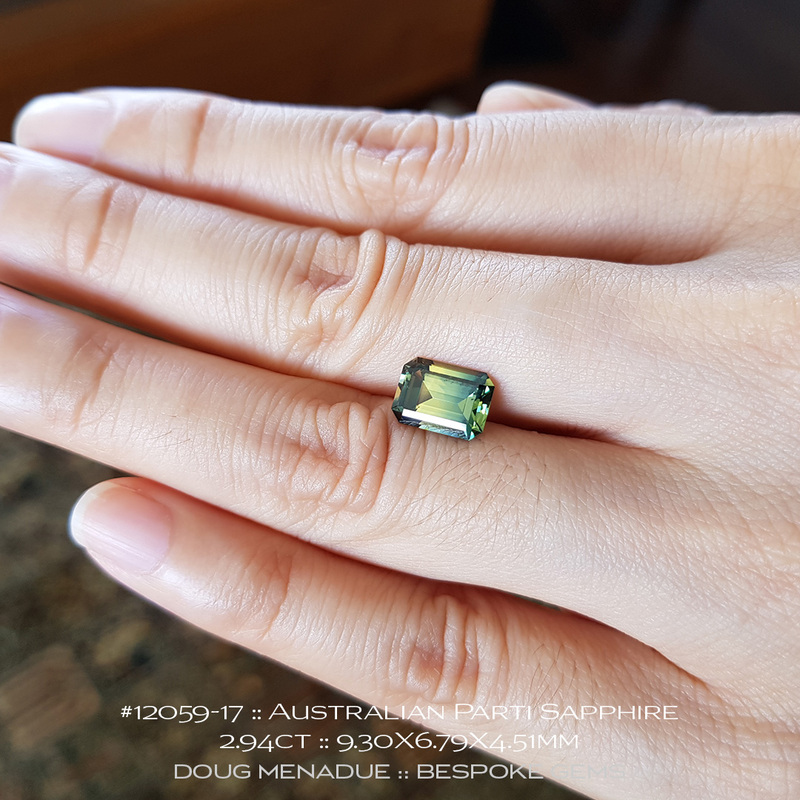 It is a perfect size for an everyday ring setting. 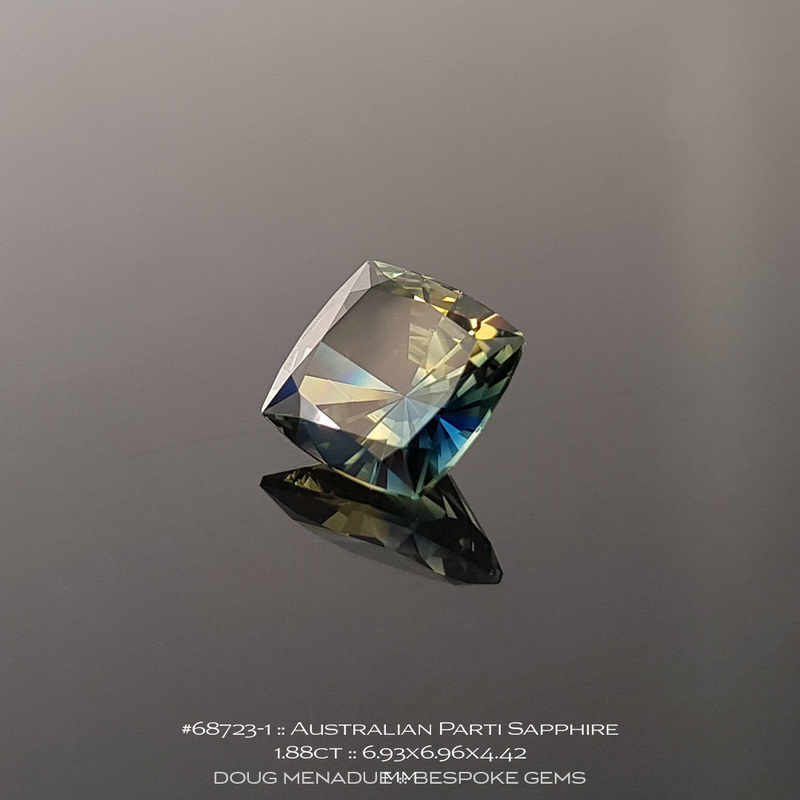 Comments : A marvelous natural Australian parti sapphire that has been precision cut and polished on the Australian gemfields in the classic Emerald Cut design. 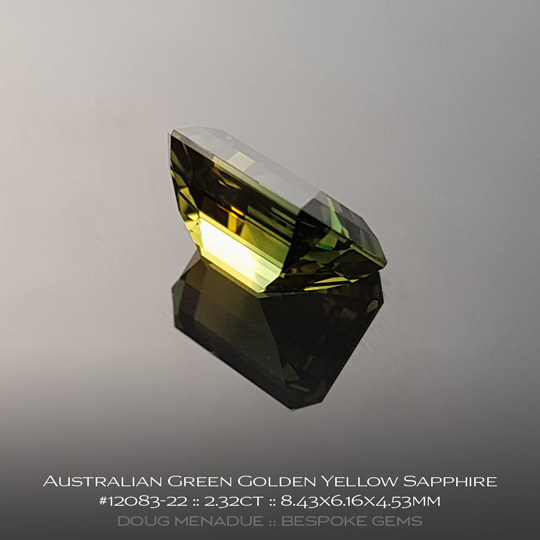 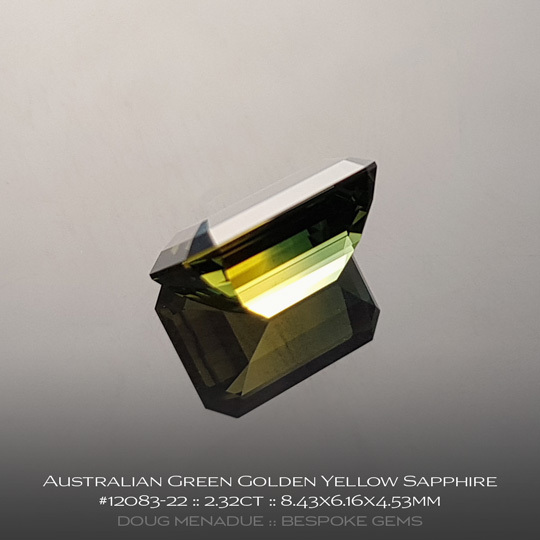 This is a truly Australian gemstone, showing the Aussie "Green Golden Yellow and gold"! 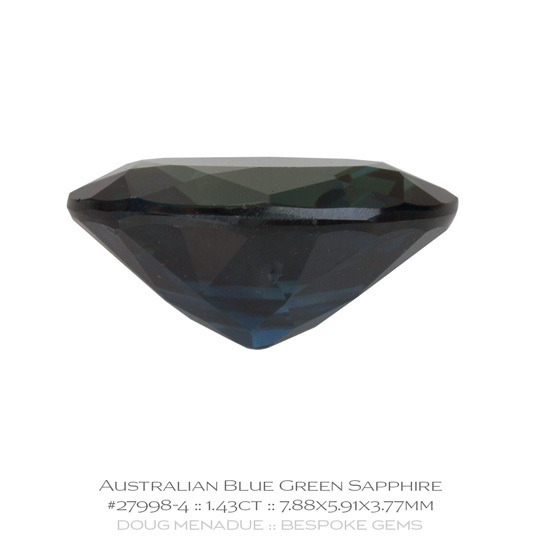 It is a very bright and lively gemstone and one that will make a stunning ring stone. 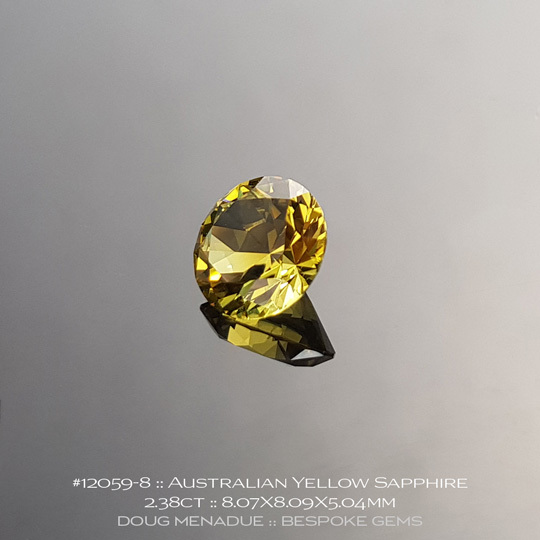 A truly stunning natural bright yellow Australian sapphire. 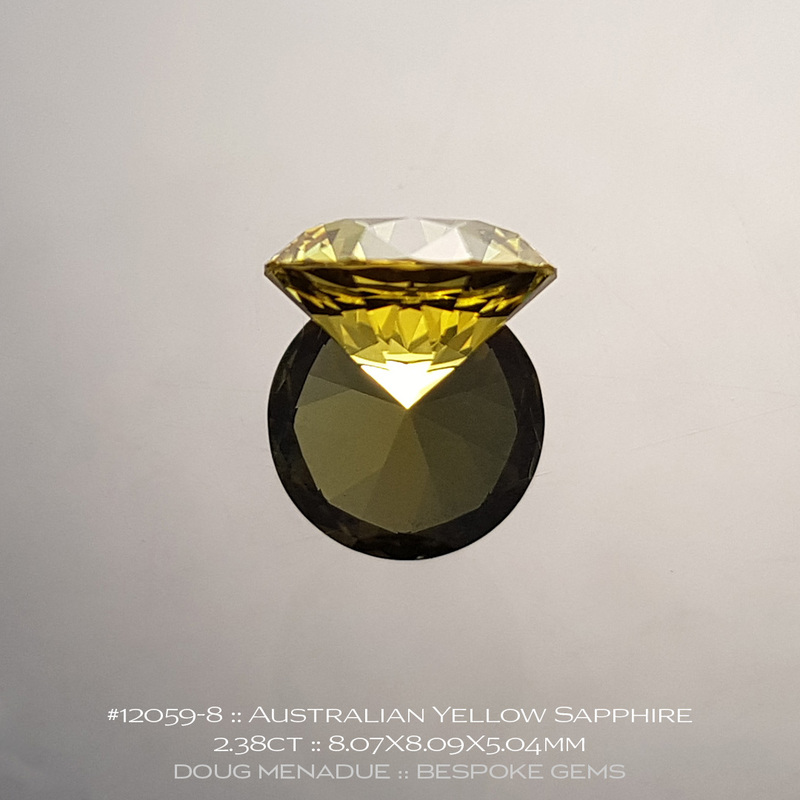 This beauty is eye poppingly yellow, striking and intense. 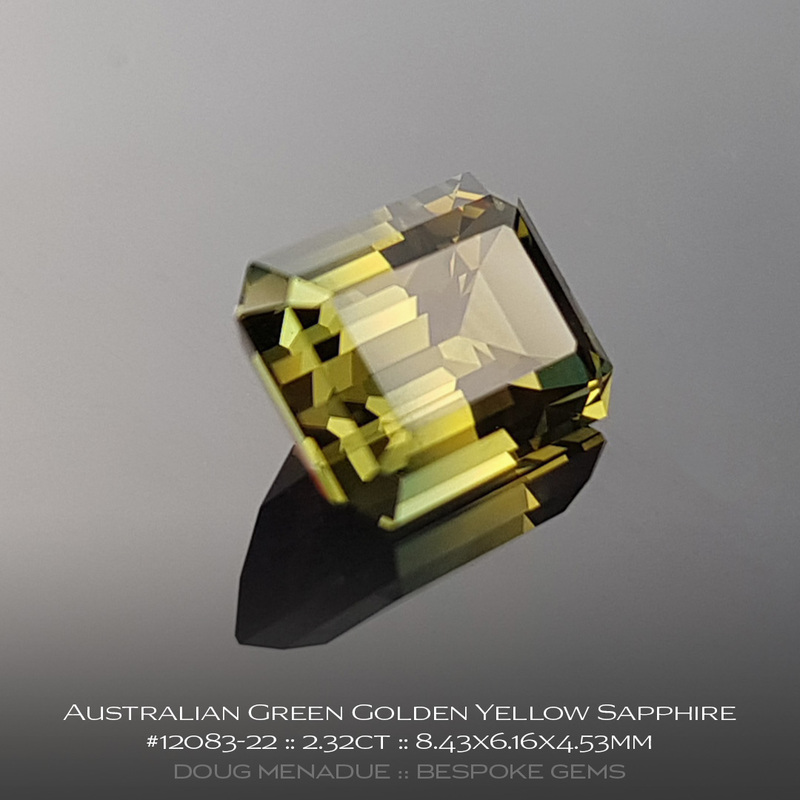 It is a remarkable Australian sapphire and comes from the "Willows" gemfield around Rubyvale in Central Queensland which is world renown for it's yellows and golden yellows that are found there. These are very collectable gemstones indeed and this one is an ideal size and shape - the classic Round Brilliant - for any jewellery setting but I personally think it would be a dynamite ring stone. Please note that my camera has trouble really capturing the yellow spectrum well... the pics suggest more brown and green then there actually is, in the hand the sapphire faces up a beautiful and vivid yellow. 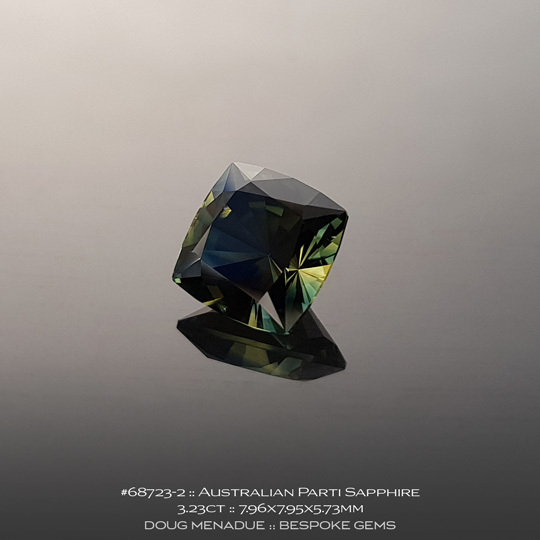 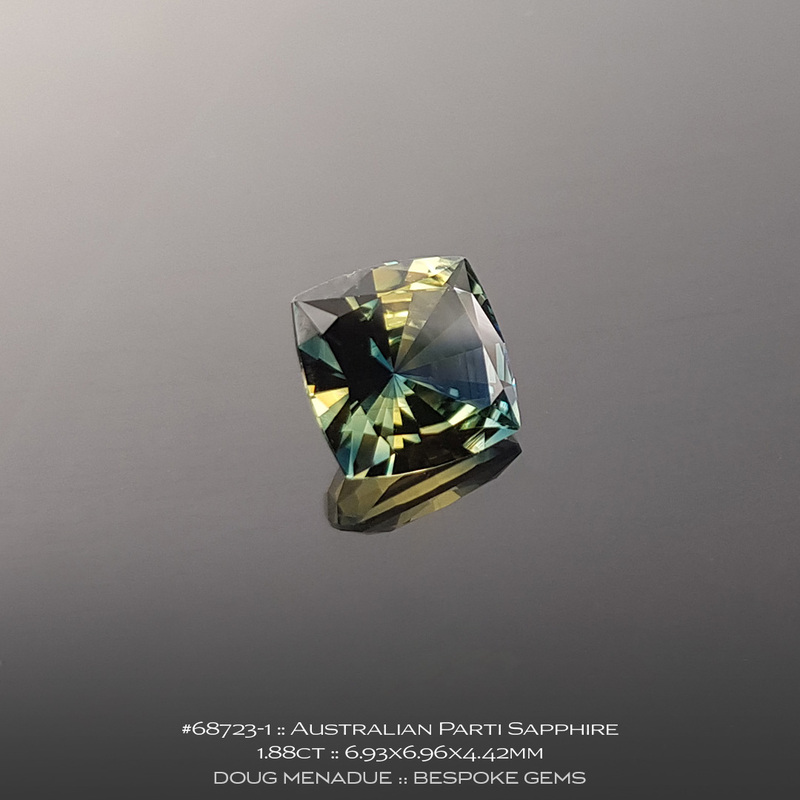 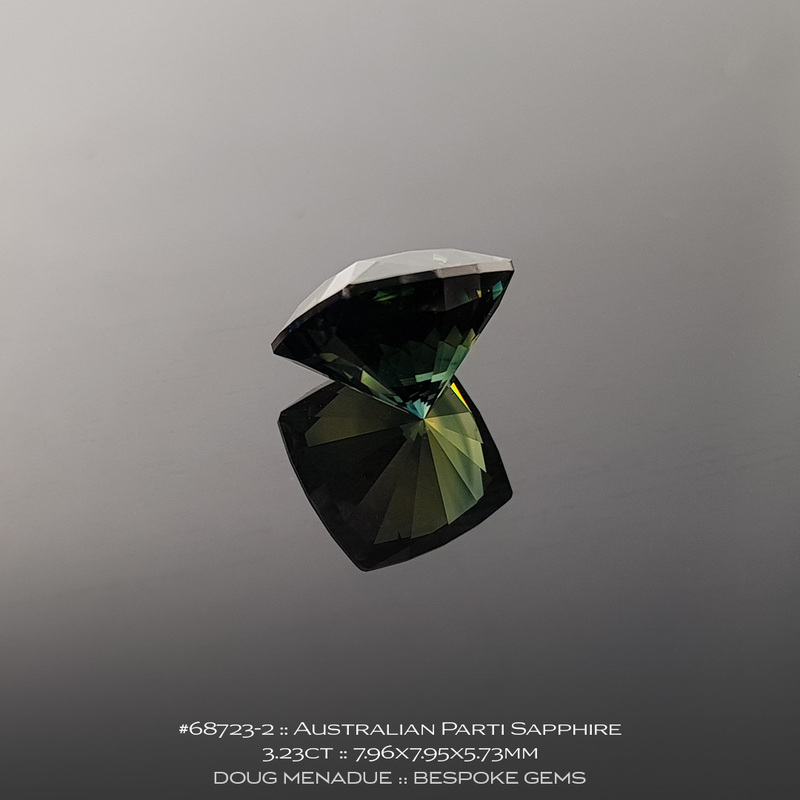 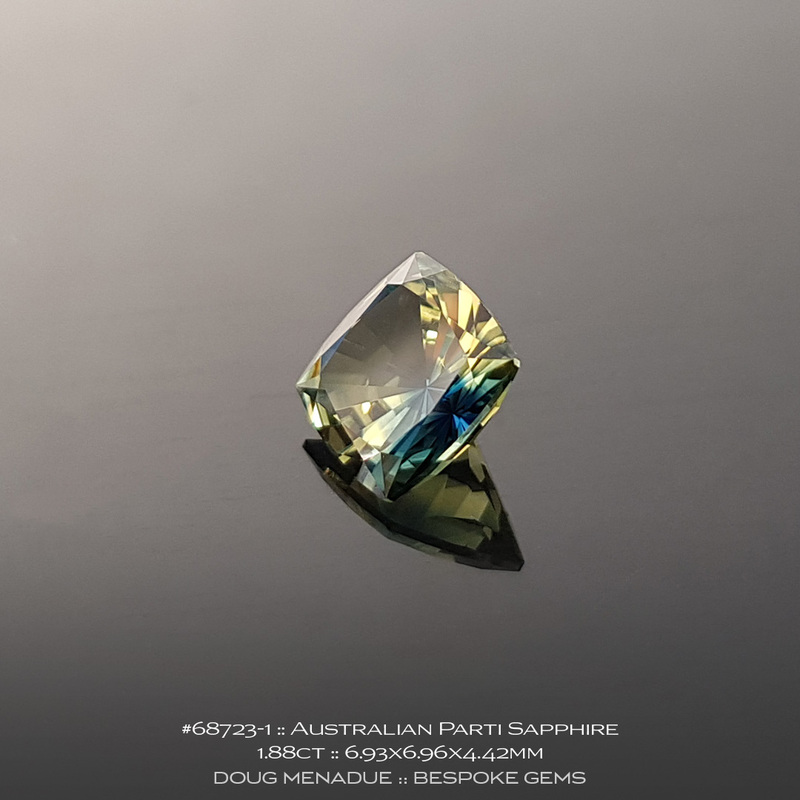 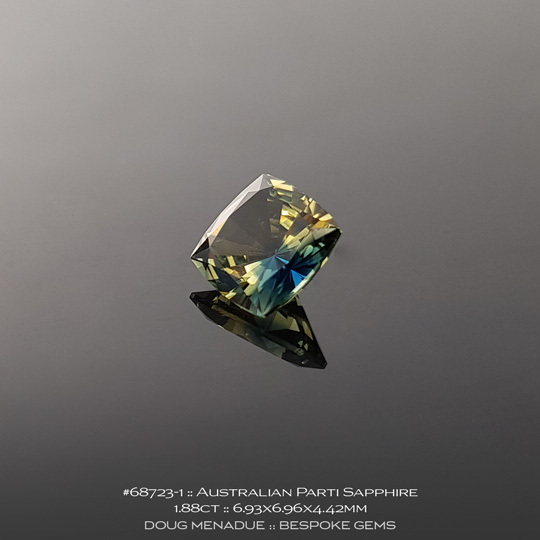 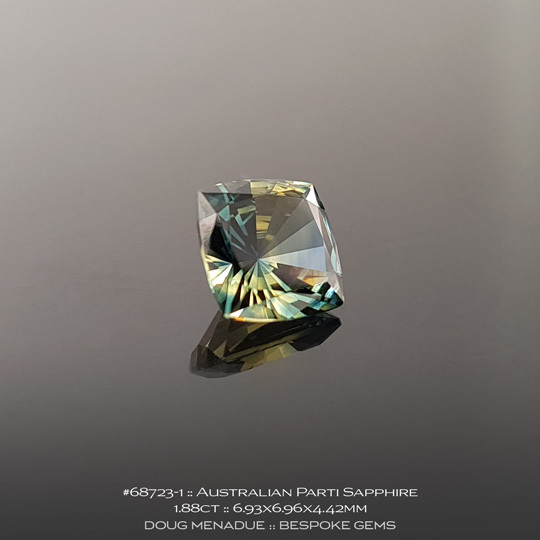 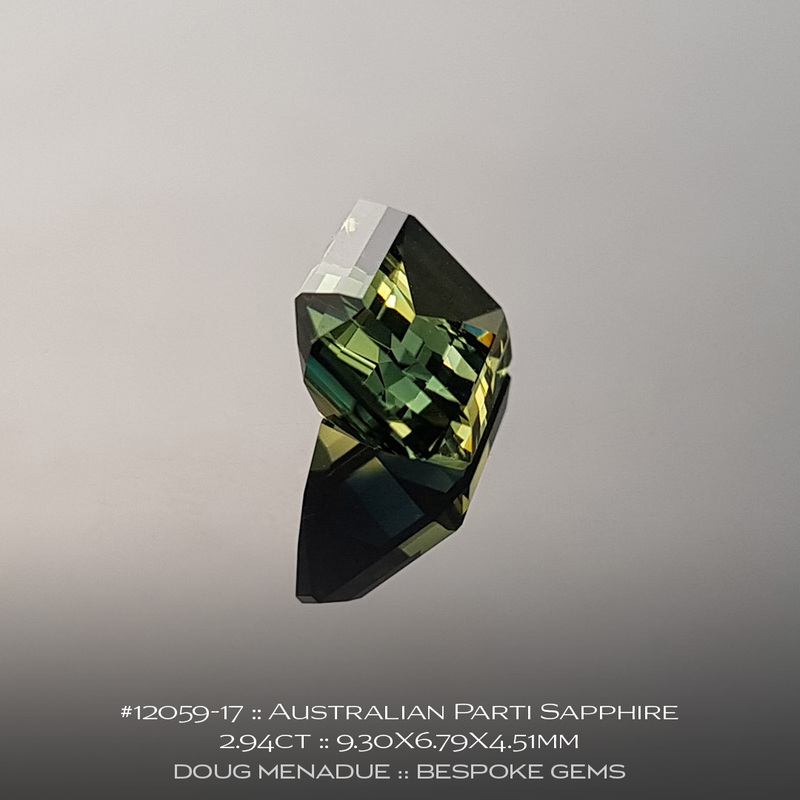 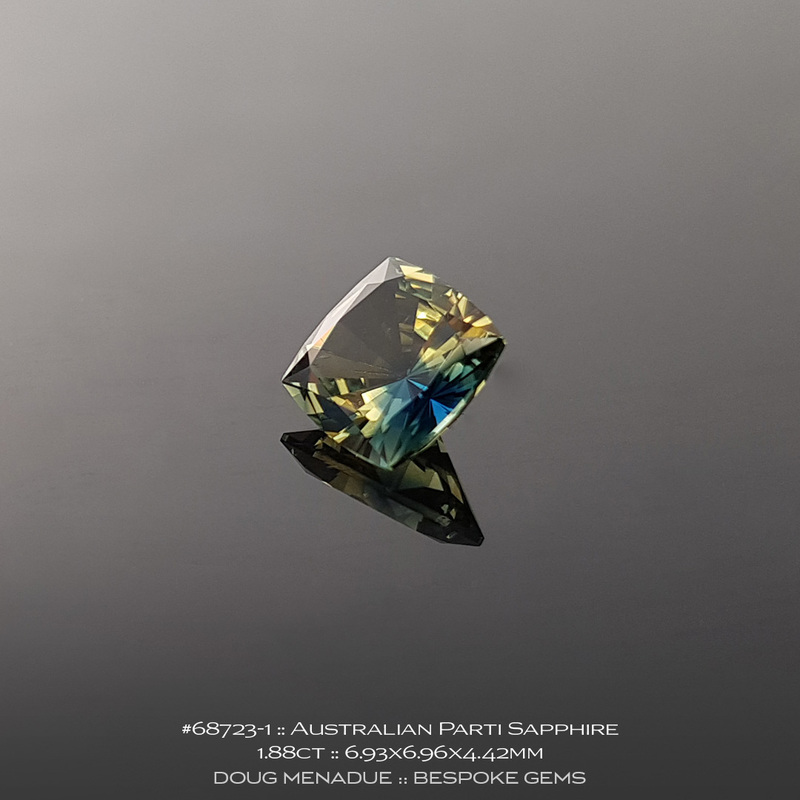 Comments : A truly superb natural Australian parti colour sapphires. 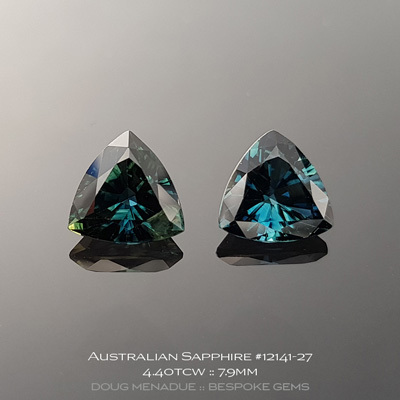 These parti coloured sapphires that are found around Rubyvale in Central Queensland are just magnificent. 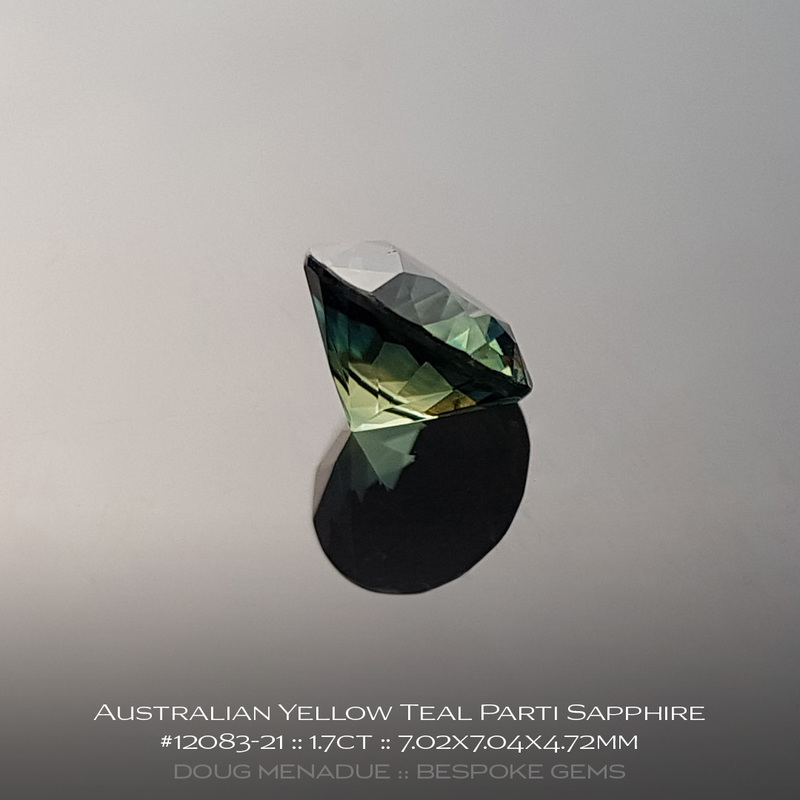 The pictures can never really capture the wonderful interplay of colours that dance within the stone. This gem has been precision cut and polished on the gemfields by a local cutter which brings out the best the sapphire can be. 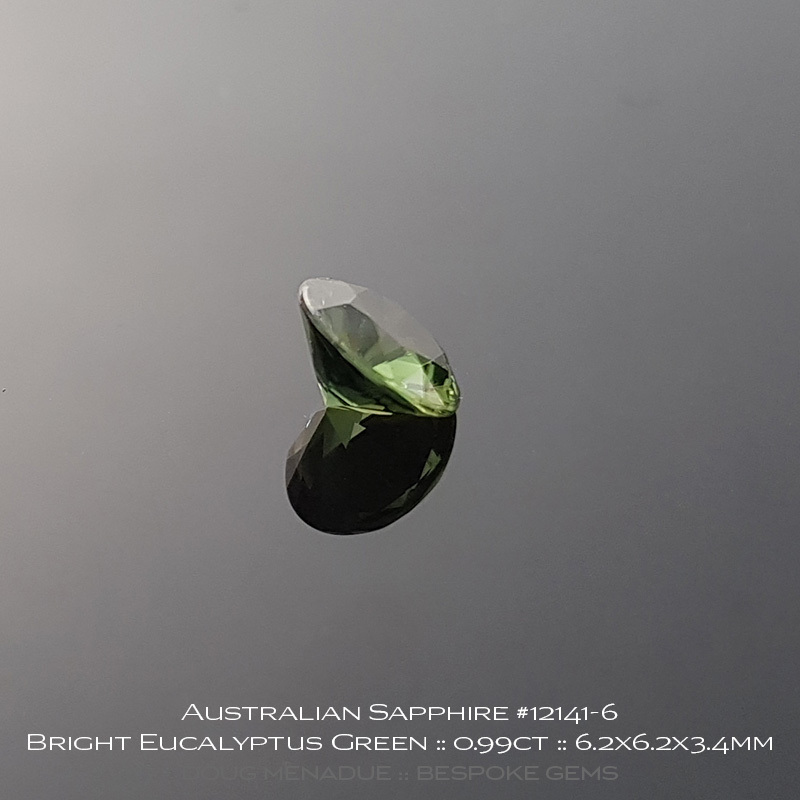 It is a beautiful some and perfect for any setting. 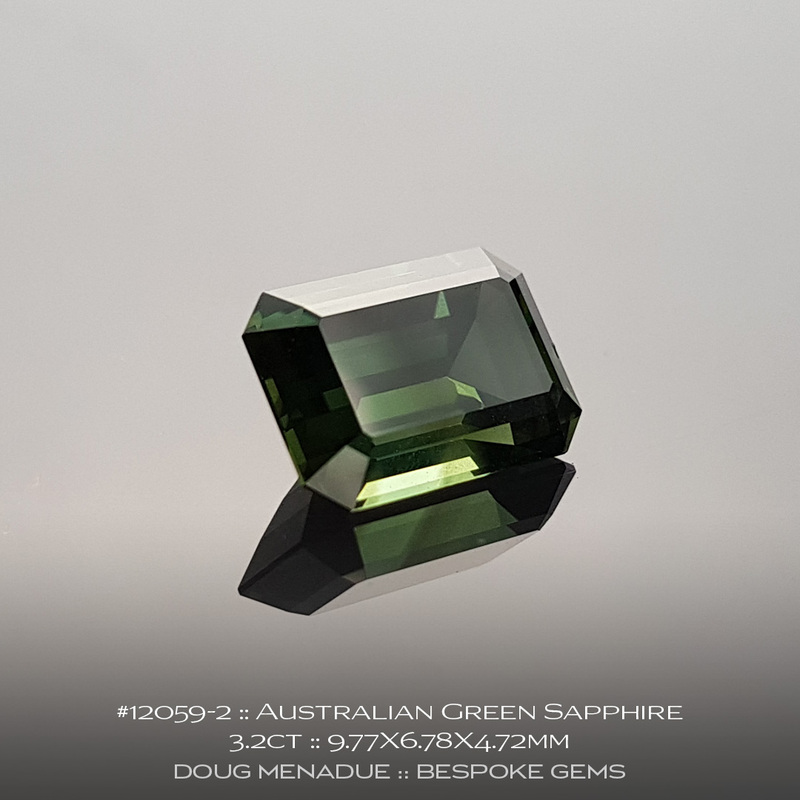 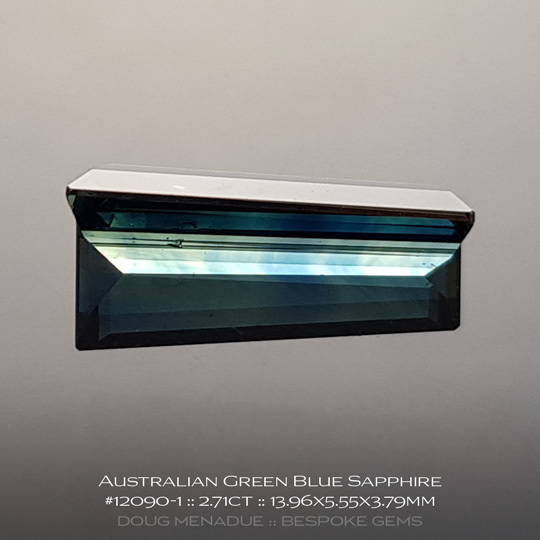 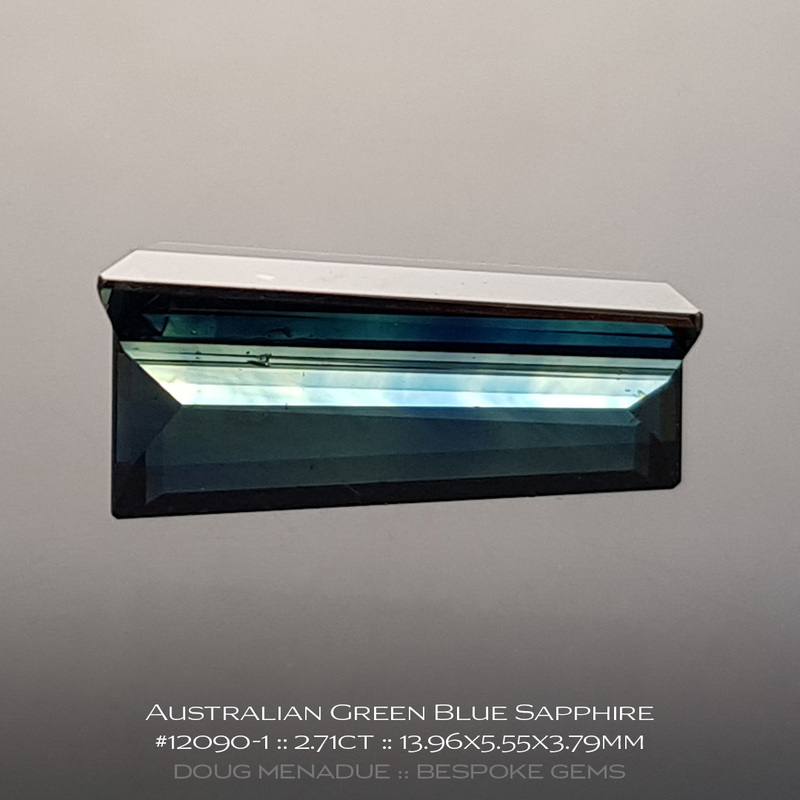 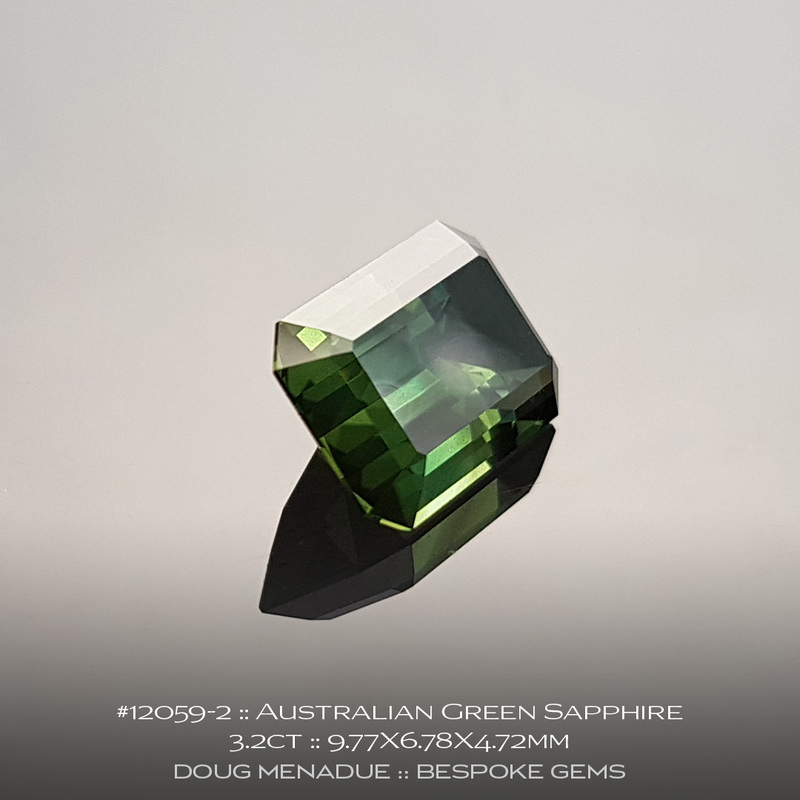 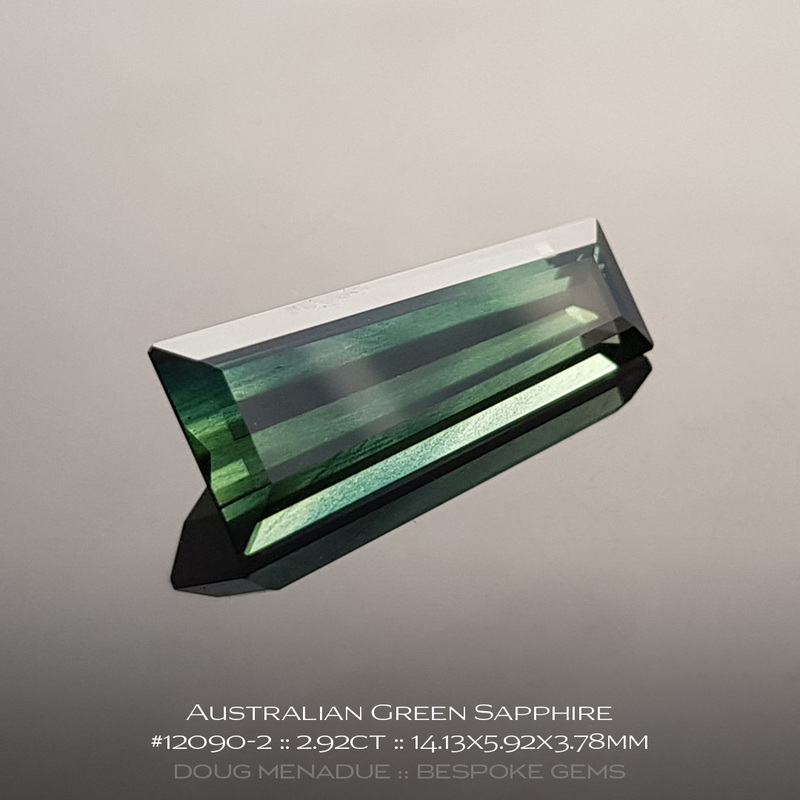 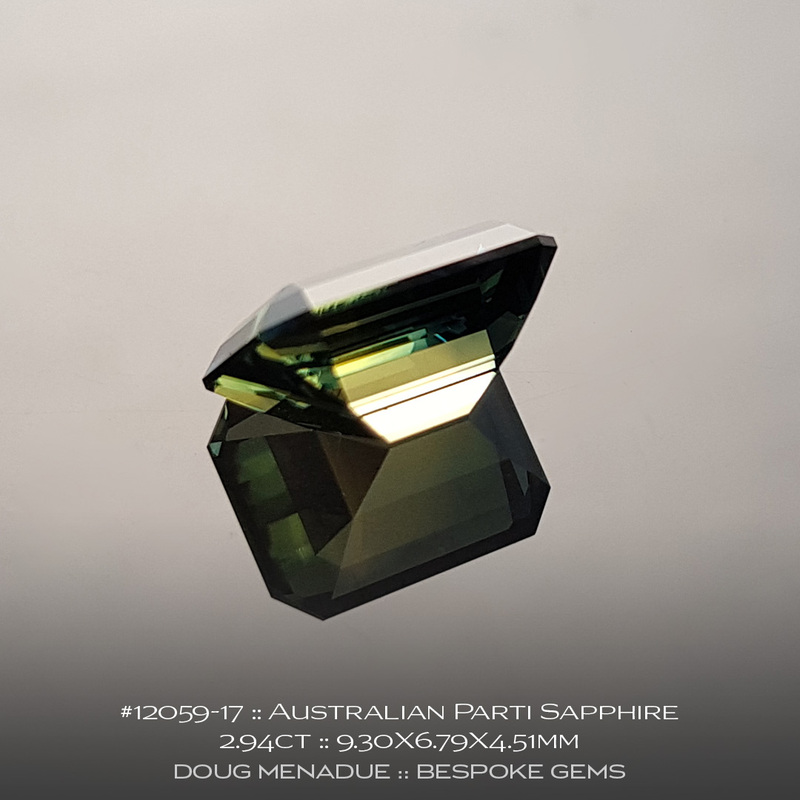 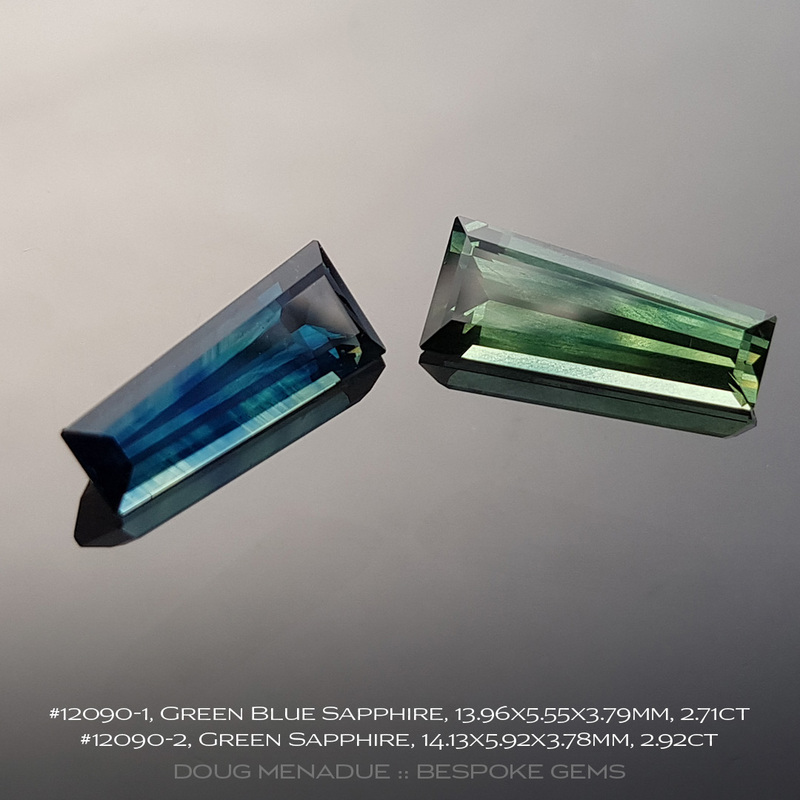 Comments : A superb Australian sapphire with a light green colour that is both bright and intense at the same time. 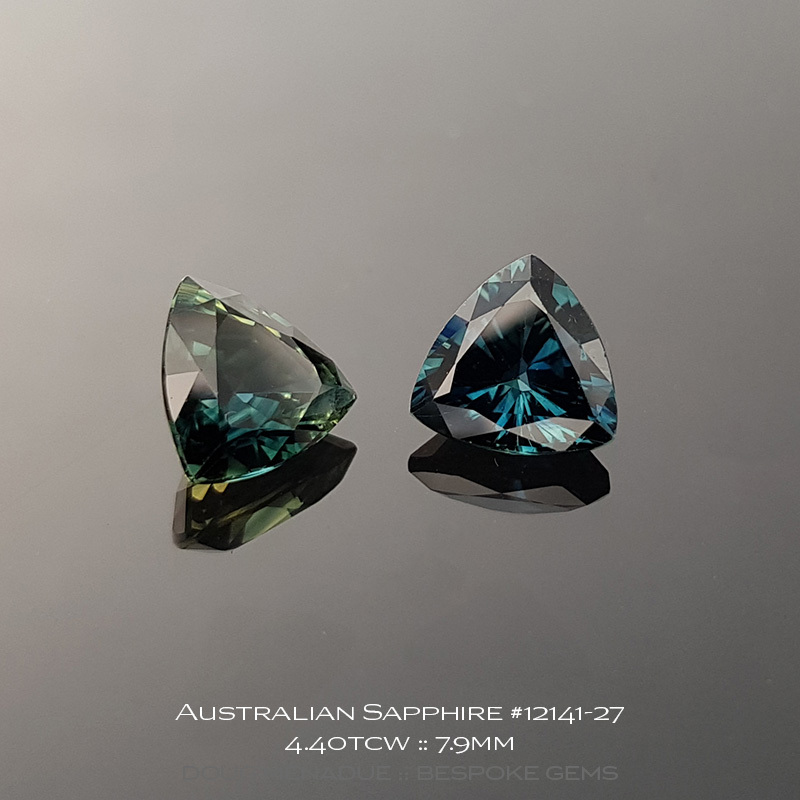 Trillions are one of my favorite styles of cut as they have incredible play and action and are perfectly suited for sapphires. This is a great size for an everyday ring and is a sapphire that I would highly recommend.